DPGM Bro. 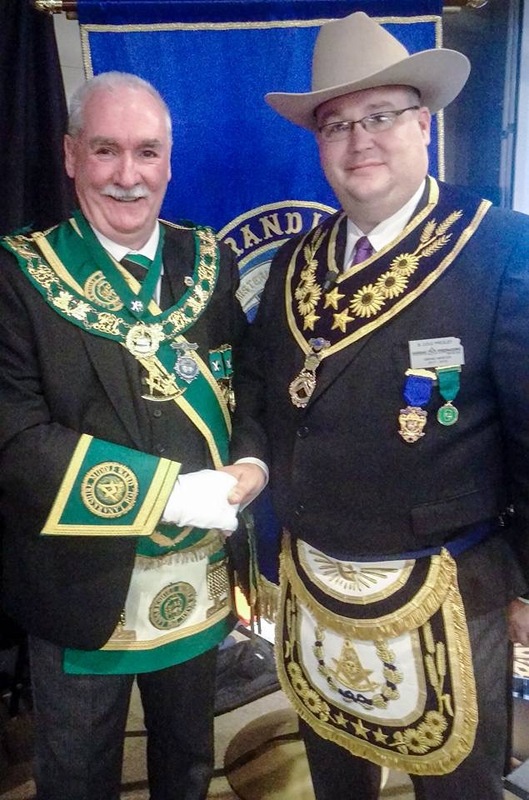 Andrew Millar headed the Provincial Deputation to The Operative Lodge of Airdrie No. 203 . In an excellent Ceremonial Bro RWM. 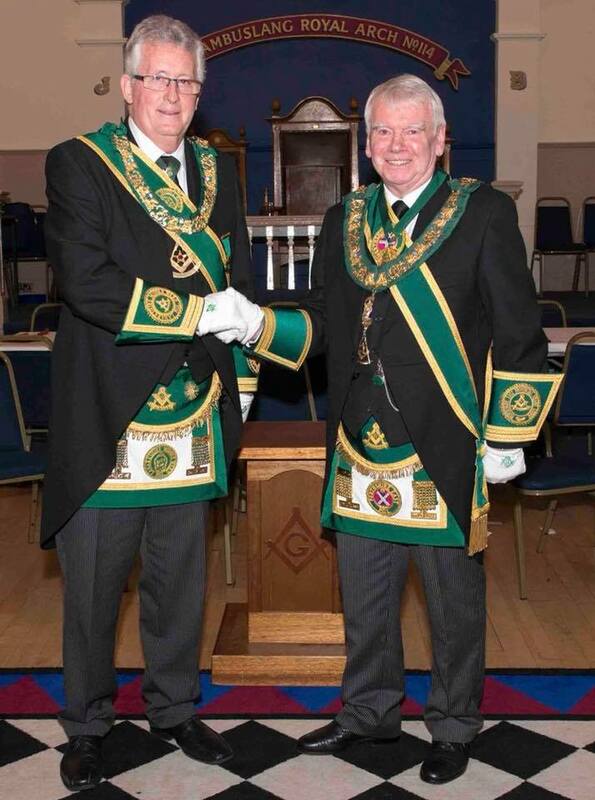 Bro Robert Fraser was Installed as RWM by RWIM Bro. Brian Stewart and RWIM Bro. David Smillie. The Lodge was well supported on the evening by a good attendance of brethren from within and out with the Province. Following the Installation the Deputation joined the Brethren of the Lodge at the festive board and harmony. Bro. 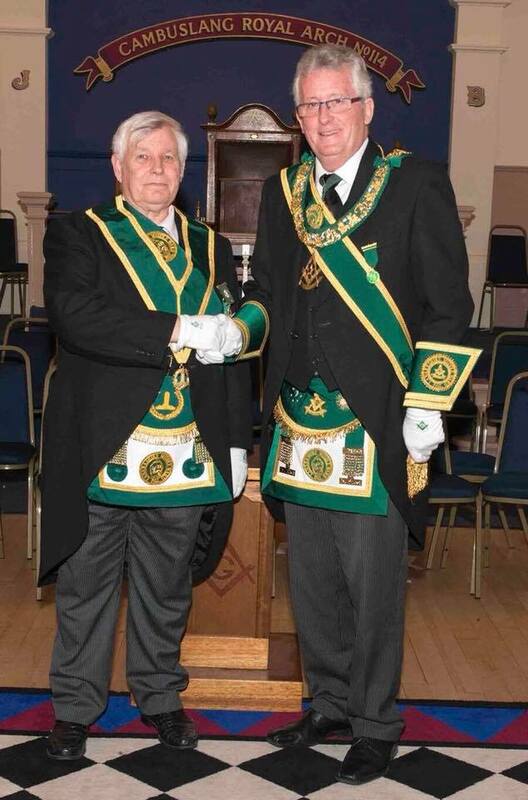 Andrew D. Millar DPGM accompanied by Bro. 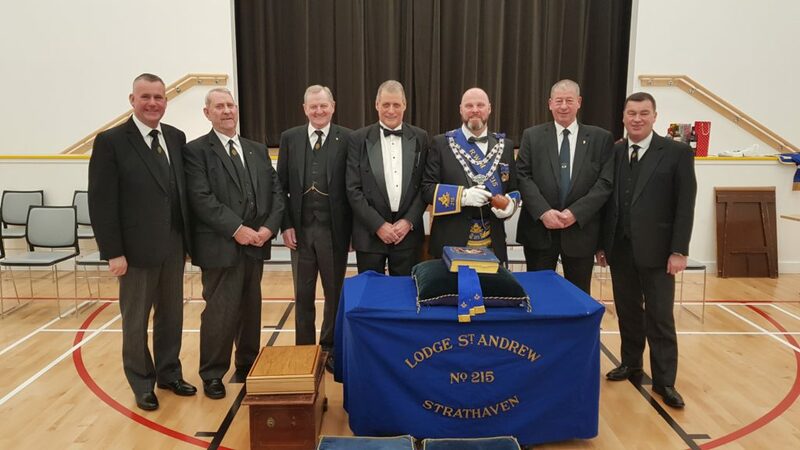 James Shanks PDPGM headed a large Deputation of Provincial Grand Lodge to the Installation of Lodge Airdrie St. John No. 166. Bro. 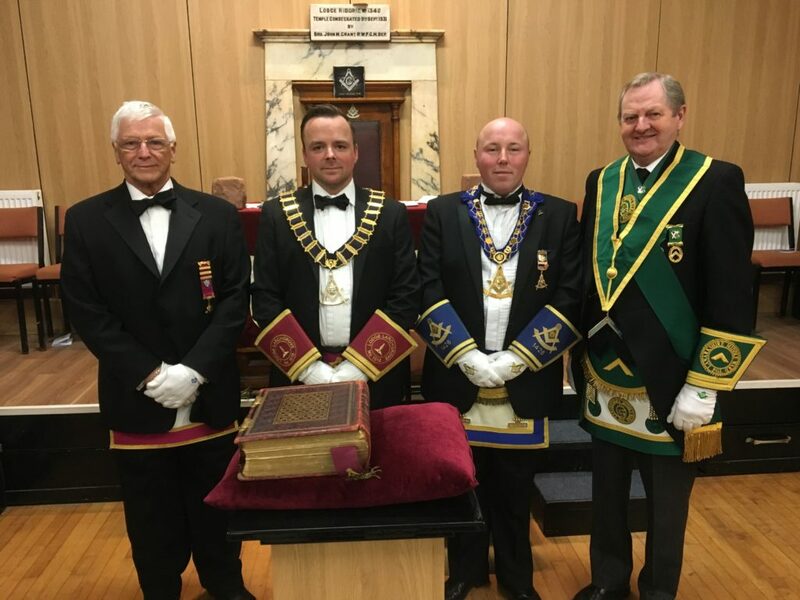 James Ferguson PM carried out the installation of the new RWM, Bro. Robert McCormick PM, who was taking the Chair of the Lodge 10 years to the day and date after he was first installed in 2008. Bro. 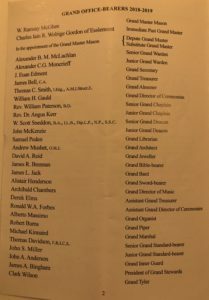 McCormick then proceeded to install the Office Bearers of the Lodge. 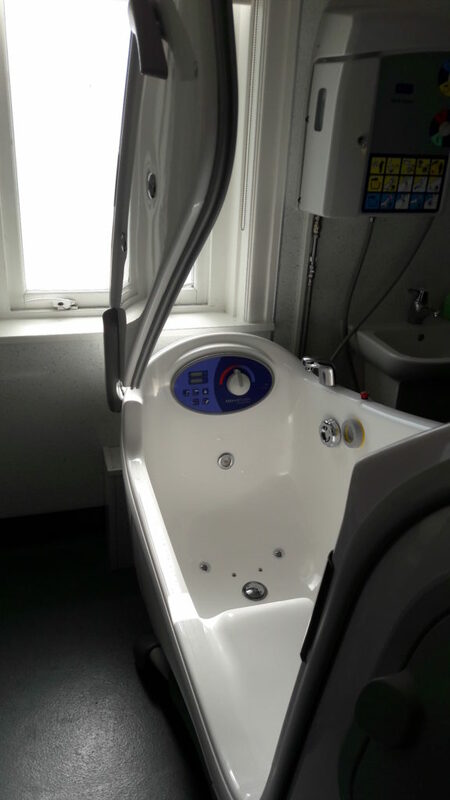 Both carried out their installation duties to a very high standard. The newly installed RWM thereafter bestowed Honorary Membership of the Lodge on Bro. David Truesdale PM Lodge 203 and Bro. 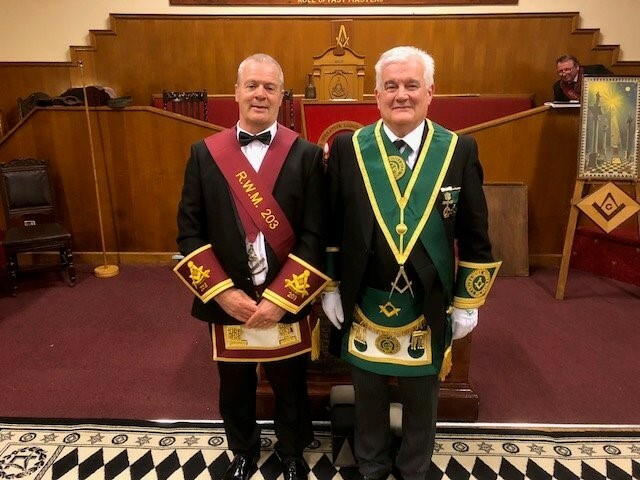 Alan Cowan MM and Organist of Lodge 203. Both of these brethren were well deserving of the recognition as they had been carrying out Installation duties, for Lodge 166, for over 10 years. Following the installation and presentation the PGL deputation and brethren retired to partake in some excellent Lodge hospitality. 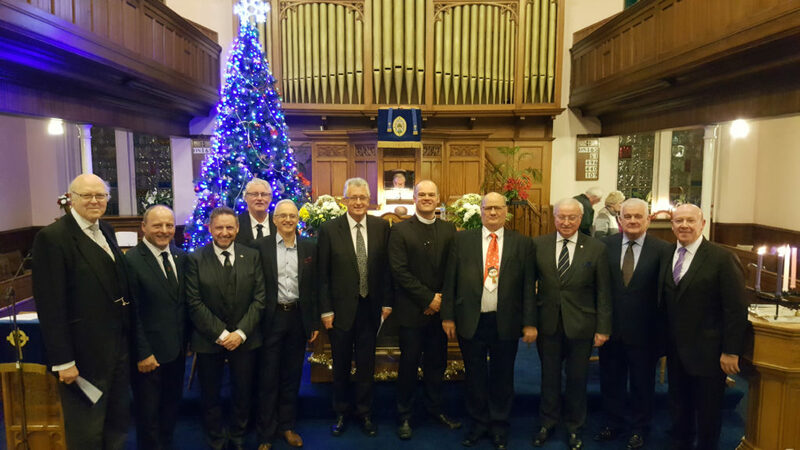 The Annual Carol Service was held for Lanarkshire Freemasons and their families on the 16th December at Airdrie High Kirk. The Service was conducted by the Minister of the Kirk, Rev. 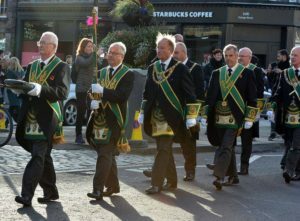 Ian McDonald and was assisted by the Readers from the various Masonic Orders within Lanarkshire. 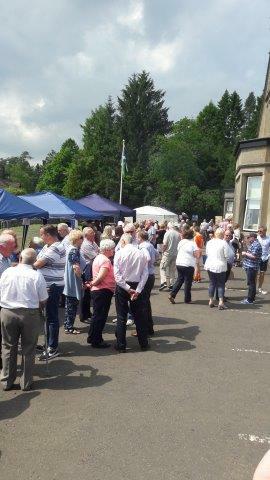 Following the close of the Service, the congregation retired to enjoy some festive refreshments provided by the Church. 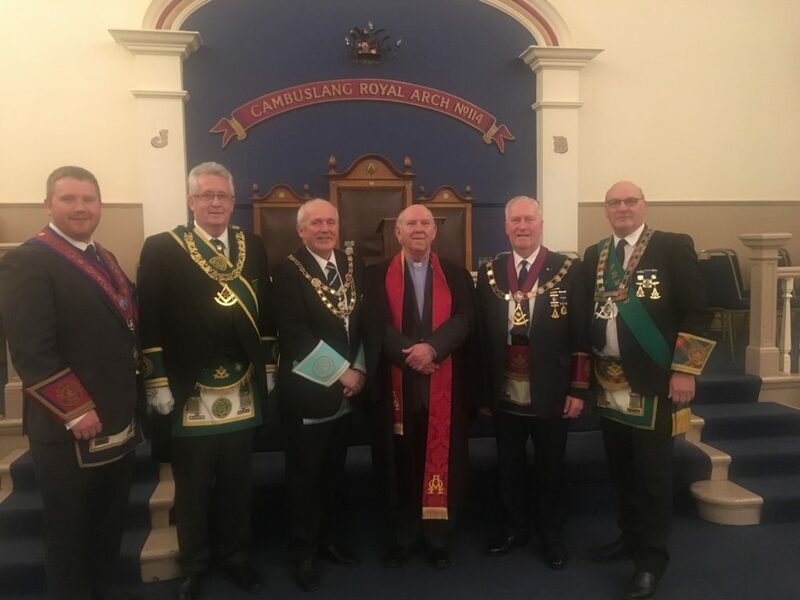 The Provincial Grand Lodge would once again thank everyone for their attendance with special thanks to the Minister, Session and Members of Airdrie High Kirk for allowing us to hold our Carol Service in their beautiful Church. 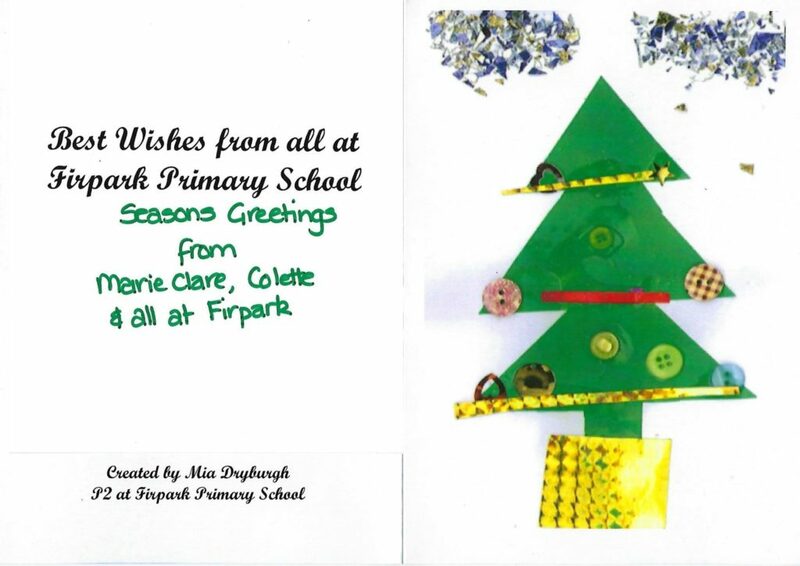 Brethren, see attached a Christmas card received from the Headteacher, staff and pupils at Firpark School, a school which works with children with special educational needs. 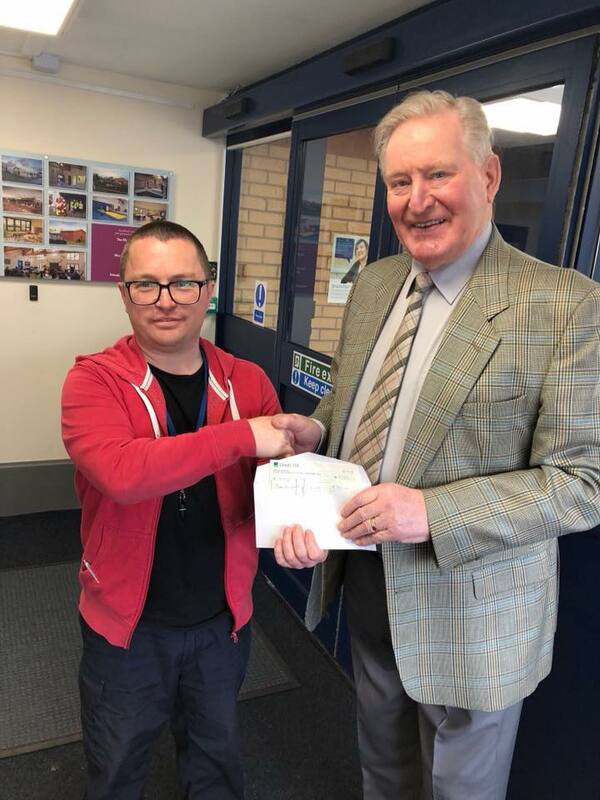 Both PGL of Lanarkshire Middle Ward and many of the daughter lodges have supported the work of the school by making donations to the school over many years. I am sure we all wish the staff and pupils a Merry Christmas and a Happy New Year. DPGM Bro. Andrew Millar headed the Provincial Deputation to the Installation of Lodge Whifflet St. John No. 963. In an excellent Ceremonial Bro. James Durning was Installed as RWM by RWIM Bro. John Clydesdale PM with the Office Bearers being Installed by Bro. Hugh Glen PM. SPGM Bro Stephen Campbell headed the Provincial Deputation to the Installation of Lodge Robert Burns 440. 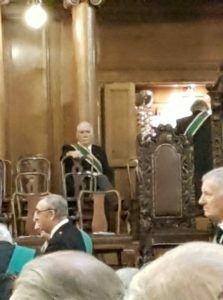 In an excellent Ceremonial Bro Walter McC. 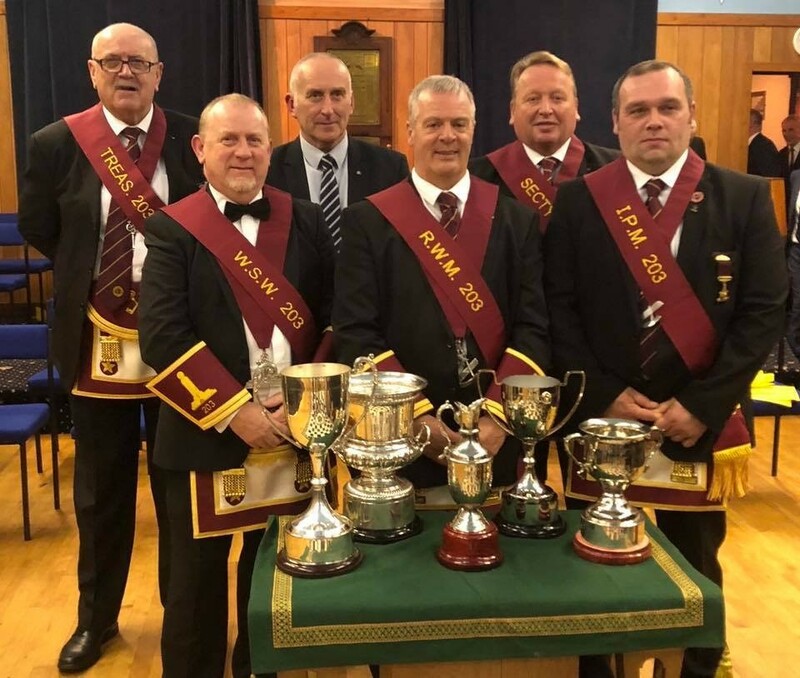 Dunn PM was Installed as RWM by RWIM Bro Walter F. Houston PM with the Office Bearers being Installed by Bro Derek Beaton PM. Following the Installation the Provincial Deputation joined the Brethren of the Lodge at the festive board and harmony to round off an excellent evening. SPGM Bro Stephen Campbell headed the Provincial Deputation to the Installation of Lodge Woodhall St John’s 305. Stephen was accompanied in the Deputation by SPGM Bro Norman Carnegy. In an excellent Ceremonial the RWM Elect Bro Gordon Airns PM was Installed by RWIM Bro Ian McGown PM with the Lodge Office Bearers being Installed by RWIM Bro Colin Gowrie PM. On Wednesday 12th December, RWM Bro. 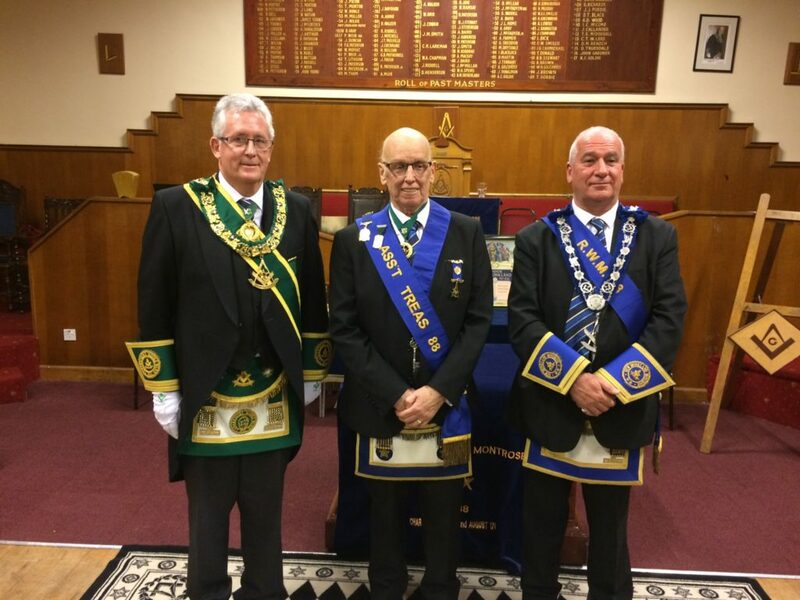 Jim Paisley welcomed a Deputation from Provincial Grand Lodge to The Operative Lodge of Airdrie No. 203. The Past Masters of the Lodge conferred an excellent EA Degree, after which Bro. 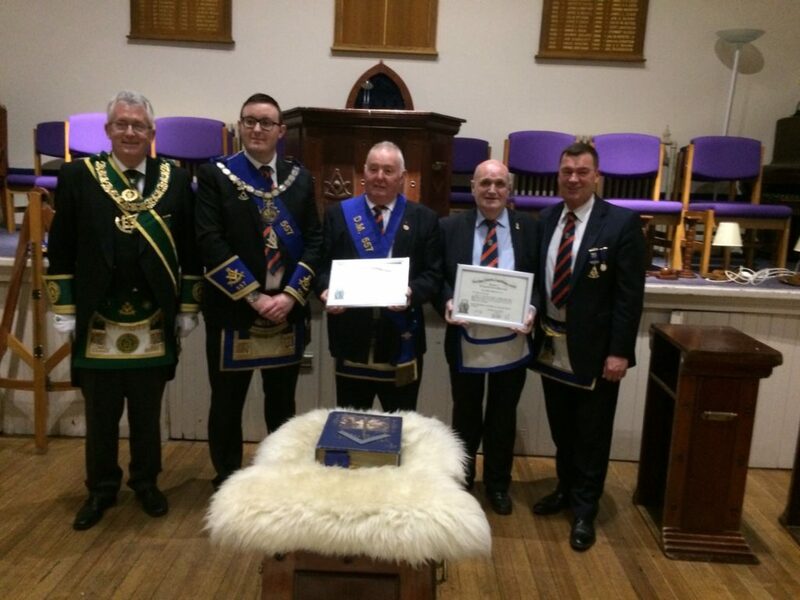 Robert Cook was presented with his Diamond Certificate to celebrate 60 years of service to the Lodge. Bro. Cook thanked the RWM and the Brethren of 203 for the presentation and looked forward to spending many more happy times in the Lodge. 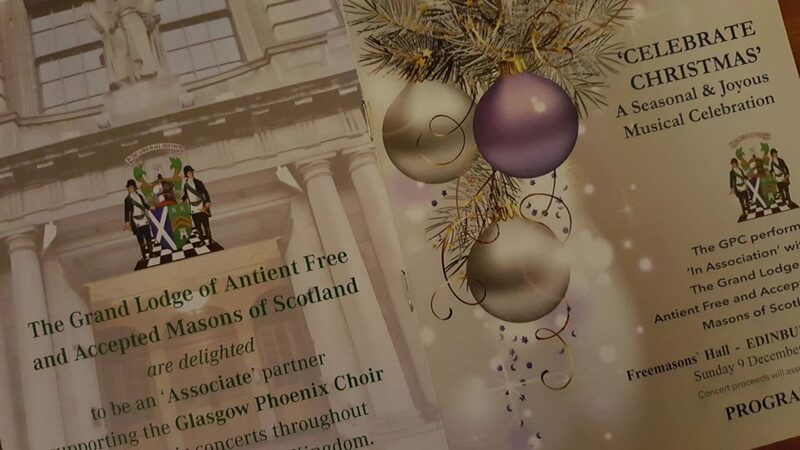 Today saw the Annual Christmas Concert by the Glasgow Phoenix Choir at Freemasons’ Hall in Edinburgh. 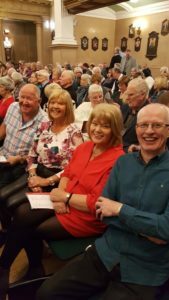 Members of the public joined with Freemasons from all over Scotland and enjoyed an excellent programme of choral music. 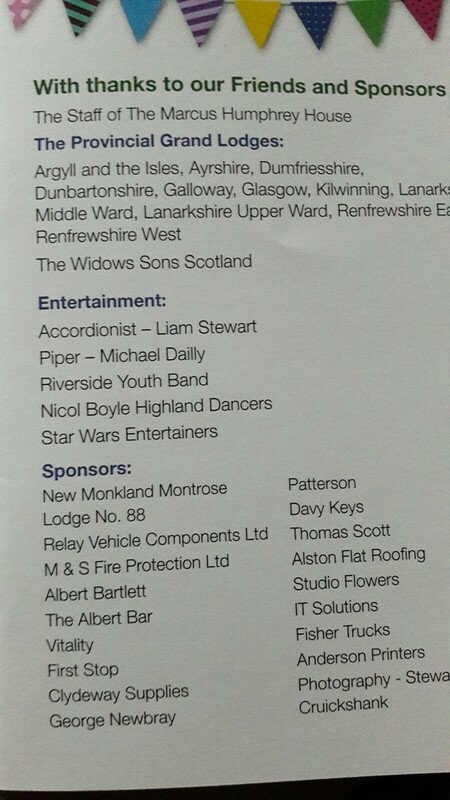 Many members from Lanarkshire were in the audience or assisting with stewarding the event. 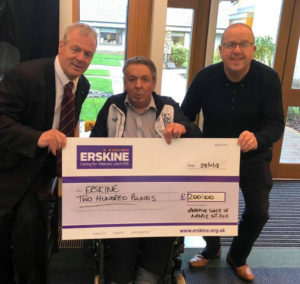 The proceeds of the concert will go to support the work of Erskine. Following the ceremony the Brethren retired to some fine hospitality and speeches in the Company of Lodge Clydesale and visitors, including the visitors from within and outwith the Province including those from Holland. The Installation Programme also included a physical wax seal specially commissioned for the day. SPGM Bro. 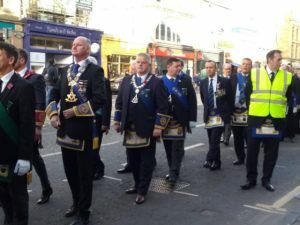 Angus and a large deputation for Provincial Grand Lodge attended the installation of RWM Bro. Phil Biggerstaff and his Office Bearers, the Installing Masters for the evening were Bro. Gary Moorcroft & Bro. Andrew Affleck, both Past Masters of Robert King Stewart No. 919, who carried out the Installing ceremony to a very high standard, this was Right Worshipful Master Phil Biggerstaff’s 2nd term in office. Following the ceremony the Brethren retired to some fine hospitality and speeches in the Company of the Lodge members and visitors. A very large deputation from PGL Lanarkshire Middle Ward, headed by Bro. Bill Perry RWPGM, was accompanied by Bro. 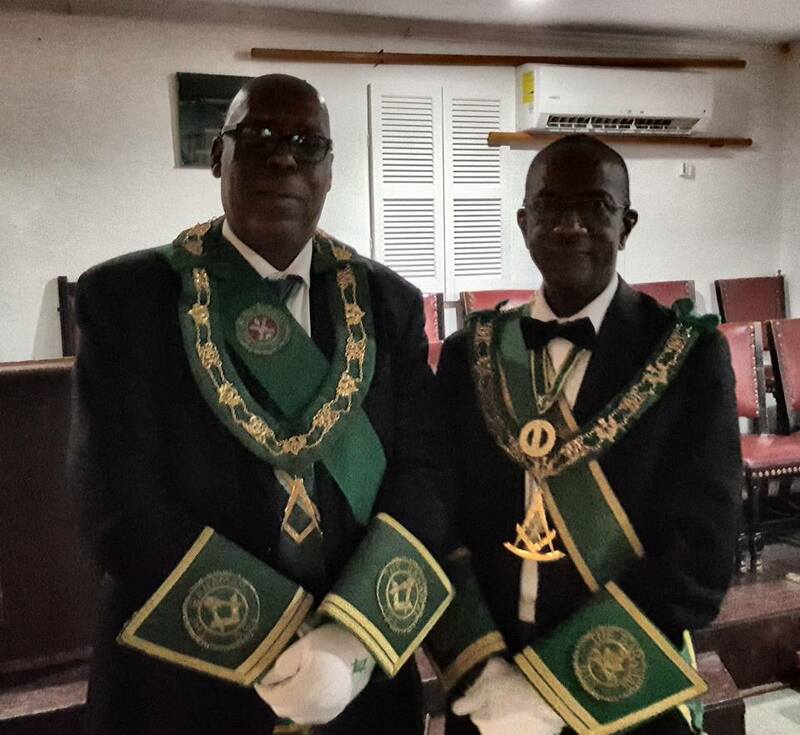 Joseph R Curry, RWDGM and his deputation from the DGL of The Bahamas into the installation meeting of Lodge St. Enoch No.1288. They were warmly welcomed by Bro. Harry Simpson, RWM who tendered the maul as a token of fealty to the RWPGM. Bro. Andrew E Paterson, RW Depute Grand Master was admitted to the lodge and again was warmly welcomed by Bro. Harry Simpson, RWM who tendered the maul as a token of fealty to the RW Dep.GM. 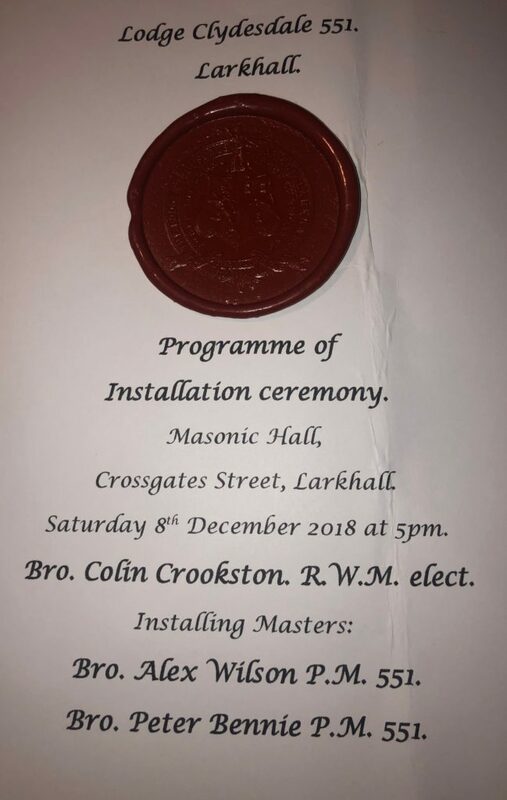 The RW Installing Masters, Bros. Stephen H A Campbell PM and John A. Anderson PM were admitted and proceeded to install Bro. Derek Campbell PM as RWM and the remainder of the officebearers into office in a most competent manner. As one of his first duties the RWM offer the maul to the RWPGM who thanked him and said that he would retain the maul to carry out further business. The RWPGM requested that Bro. 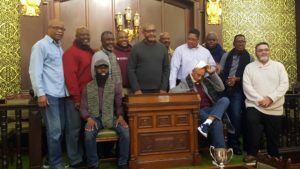 George R Kelly should carry out the ceremonial relating to the Twinning of PGL of Lanarkshire Middle Ward and the DGL of The Bahamas. Bro. Tom Davidson IPPGM and Acting PG DoC presented Bros. Bill Perry and Joseph R Curry in the west of the lodge prior to them taking an obligation on behalf of their respective Province and District after which they both signed the Twinning Agreement following which the Agreement was read out to the assembled brethren. Following this the RWPGM invited Bro. Joseph R Curry to accept honorary membership of PGL of Lanarkshire Middle Ward, he readily accepted. 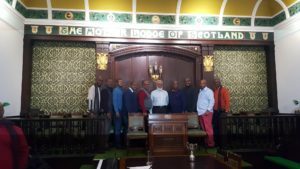 The deputation from DGL of The Bahamas comprised 49 brethren and 21 ladies who had been in Scotland since Monday 26 November. Following the return of the maul, the lodge was closed and the brethren retired to the installation dinner. 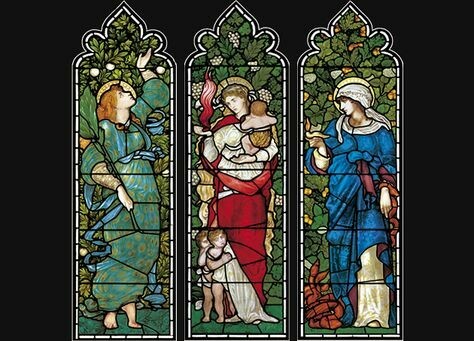 Three stained glass windows from Christ Church Cathedral Oxford with “Faith, Hope and Charity” on them are being raffled at £1 per shot to raise money for the Marcus Humphrey Masonic Home. 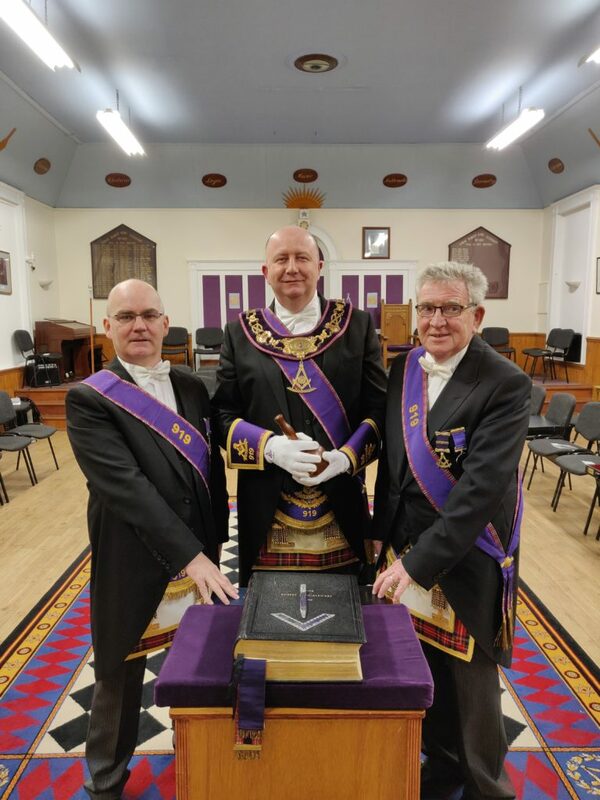 They are each 16”x 5” (400mm x 125mm) boxed and in perfect condition, they have been donated by Bro David Bloomfield PPGM Kilwinning. DPGM Bro. 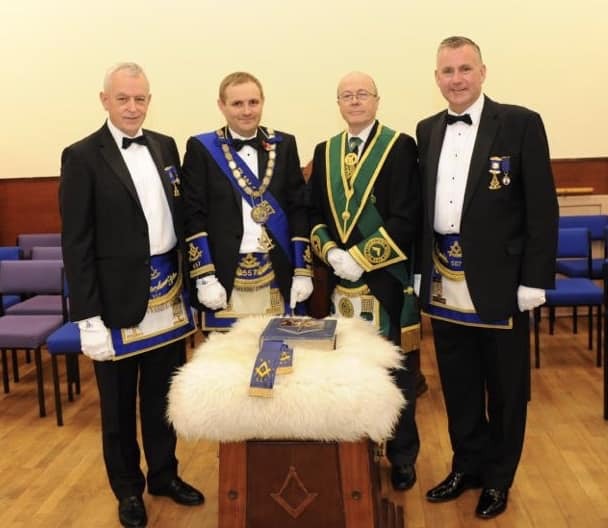 Andrew Millar headed the Provincial Grand Lodge Deputation to the Installation of Lodge Coltswood Glenboig No. 1067. In an excellent Ceremonial Bro. 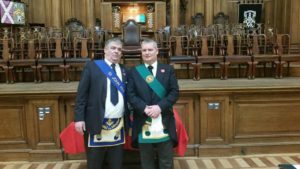 Iain Reid was installed as Right Worshipful Master by Bro. Peter Liggett RWIM along with his Office Bearers being installed Bro. Neil Thomson RWIM. As is customary at Lodge Coltswood Bro. Alain Huppé and Guy Condomines from Lodge 1067 in France attended the Installation Ceremony, with Bro. Alain replying to the Toast to the Lodge delivered by PM Charles Clarke of Lodge 177. Following the Installation the Provincial Deputation joined the Brethren at the festive board and harmony. Right Worshipful Master Bro. Jimmy Paisley has this week been busy delivering cheques on behalf of the Lodge to some very well deserving charities, he is pictured below presenting the following cheques. Fantastic work Brethern, congratulations from all the Provincial Grand Lodge, superb ?? 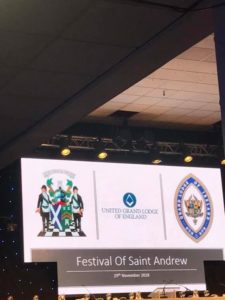 At the Festival of St. Andrew, three distinguished Brethren of the Province were rewarded for their service to the Craft by being awarded Grand Honorary Rank of the Grand Lodge of Scotland by our new MWGMM Bro. Ramsay McGhee at the Festival of St. Andrew. All well deserved after giving many years of service to their Lodges and the Craft. The presentation of jewels and certificates will take place at the Provincial Grand Lodge AGM in January. The Province was well represented at the Installation of the new Most Worshipful Grand Master Mason, William Ramsay McGhee. 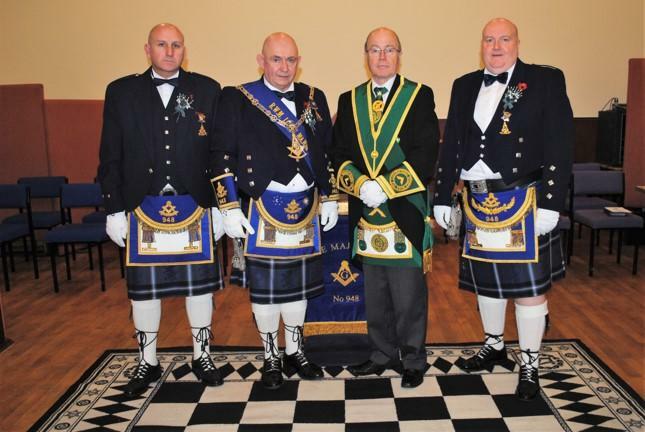 Following the Installation of the Grand Master Mason, the Office Bearers were Installed. Brother William Spencer has also been appointed the Board of Grand Stewards joining Brother Thomas McCrone and Bro. Alexander Hamilton. 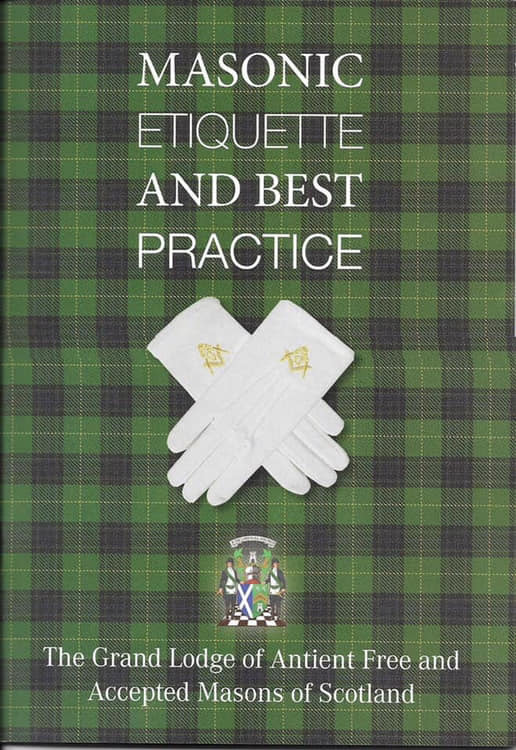 Grand Lodge have published this very informative booklet, buy one for a Brother of the Craft for his Christmas ?, £3.00 a copy. £1.00 of the purchase cost goes to Grand Lodge Benevolence. Bro. 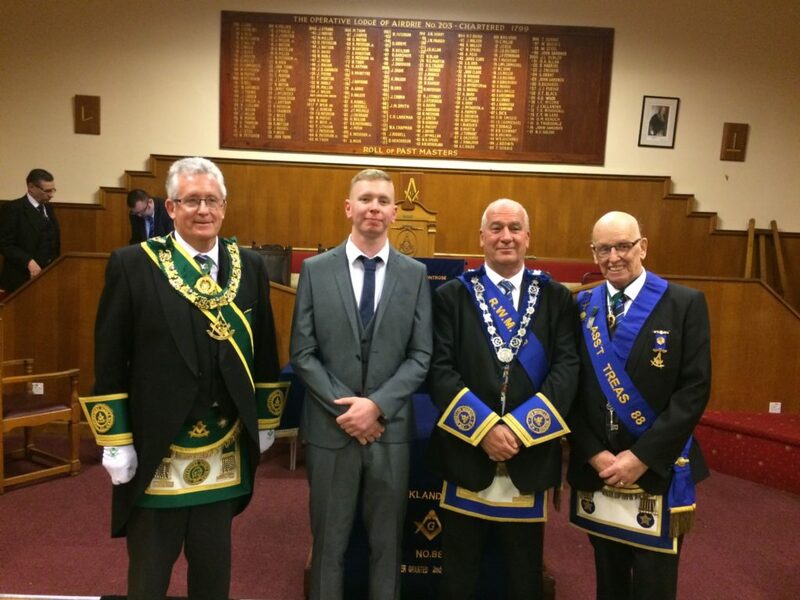 Alex Kelly SPGM and a large Provincial Grand Lodge deputation attended the annual Installation of Lodge Hamilton Kilwinning No. 7 . Bro. John Limerick RWM was installed by Installing Masters Bro. James S. Dorricott P.M. and Bro. James Carruthers P.M. The Lodge was well supported on the evening by a good attendance of brethren from within and out with the Province. Following the Installation the Brethren had a very enjoyable and sociable dinner. Following the Ceremonial the Provincial Deputation joined the Brethren of the Lodge at the festive board and harmony – an excellent day with Congratulations to all. 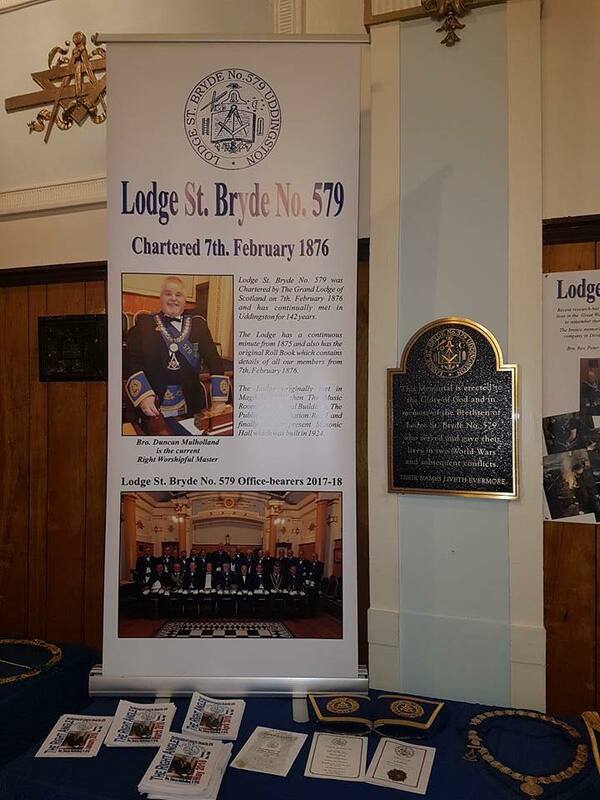 SPGM Bro Stephen Campbell headed the Provincial Deputation to the annual Installation of Lodge St Bryde 579. 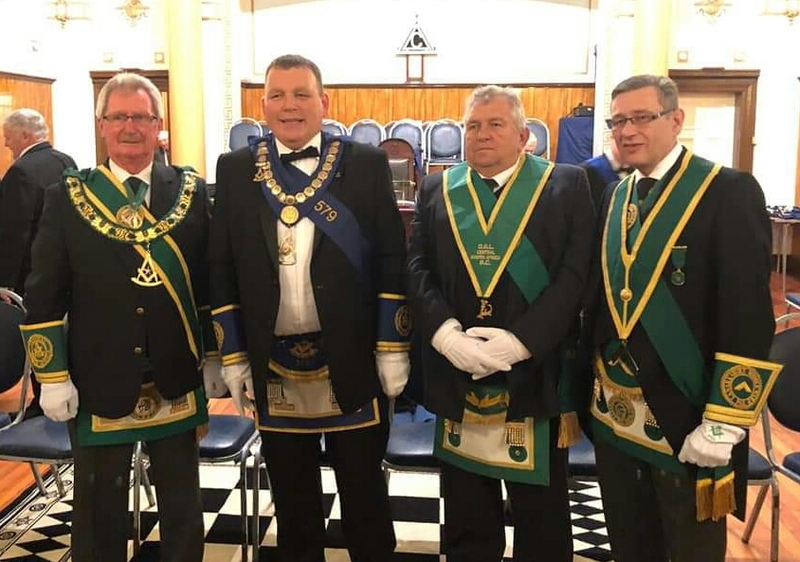 Stephen was accompanied on this occasion by PPGM Bro James L Jack and by two members of the District Grand Lodge of Central South Africa – DGM Bro Jim Kerr and DG Steward Bro Gary Talbot. In a fine Installation Ceremony the RWM Elect Bro Russell Parsons was Installed by PM Bro Alex Hamilton with the Office Bearers being Installed by PM David Shaw. This was Bro. Kenny Bogle’s 10th time being Installed as Right Worshipful Master. At the Remembrance Service on the Lodge where the Lodge donated a substantial cheque to Poppy Scotland that also made another fantastic cheque presentation to Erskine Cares Homes for the sum of £1,100, Erskine offers unrivalled nursing, residential, respite and dementia care in our four homes throughout Scotland for UK veterans and their spouses, more information can be found on their website https://www.erskine.org.uk/about-us/ . After the Service Bro. Gordon Michie of Poppy Scotland was presented with a cheque for £1918. 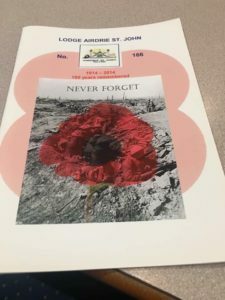 The Lodge has over the year undertaken a variety of different fundraising events culminating in a Remembrance dance on the weekend of Remembrance 2018. Fantastic work by the Brethern and supporters of the Lodge. 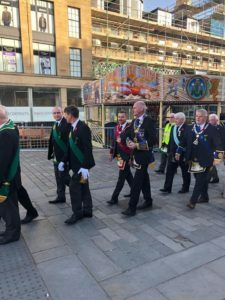 Thursday 15th November 2018 – Lodge Robert Burns No. 440 – Presentation By Bro. 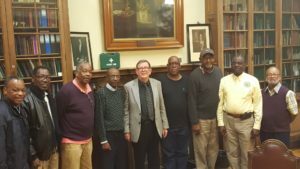 David Ross on Brother William Reid V.C. PRWM, RWPGM, Reigning Master, Past Masters, Worship Wardens, Brethren all. It is my very great privilege and pleasure this evening to present this tribute to a great Scottish hero, a Baillieston man and member of Lodge Robert Burns, Bro William Reid. Bill Reid was in many respects an ordinary man. Born in humble circumstances, who encouraged by his parents to stretch himself academically and by hard work, determination and commitment, forged himself a successful career. He was happily married and had a family. He had a busy and rewarding social life. 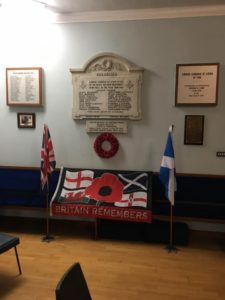 However, world events were to conspire to show that William Reid was no ordinary man, he was a man with extra ordinary tenacity courage and bravery which led him to be Baillieston’s most famous sons and one of Scotland’s greatest war heroes.He was born on 12th December 1921 at 43 Main Street, Baillieston. His home was situated just at the junction of Main Street and Buchanan Street. Bill and his elder brother George were sent to my old school, Swinton Primary School to receive their early schooling. He was a very bright and able pupil. 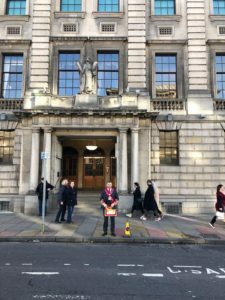 After leaving Swinton he attended the High School in Coatbridge where showed great promise and in normal times would have been expected to continue his education at University. However, the outbreak of war was to see his academic studies put on hold. His older brother George had joined the RAF as a Wireless Operator/Gunner and Bill volunteered to follow his brother George into the RAF as a pilot. Many would apply to be a pilot, seen as one of the glamourous and heroic ways of fighting for your King and Country however, only few would be accepted. Applications were subjected to a rigorous selection process which Bill successfully passed. There was such a demand for training places as pilots that he had to go onto a waiting list. He was enlisted in the Royal Air Force Volunteer Reserve to await his call up papers. He had various jobs during this period including postman in the village. It was an incredibly sad and difficult time for the family with his brother George killed in action over Belgium when his Blenheim bomber was shot down. His father died shortly afterwards. Despite his eagerness to join the fray he had to wait until August 1941 to be finally called to the Aircrew Reception Centre in London. He was initially posted to Newquay before being shipped to New Brunswick in Canada for further training. This subsequently led him to move to California where his training was carried out in civilian clothes as America had not yet entered the war. After months of intensive training and with over 200 hrs flight experience he gained his pilots wings and was commissioned as an officer with the rank Flight Lieutenant and returned to the UK for further training. Bill proved to be an exceptional pilot, not only were his flying skills exemplary he was skilled in the art of navigation which at this time still relied heavily on plotting your course and position with the aid of the moon and stars. His talent was recognised by his trainers and he was asked to remain as instructor. This offer did not meet with his approval, as he had joined to take part in the war, not to remain at home in the relative safety of a training base. 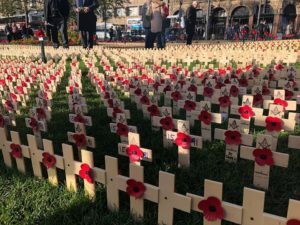 He eventually relented when given the guarantee that if he completed a six-month secondment, he would be transferred to active duty on Lancaster bombers. That posting did not materialise until July 1943, when he was sent to RAF Wigsley, near Newark. His first operational mission was as second pilot, in 9 Squadron, in a raid on Munchen-Gladbach. In September he was posted to 61 Squadron at to commence bombing operations with his own crew. Bill and his crew comprising of flight engineer, navigator, wireless operator, bomb aimer, mid upper gunner and rear gunner who were expected to complete 30 missions before they could expect to be reassigned to other duties. His initial 9 sorties were in his own words “fairly uneventful”. On the morning of 3rd November 1943 along with his navigator Pilot Officer Allan Jeffries he was summoned to a briefing. The large curtains were drawn back to reveal a huge map of Europe with a line of coloured tape running from the bomber base out across the North Sea before turning towards the target, the heavily defended, Mannesmann Steel works in Dusseldorf. P/O Jeffries took copious notes on flight times, positions for course changes which he used to mark up his own charts and maps. Information crucial to the success of the mission. The next task for Flight Lieutenant Reid was to brief his crew after which they would be given time to prepare themselves. 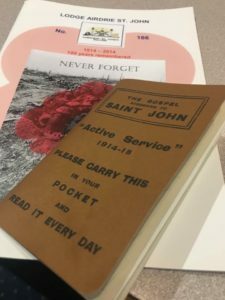 To write “just in case I don’t get back” letters to parents, wives and children, before sitting down together in the mess for their meal referred to by airman as the “last supper”. As darkness fell, the brave crew followed their 21-year-old leader as they climbed into their aircraft Lancaster Bomber LM 360 Designated O for Oboe. 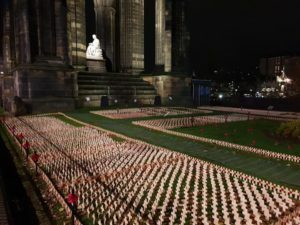 The aircraft trundled down the runway, before disappearing from view into the night sky to take its place in the armada of 600 bombers bound for Germany. As the bomber flew over Holland the cockpit exploded in a flash as a Messerschmitt night fighter raked his plane with machine-gun fire. The rear gunner furiously fought off the Messerschmitt and the Lancaster plunged thousands of feet before being brought under control. Despite the damage sustained to the craft the only casualty was the pilot, Flight Lieutenant Reid. He sustained serious shrapnel wounds to his head, hands and shoulders. The blood poured from his head and face until the cold air froze it solid to his eyelids. ”I felt as if my head had been blown off,” he recalled long afterward. Having confirmed the rest of his crew were uninjured he made the first of a number of remarkable decisions. As the only person capable of flying the craft and given the damage both he and the aircraft sustained at this point he could have made the decision to return to base. He would have been more than entitled to do so and there would have been no question of criticism being levelled at him. He chose not to. Instead he pressed on with the mission, with most of the crew unaware of his injuries. As he pressed on into the dark heart of enemy territory the stricken Lancaster was attacked for a second time. A Focke-Wulf fighter opened up its 13mm cannons and riddled the bomber all along its fuselage. Reid was wounded for a second time, with a wound to the chest and arm, rendering his right arm useless. His navigator was Pilot Officer Jeffries died instantly of his wounds, his radio operator Flight/Sgt Jim Mann aged just 22 was mortally wounded and his flight engineer Flight/Sgt Jim Norris sitting next to Reid in the cockpit was struck in the arm with a cannon shell. The plane’s oxygen supply and hydraulics were crippled. Its compass was destroyed, the port aileron at the tail had been shot off. This is what kept the plane flying straight and level. This meant that the stick had to be pulled back fully just to keep the plane in the sky. His injuries were such that he could not hold the stick to his body and it was only with the assistance of the injured flight engineer using his uninjured arm that control of the aircraft was regained. The damage sustained was critical. The windscreen blown apart leaving the cockpit open to the extreme elements of the stratosphere and the danger of frostbite, the crew using emergency bottled oxygen to breathe, the aileron shot off and the plane barely able to fly, navigator dead, wireless operator dying and the pilot suffering multiple serious wounds and still 200 miles from the target and the heavy anti-aircraft which protected the steelworks Aware that any further damage would likely see his plane fall from the sky, unsure if he could maintain consciousness and in excruciating agony Flight Lieutenant Reid had to make another decision. He decided to proceed to target. When interviewed for the World at War documentary he rather modestly claimed that as all four engines were still operating the decision was an easy one. He would press on and complete his mission. Remarkably he had memorised the navigation notes made by the navigator and felt confident that, if he could stay conscious and the plane kept flying, he would find the target. With the assistance of the flight engineer he managed to keep the plane on the level. 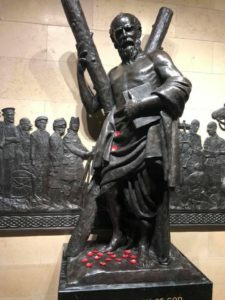 The intense cold had by now frozen the blood seeping from his various wounds and staunched the bleeding saving his life. Lapsing in and out of consciousness the miles slowly passed until he reached maelstrom of anti-aircraft fire over Dusseldorf. Mustering all his energy he flew through the barrage and positioned his aircraft directly above the target. The bomb aimer released the deadly cargo of 500lb bombs which found their target. A photograph was taken by the crew confirming the accuracy of the raid before turning the stricken aircraft from home. Using the Pole Star as a reference, he struck out for home. As the crew left behind the dangers of anti-aircraft fire and fighters over Holland they settled down to what the hoped would be, an uneventful passage over the North Sea to their base. Then, suddenly, all four engines cut out and the plane went into a spin and plunged downwards. Flight Sgt Norris, light-headed through lack of oxygen, had forgotten to open over the valves controlling the reserve tank. The stricken craft plunged towards the frozen North Sea. Their training kicked in and they quickly realised their mistake. The valves were opened, and the engines burst back into full power. Norris then helped Reid bring the aircraft back under control, seconds before it plunged into the North Sea. In the early hours of the morning the lights of the USAF Base at Shipham, Norfolk were spotted. Reid circled and flashed his landing lights to indicate his aircraft was in distress. With the hydraulics useless, the crew had to hand-pump the undercarriage down. As the Lancaster touched the runway the entire undercarriage collapsed. It skidded along the runway for 60 yards before coming to a halt. “Wounded in two attacks, without oxygen, suffering severely from cold, his navigator dead, his wireless operator fatally wounded, his aircraft crippled and helpless, Flight Lieutenant Reid showed superb courage and leadership in penetrating a further 200 miles into enemy territory to attack one of the most strongly defended targets in Germany, every additional mile increasing the hazards of the long and perilous journey home. This tenacity and devotion to duty were beyond praise.” After his recovery and award, he was given a brief period of leave. On 8 June, 1944, he followed Leonard Cheshire, who would also win the VC, to drop a Tallboy bomb on a tunnel, blocking it, to make certain that a Panzer tank Division could not quickly reach the Allied forces which had just landed in Normandy. A mission vital to the success of the D Day landings He was sent out on other missions to destroy U-boats bases, railway marshalling yards, storage dumps and VI flying-bomb sites. On 31 July, his luck ran out. He had just dropped a Tallboy bomb on target over Rheims, when a Lancaster, which should have been fifteen minutes behind him, but due to a navigation error was directly above him, dropped a 12,000lb bomb on his plane. It passed through his bomber, virtually splitting it in half. There was nothing he could do to save the aircraft. As the bomber hurtled into a dive, he managed to bail out with all his crew but was captured about an hour after landing. He was sent to Stalagluft Prison Camp. He was later moved on several occasions as the advance of the allies moved closer Berlin. Eventually, in May 1945, the Americans liberated his POW camp and he was repatriated to the UK and given three months leave. 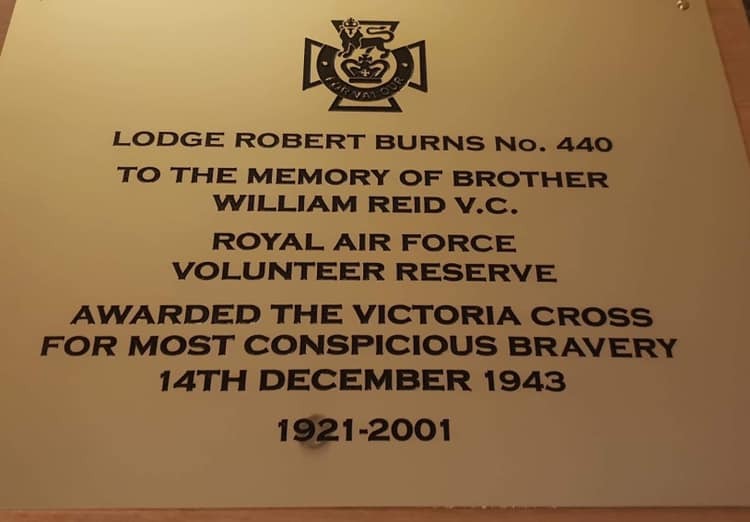 It was during this leave period when on 12 July 1945 Flight Lieutenant Reid VC became Brother Reid when he was initiated into Lodge Robert Burns. He was passed on 2nd August and raised on 30th August 1945. He was proposed by the great John H R Paterson and seconded by and seconded by the lodge secretary John R Taylor. 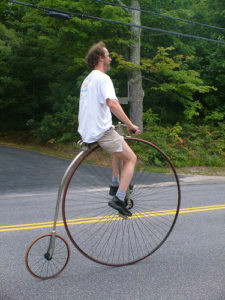 At this time, he was residing at 97 Swinton Crescent. He left the RAF in 1946 and resumed his studies, first at Glasgow University and later at the West of Scotland Agricultural College. He took a deep interest in ex-servicemen’s associations; he was a member of the GC and VC Association, the RAF Association, the standard of Scotland and Northern Ireland we have here tonight. He was the honorary vice-president of the Aircrew Association. 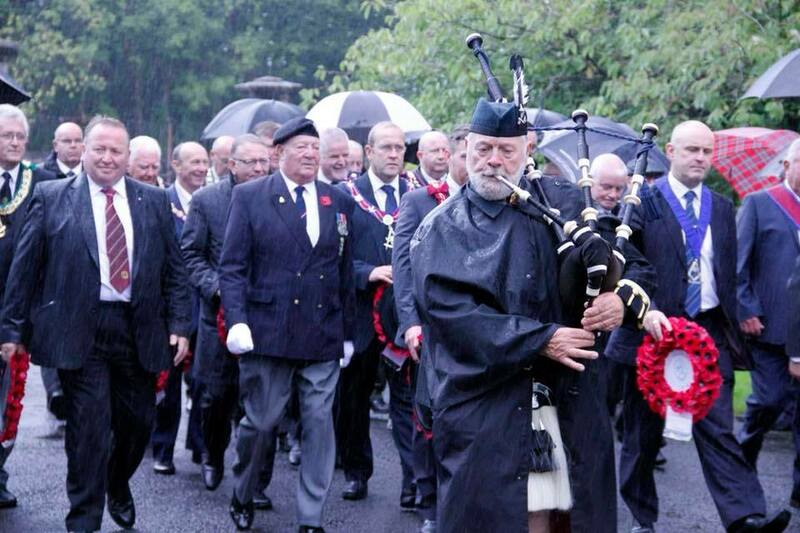 He was president of the Royal British Legion Scotland (Crieff) branch. In 1988 he received another great honour when in recognition of his incredible bravery he was made Freeman of the City of London. Sadly, he suffered from heart problems and on 28 November 2001, Bro William Reid died at the age of 79. He was survived by his wife and their two children. Bill Reid lived a full and remarkable life. Regarding his VC, he always claimed that he had done no more than his duty. What a duty he had been called upon to perform. Tonight as we recognise the courage, tenacity, skill and spirit of this great hero of Scotland we not only commemorating his memory, we also commemorate and give thanks for the lives of Pilot Officer Allan Jeffries and Flight Sgt Jim Mann who lost their lives on the raid. 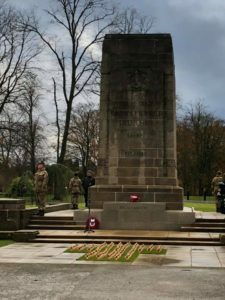 We also honour the memory of the many thousands of brave men of Bomber Command and the countless thousands of other brave service men and woman of all the services who have given their lives in conflicts to protect our country and keep our people free from tyranny and oppression. All of whom are known to and remembered by God, the Great Architect of the Universe. SPGM Bro. 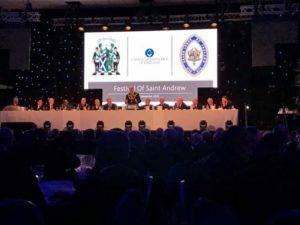 Alex Kelly headed the Provincial Grand Lodge Deputation to the Installation of Lodge St. Andrews Military No. 668. 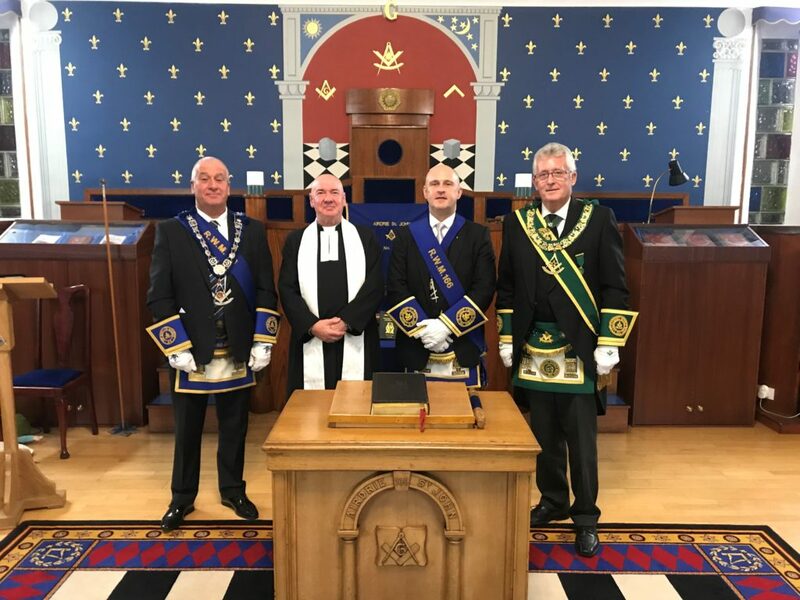 In an excellent Ceremonial Bro David Stewart PM was reinstalled as Right Worshipful Master along with his Office Bearers for the coming year by Past Master Scott Campbell of Lodge Hamilton No. 233 & St. Andrews Military No. 668 Treasurer. 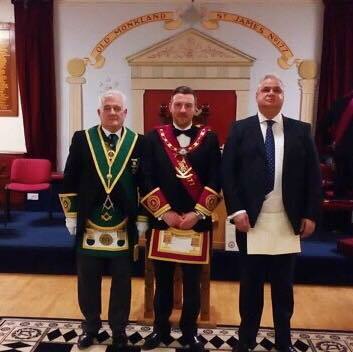 SPGM Bro Stephen Campbell headed the Provincial Grand Lodge Deputation to the Installation of Lodge Garrowhill 1413. 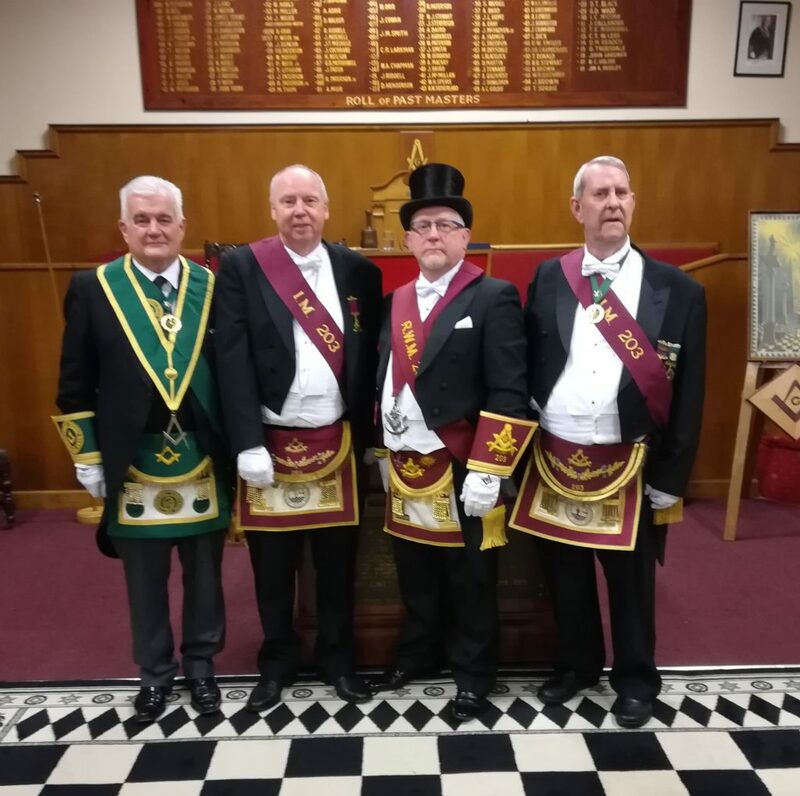 In an excellent Ceremonial Bro John Walker PM was reinstalled as RWM along with his Office Bearers for the coming year by PM’s Kenneth Moir and Jim Alston. Bro. Norman Carnegy SPGM headed a large an distinguished deputation for Provincial Grand Lodge to the Installation of Bro. Ian Grant RWM of Lodge Old Monkland St. James No. 177. Right Worshipful Master Bro. 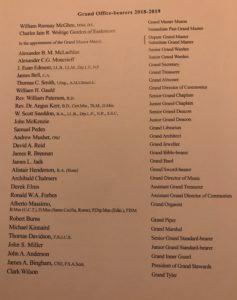 Ian was installed by Bro. Gordon Currie RWIM with the Office Bearers ritual delivered by Bro. Scott Munro RWIM, following a very efficient ceremony the Brethern retired for the official speeches, dinner and harmony. 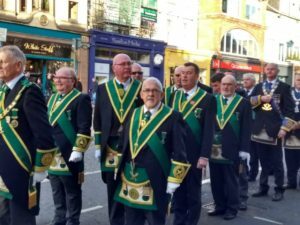 Thursday 15th November 2018 – Lodge Robert Burns No. 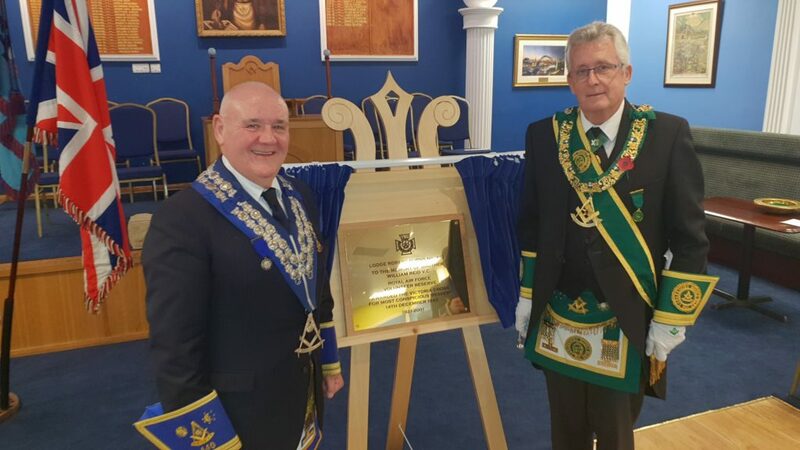 440 – Commemorative Unveiling of Plaque to Bro. 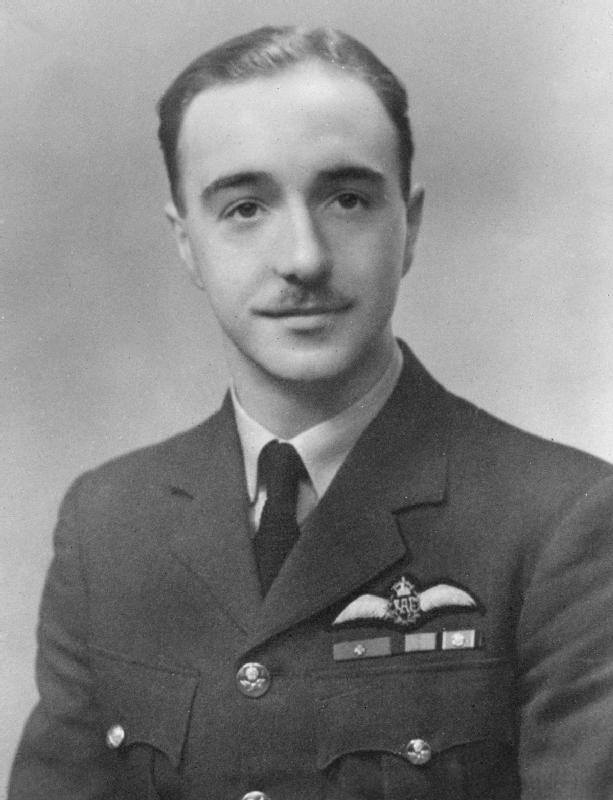 Flight Lieutenant William Reid V.C. RWM Bro. Walter Houston welcome a Deputation from PGL to Lodge Robert Burns No. 440. A Special Meeting was arranged to Dedicate and unveil a plaque to Commemorate Bro. Flight Lieutenant William Reid, a member of Lodge Robert Burns, winning The Victoria Cross in 1943. The Ceremony was conducted by the PGL Chaplains, Bro. Jim Ferguson and Bro. Jim Vasey together with the PGL DOC Bro. Tom McCrone. Bro. David Ross PM also gave the assembled Brethren a very informative talk on the life of Bro. Reid, incorporating a detailed account of his heroic achievement. Bro. Andrew Millar DPGM who was called upon to comment on the Ceremony thanked and congratulated the Lodge on an excellent evening of Remembrance and paid thanks to all who have served their Country during all conflicts. RWM Bro. Duncan Mulholland, welcomed a Deputation from PGL and many visitors to Lodge St. Bryde No. 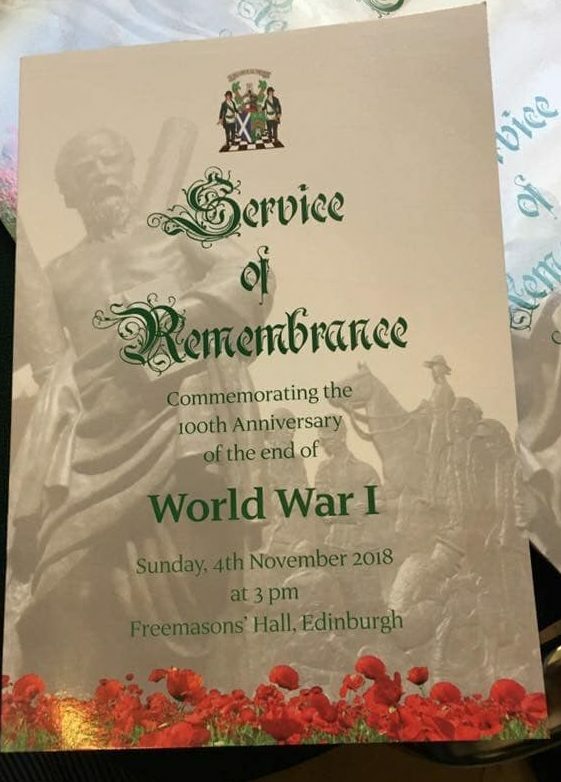 579, to witness a unique Service to Commemorate the Members of the Lodge who had served in the Great War and to the five Brethren who made the ultimate sacrifice. The Ceremony was conducted in a most dignified manner by the Lodge and all are to be congratulated. Special thanks was extended to Bro. David Stark BEM, PGL Piper and to Bro. Alistair Lowe PM 1461, Organist. 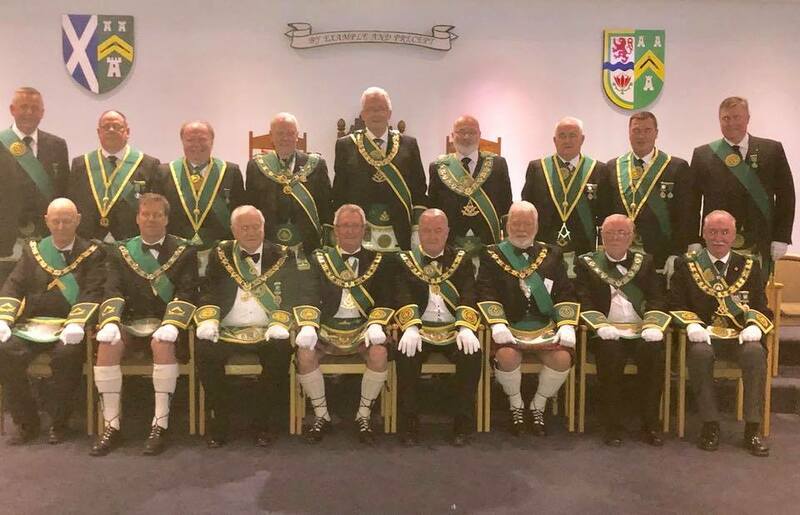 A large deputation of around 40 Brethern from the Province, headed by Bro. 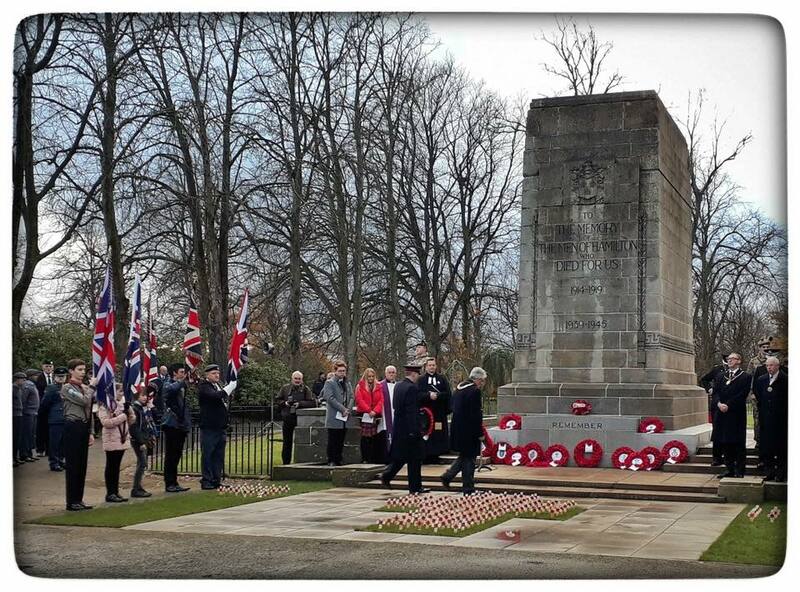 Bill Perry PGM attended the Rememberance Day Service and Parade at the Cenotaph, Bothwell Road, Hamilton. 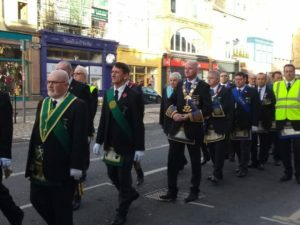 Fourteen Right Worshipful Masters, Members of PGL and Brethren from various Lodges marshalled at the University car park and paraded to the Cenotaph on Bothwell Road under the leadership of Parade Marshall, Mr Ian Forsyth. A Service of Remembrance was conducted by Rev. Ross Blackman of Hamilton Old Parish Church, assisted by Provost Ian McAllan, head boy and girl from Hamilton Grammar School and Father Brian Lamb, St. Joseph’s RC Church, Blantyre. 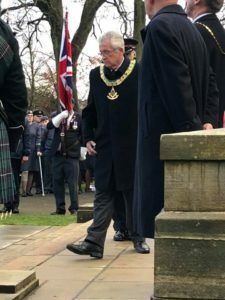 Following the service local organisations and Services Personell were presented and they laid wreaths on behalf of their members while a lament was played by Bro. David Stark BEM and PGL Piper. Following the service the parade made their way to the Council Building where there was a march past of the Officials and Dignitaries. Thanks to all the Brethern for their turnout to this important public event. 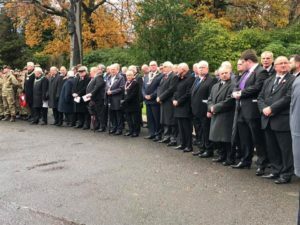 Brethren from the Province were up early this morning to pay tribute along with various pipers to a nationwide Day of Commemorative Events marking the Centenary of the end of the First World War, paying tribute to the millions killed or wounded in battle, and those on the home front who struggled amidst pain and loss to help ensure freedom survived. 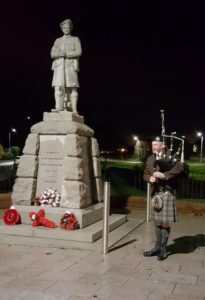 The tributes were numerous Pipers playing at 0600 at various war memorials in the Province. At the VC Memorial in Hamilton a short service was conducted by Rev. John Thomson before the four pipers played “The Battle’s O’er”. 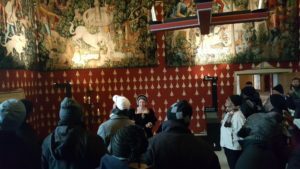 Lady Susan Haughey, Lord Lieutenant of Lanarkshire greeted the 20 to 30 people attending on behalf of Her majesty The Queen. Well done to all for their participation on this very special day. 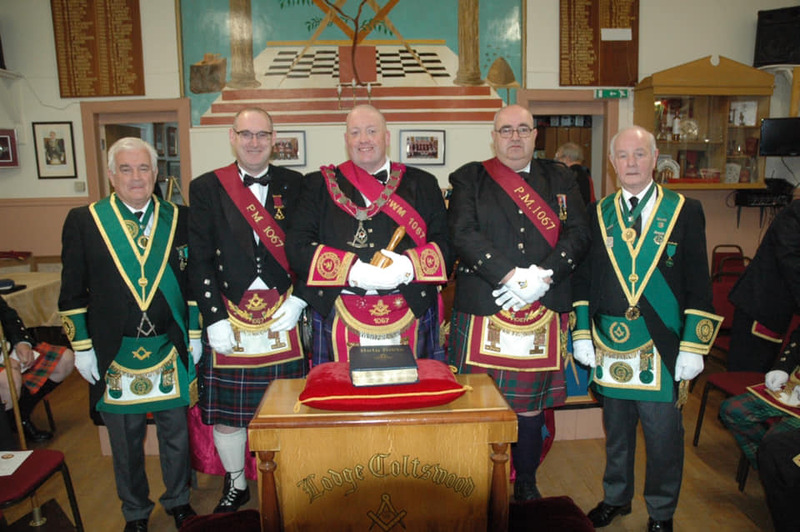 The Annual Installation of the Lodge was held in Blantyre Old Parish Church Hall on Saturday 10th November. Bro. Norman Carnegy SPGM accompanied by Bro. Alex Kelly SPGM headed a large deputation from PGL to the Installation Ceremony. Bro. 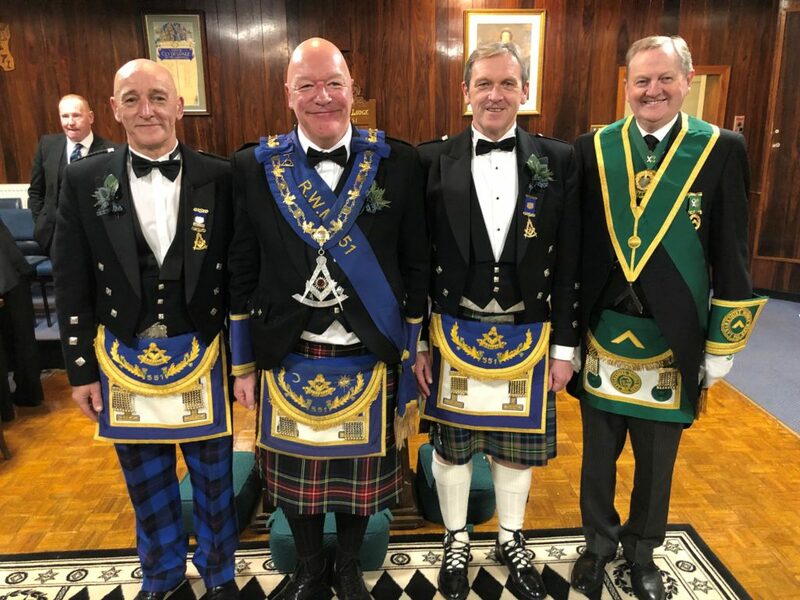 William Gillan and his Officebearers were installed in a fine ceremony by the Installing Masters Andrew Gilmour PM and James Main PM. The brethren then retired to the Lodge and enjoyed Lodge hospitality and harmony. Photo – Andrew Gilmour, William Gillan, Norman Carnegy & Jams Main. 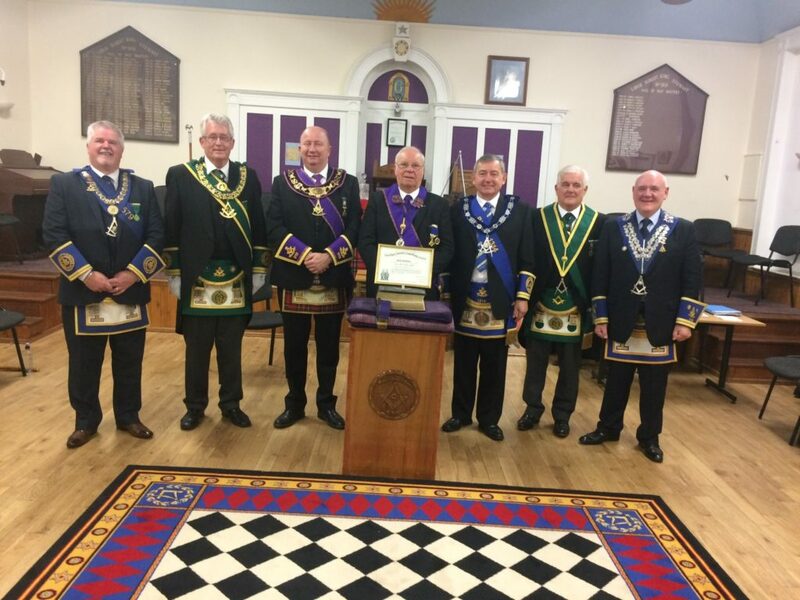 A large deputation headed by Depute Provincial Grand Master Andrew Millar attended Lodge Buchanan to made presentation of 50yr diplomas to celebrate the distinguished and hard working masonic careers of Bro. Bill Craig and Bro. Jim Munro. 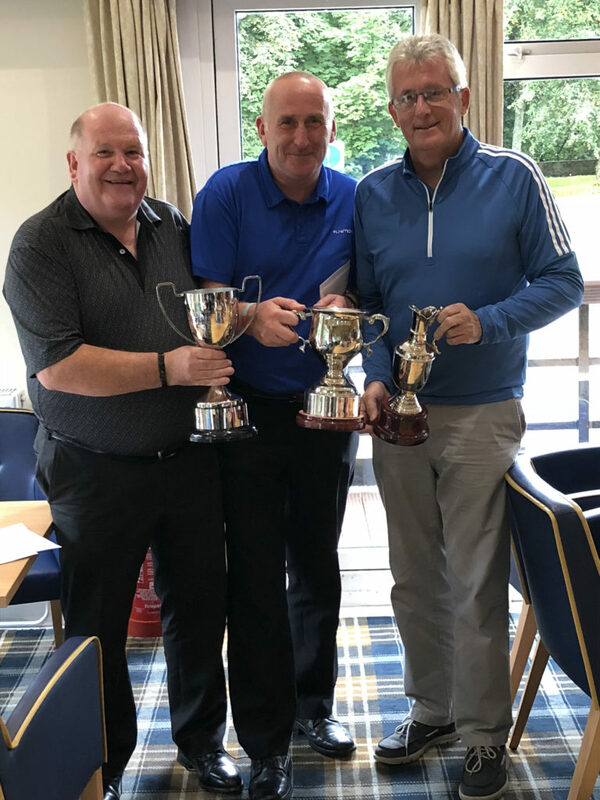 The presentations were made by RWM Derrick Stibbs assisted by Depute PGM Andrew Duncan Millar and Past PGM’s George R. Kelly and Kenneth D. Kennedy. Well done to both Brethren for their long service to the Craft. 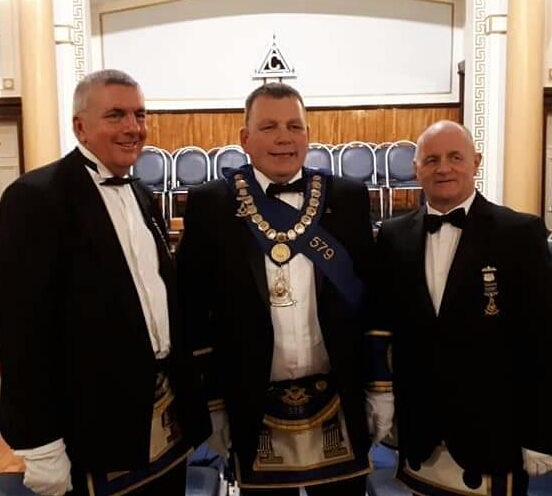 Saturday 3rd November SPGM Stephen Campbell headed the Deputation from Provincial Grand Lodge to the Installation of Lodge Heatheryknowe 1461 to witness the re-installation of Bro Stewart Muircroft as RWM. The Installing Masters, who were both excellent, were PM Alistair Lowe and PM Danny Miller. 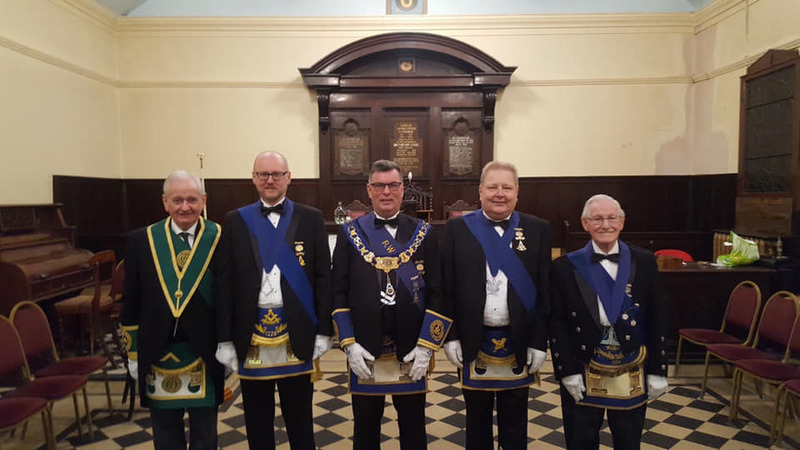 Following the Installation Ceremony the Provincial Deputation joined the Brethren of the Lodge at the festive board and harmony. 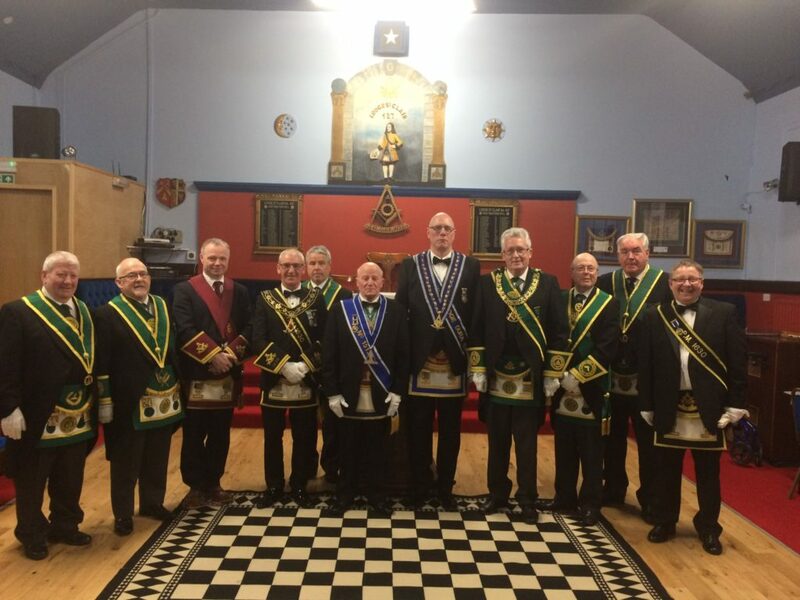 The Annual Installation of the Lodge was held in Blantyre Old Parish Church Hall on Satuday 3rd November. Bro. Norman Carnegy SPGM accompanied by Bro. Alex Kelly SPGM headed a large deputation from PGL to the Ceremony. Bro. 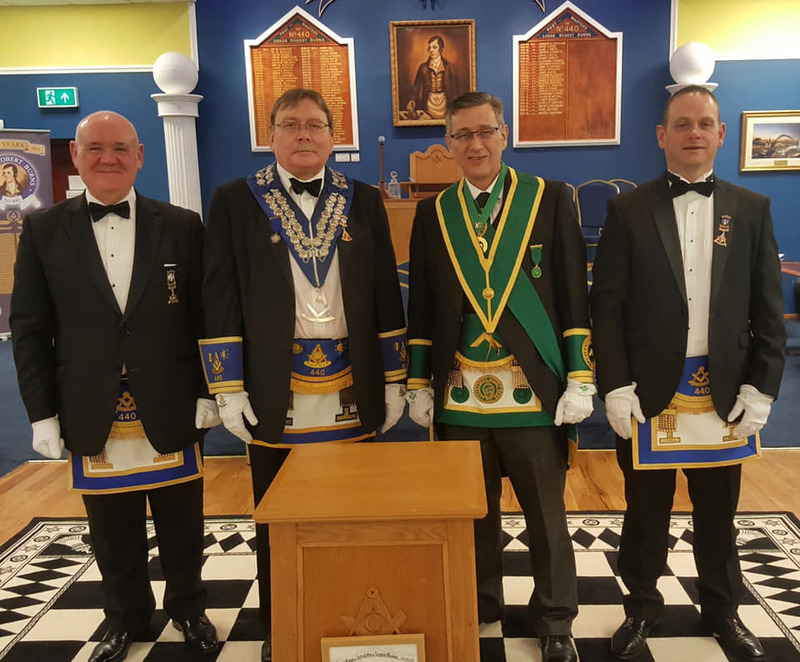 Angus Herron and his Officebearers were installed in an enjoyable ceremony by the Installing Masters Malcolm McCormack PM and Stephen Morley PM. Afterwards the brethren retired to the Lodge and enjoyed a fine harmony. L to R – Malcolm McCormack, Angus Heron, Norman Carnegy and Stephen Morley. Air Ministry, 14th December, 1943. Acting Flight Lieutenant William REID (124438), Royal Air Force Volunteer Reserve, No. 61 Squadron. Steering by the pole star and the moon, Flight Lieutenant Reid then set course for home. He was growing weak from loss of blood. The emergency oxygen supply had given out. With the windscreen shattered, the cold was intense. He lapsed into semi consciousness. The flight engineer, with some help from the bomb-aimer, kept the Lancaster in the air despite heavy anti-aircraft fire over the Dutch coast. The North Sea crossing was accomplished. An airfield was sighted. The captain revived, resumed control and made ready to land. Ground mist partially obscured the runway lights. The captain was also much bothered by blood from his head wound getting into his eyes. But he made a safe landing although one leg of the damaged undercarriage collapsed when the load came on. His version of events is much more modest and can be seen in the World at War programme from 23.10. The deputation was headed by Bro. Tom Davidson IPPGM and included Bros. Angus G Ross and Norman M Carnegy SPGMs, Bill Craig PG Secretary, James O Ferguson and James Vasey PG Chaplains and a futher six brethren. The ceremony of dedication was carried out most expertly by Bros. James O Ferguson and James Vasey, ably assisted by Bro. Tom McCrone PG Director of Ceremonies. Following the dedication of the new regalia, Bro. Tom Davidson invested Bro. William C Andreson, RWM with his regalia on behalf of all the officebearers. 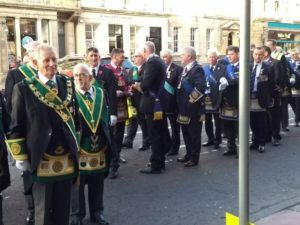 The new regalia was part of the preparations for the lodge’s celebrations to mark the start of the 250th year of the lodge which will be formally celebrated on 9th February 2018 when a deputation from The Grand Lodge of Scotland, PGL of Lanarkshire Middle Ward, Sister lodges and friends will gather for the Ceremony of Re-dedication of the lodge. 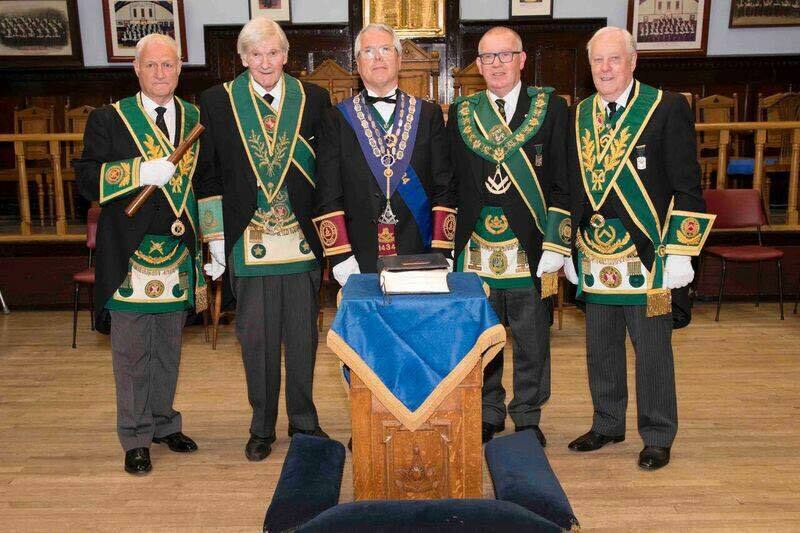 Following the meeting the brethren retired to harmony. 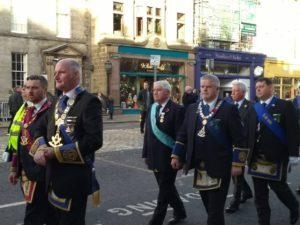 A large number of Brethren from the Province joined with Brethren from all over Scotland to commemorate 100 years since the end of the First World War, the Brethren led by The Grand Master Mason and a pipe band paraded in large numbers through Edinburgh to Grand Lodge, where, a very thought provoking sermon was delivered by Brother Canon Joseph J Morrow, who paid tribute to those who lost their lives and those who had served and continue to serve to protect our freedom. A very poignant moment in the Freemasonry calendar in this very special year. 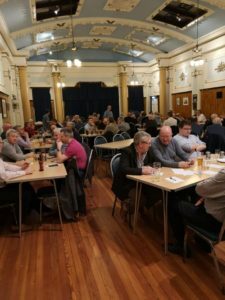 The fourth PGL Annual Quiz night was hosted this year by Lodge St Bryde No.579 in the temple in Uddingston. 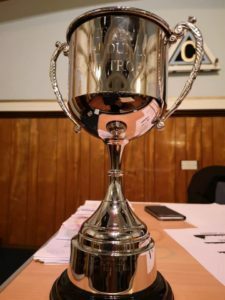 In the first three annual quizzes the winners had been Lodge Robert Burns No.440 and many lodges were seeking to break this winning streak. 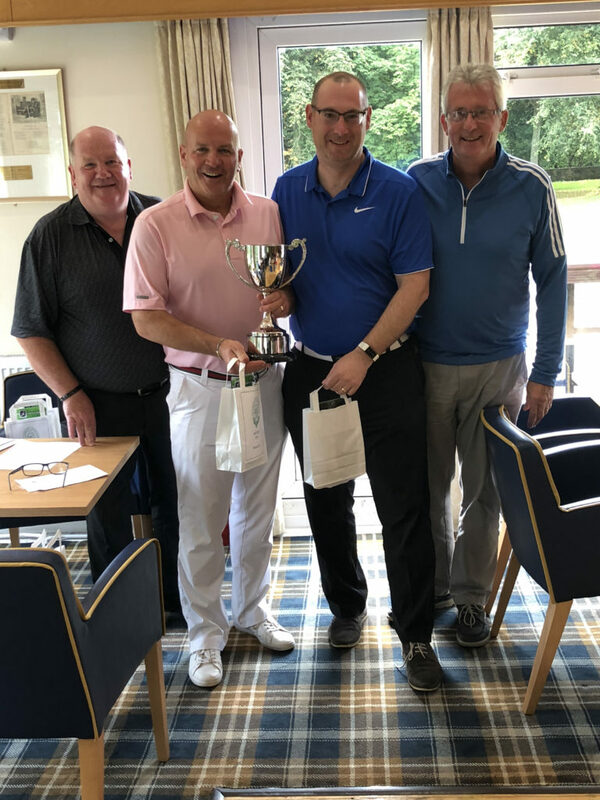 The event was again well attended with about 20 teams, including some first time entries, competing for the silverware, the Alistair Dunlop Trophy. Bro. Bill Craig, PG Secretary, welcomed the teams to the quiz before handing over to Bro. Tom Davidson the quizmaster for the night. The quiz was to be contested over six rounds testing a broad spectrum of the teams knowledge. 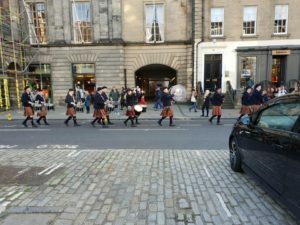 After the first three rounds it looked as though this was going to be four in a row for Lodge Robert Burns No.440 had a lead with three other lodges about four pounts behind. 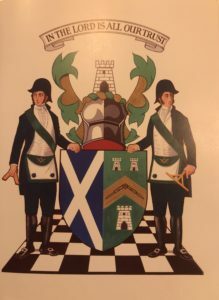 The next two rounds on Sport and Masonic Knowledge brought about a change in fortunes giving Lodge Kirkhill No.1230 a small lead over Lodge Robert King Stewart No.919. The final round on Silhouttes of World Cities saw a further change that gave Lodge Robert King Stewart the victory. Congratulations to Lodge Robert King Stewart No. 919 who were this years winners. The trophy was presented by Bro. Norman Carnegy SPGM who then gave a vote of thanks and thanked the brethren for the £600 raised on the night for charity. 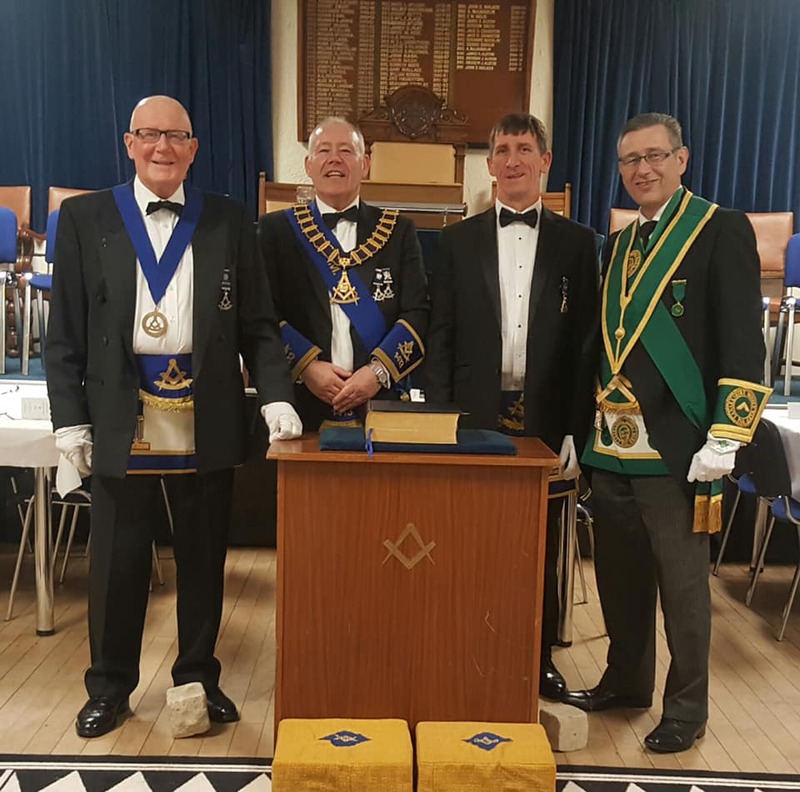 Thanks are due to Lodge St.Bryde No.579 for the way they hosted the event, Bros. Bill Craig, Norman Carnegy, Tom Reid and David Paterson for their administration of the event on the night. Well done all. 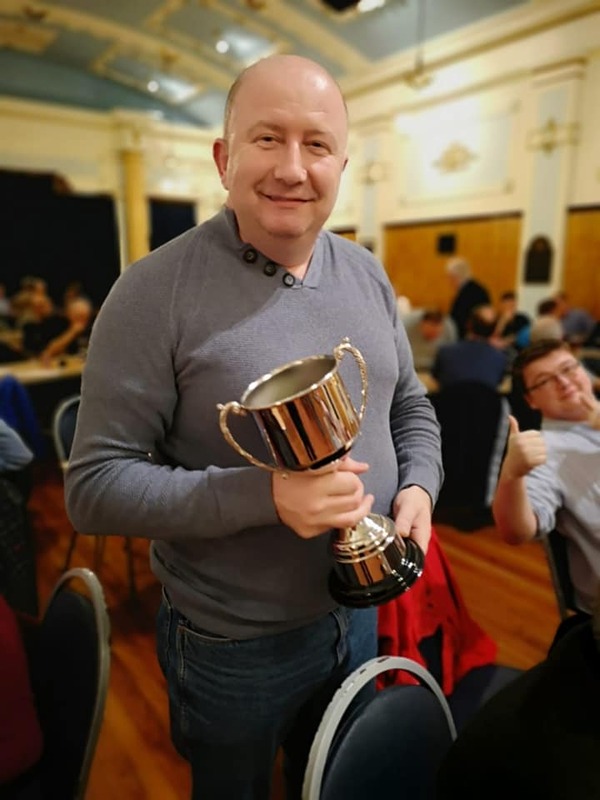 As usual it was a great night with fun and laughter, well done to the quizmaster in his organising yet again, such a great event in our calendar. Bro. Tom Reid, who has run many Whisky Draws over the years, announced the winner of the latest draw which raised another £100 for charity. The winner was a brother from Lodge Robert King Stewart No.919. 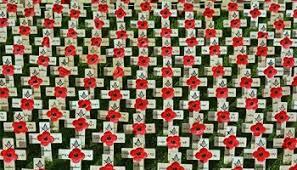 The 11th November 2018 sees the 100th anniversary of the end of WW1. The Battle’s Over is an organisation which has organised various ways of marking this special date with bonfires, beacons, buglers and pipers involved. 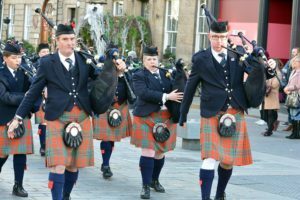 Over 1000 pipers will be involved throughout the world will commemorate the day by a piper playing “THE BATTLES O’ER” in towns and villages at 6.00am. Locally our P.G. Piper, Bro. David Stark B.E.M. 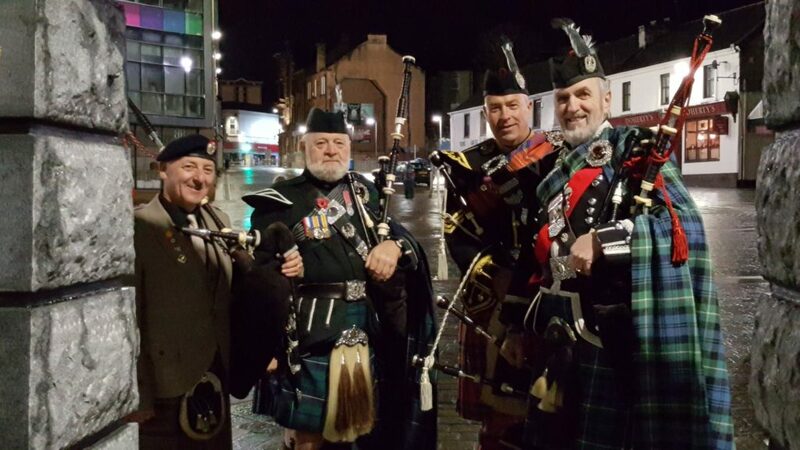 will join with Duncan Brown and Derek Owen to play at the Victoria Cross Memorial in Hamilton (at the top of the steps beside ASDA) at 6.00am on Sunday 11th November 2018. 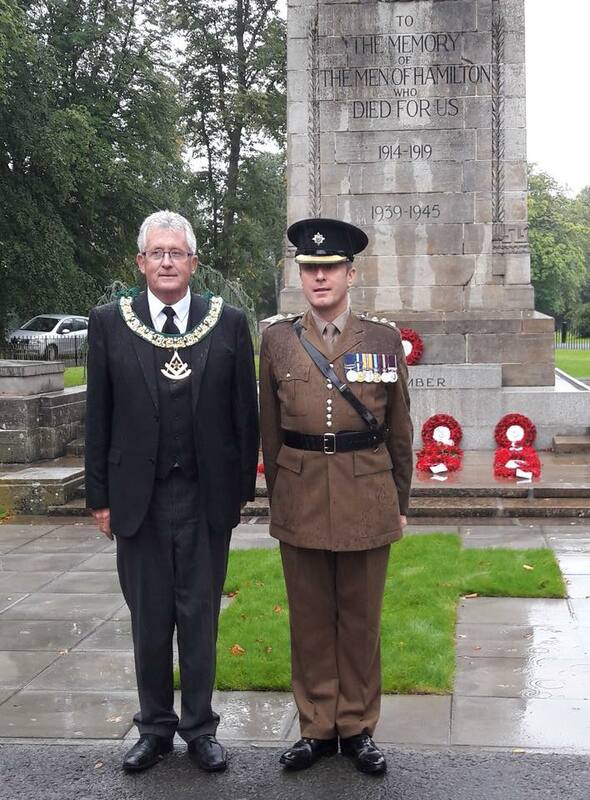 Iain Reid RWM Elect from Lodge Coltswood Glenboig will also play at the Glenboig War Memorial. 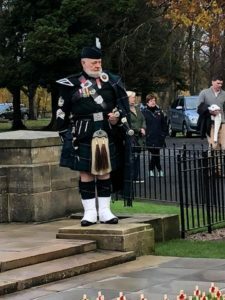 Other pipers will mark the event by playing at the Cenotaph in Larkhall, the War Memorial opposite the Bothwell Bridge Hotel and the War Memorial beside Uddingston Old Parish Church. 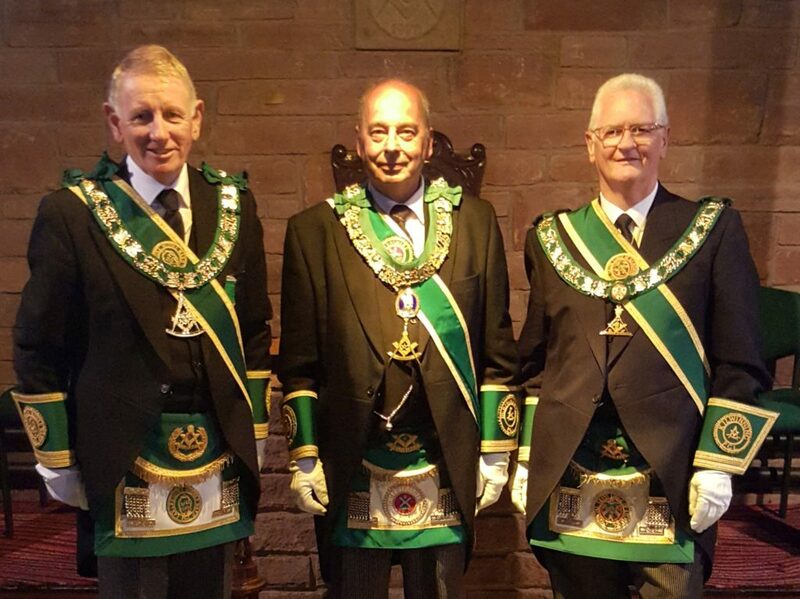 The Annual Installation of the Lodge was held in Blantyre Old Parish Church Hall on Friday 26th October. Bro. Norman Carnegy SPGM headed a fine deputation form the PGL including Bro. George Kelly PPGM, Bro. Tom Davidson PPGM, Bro. Andrew Duncan DPGM, Alex Kelly SPGM and James Ferguson Sen PG Chaplain. Bro. 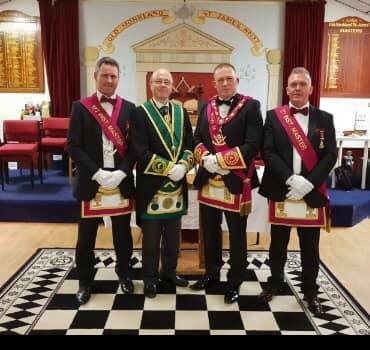 Andrew Faichney and his Officebearers were installed in a fine manner by Installing Masters James Clark PM and Gordon Mather PM. Following the ceremony the brethren retired to the Lodge and enjoyed an evening of hospitality and harmony. Will the Brethren who have requested tickets for the Service please note that tickets will be sent to your Lodge Secretary for collection in the next couple of days. 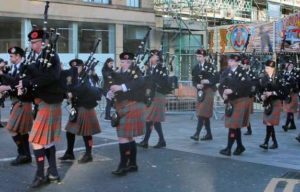 The march will be from Castle Street along George Street around the Roundabout and back to Grand Lodge and will be led by a Pipe Band. 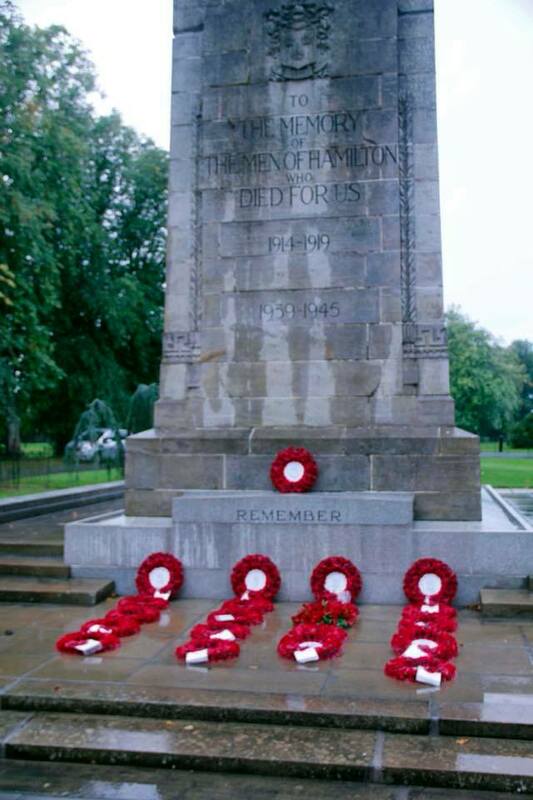 Provincial Grand Lodge have again been invited by South Lanarkshire Council to participate in the Service of Remembrance for the fallen, there will be a short parade, weather permitting to the Hamilton Cenotaph, Bothwell Road. 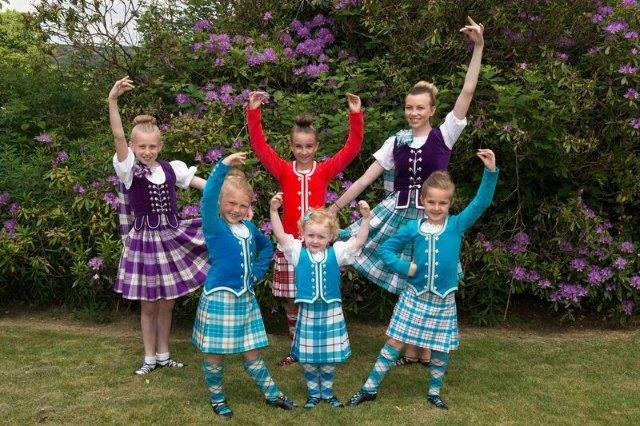 The parade will leave the West of Scotland College, Bothwell Road car park, 2pm for 2:15. 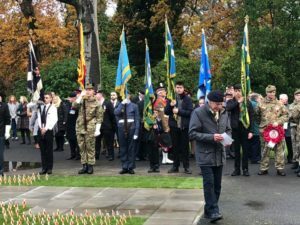 Should the weather take a turn for the worst the service will be moved to the Council Headquarters, Almada Street, Hamilton, ML3 0AA. 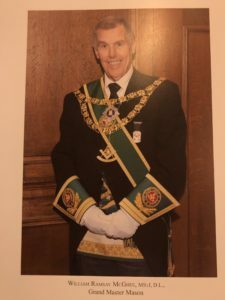 As with other years Provincial Grand Master has requested that regalia is not be worn other that Right Worshipful Masters who are requested to wear their chain of office only. This service is open to all Brethren of the Province, where we are always very well represented. Congratulations from all at The Provincial Grand Lodge of Lanarkshire Middle Ward and all in the Province to Bro. 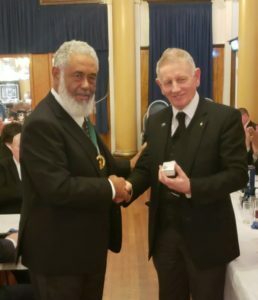 Ramsey McGhee on being Elected as the New Grand Master Mason of The Grand Lodge of Scotland. 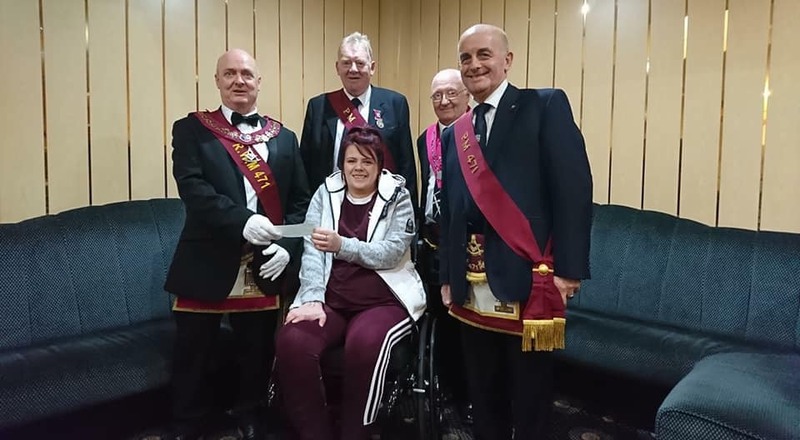 The RWM Brother Robert Whitefield and members of Lodge St John Shotts No 471 presenting a cheque for the sum of £1,500 to a young Shotts lady, Ashley Pinion. 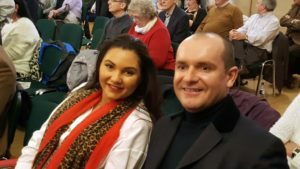 The money was raised by the Brethren of the Lodge to help provide support for Ashley, who was the victim of an accident recently and suffered life changing injuries. Well done to from Provincial Grand Lodge on this fantastic gesture, super work ??? The Installation at 427 St. Clair was held on Saturday 27th October. Substitute Provincial Grand Master Bro. Angus Ross headed a fine deputation from PGL into the Lodge. Right Worshipful Master Stuart Maxwell was installed in fine form by Installing Master Tom Maxwell PM and Installing Master Bro. Sam Haycock PM An excellent installation with New Master being installed by his father and uncle. Following the ceremony they retired and enjoyed some Lodge toasts and hospitality. Fantastic charitable work by Lodge Livingstone St. Andrew No. 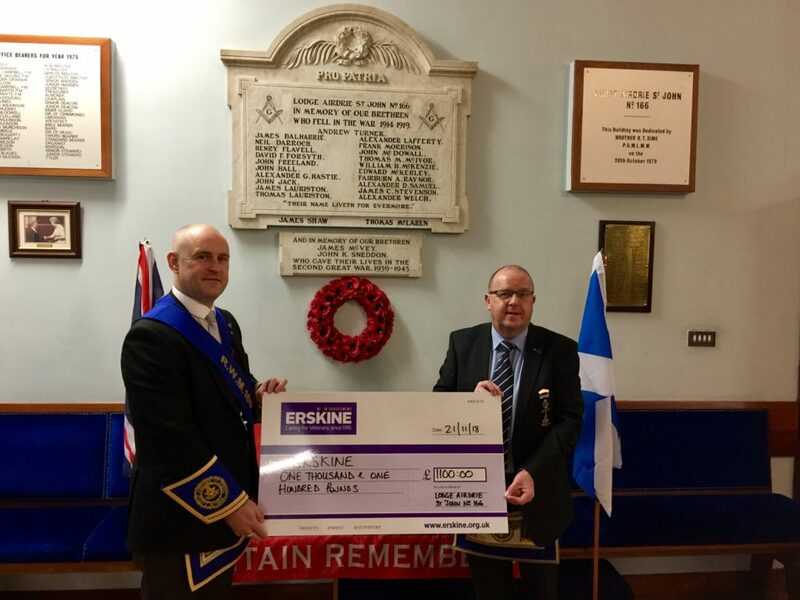 573 with RWM James Gardner making a presentation of £500 on behalf of the Lodge to the 3rd Motherwell Girls Brigade in recognition of their outstanding work crocheting poppies for many years and raising in excess of £16,500 for Erskine Hospital. 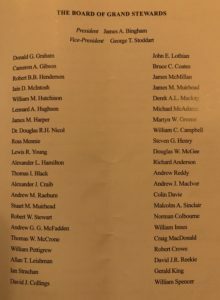 A total of 65 brethren signed the tyle and this included brethren from our sister lodges in Coatbridge, Airdrie, Glenboig, Glasgow and the Highlands. Lodge Old Monkland St James brethren have already arranged a reciprocal visit to Ballintoy in 2019. 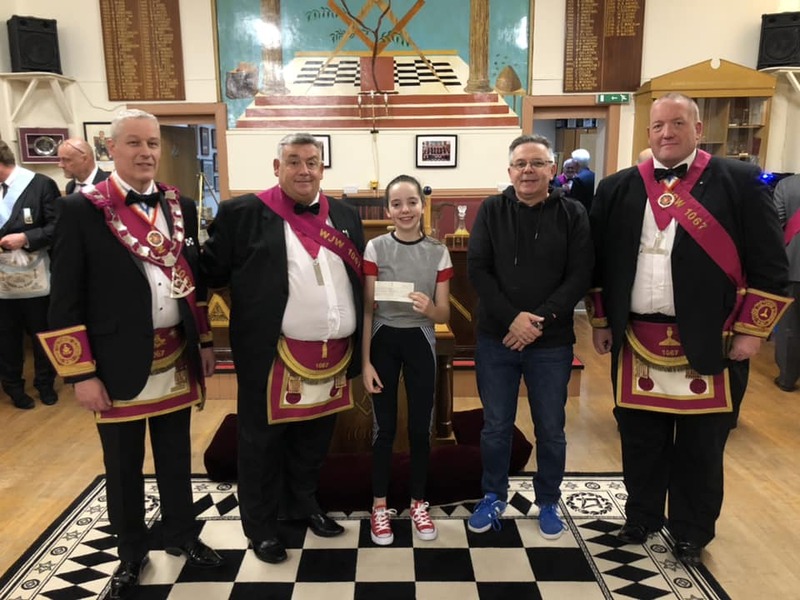 Lodge Coltswood welcomed Glenboig’s little Scoliosis warrior, Iona Stewart into the Lodge along with her parents Ian and Susan prior to the regular meeting. 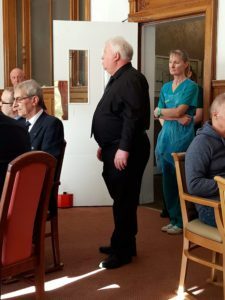 Iona has recently undergone pioneering major spinal surgery in Turkey to treat her spinal curvature, earlier that day she had her stitches removed but still managed to come along to meet the Brethern. 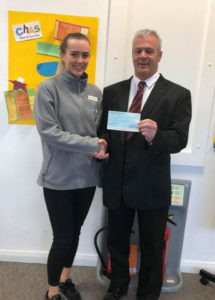 The Lodge presented Iona with a cheque totalling £500 to help with the fundraising and cover the cost of the surgery, this money was raised by the Lodge at a recent race night arranged by WJW Joe Spiers. The family are holding a lot of fundraising events over the coming months and more can be found out on her Facebook page. 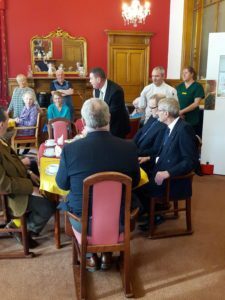 The 108yr old Lodge is only too happy to support the local community when it gets the chance, and this cause was no exception. Well done Lodge Coltswood supporting their local community. 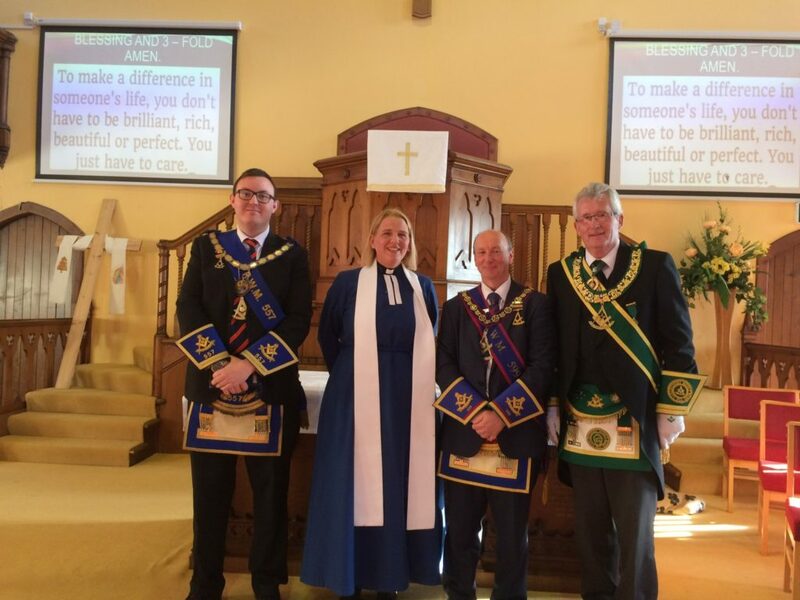 The Lodge held their Annual Divine Service at St. Andrews Church, Baillieston. Also in attendance was a fine Deputation from Provincial Grand Lodge and Members of Visiting Lodges. Locum, George Grant conducted the service in a very friendly and informative manner. Following the Service, the congregation and Brethren retired to the Lodge for an excellent tea and buffet. 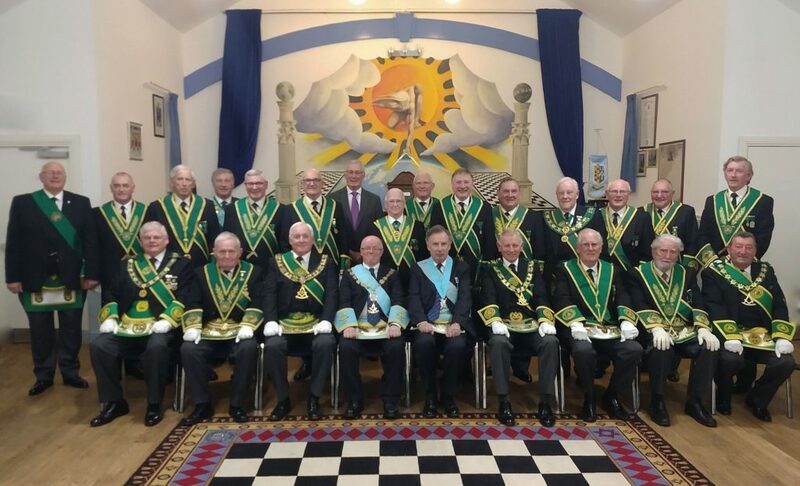 The Lodge held their Annual Installation on Friday 12th October. Bro. 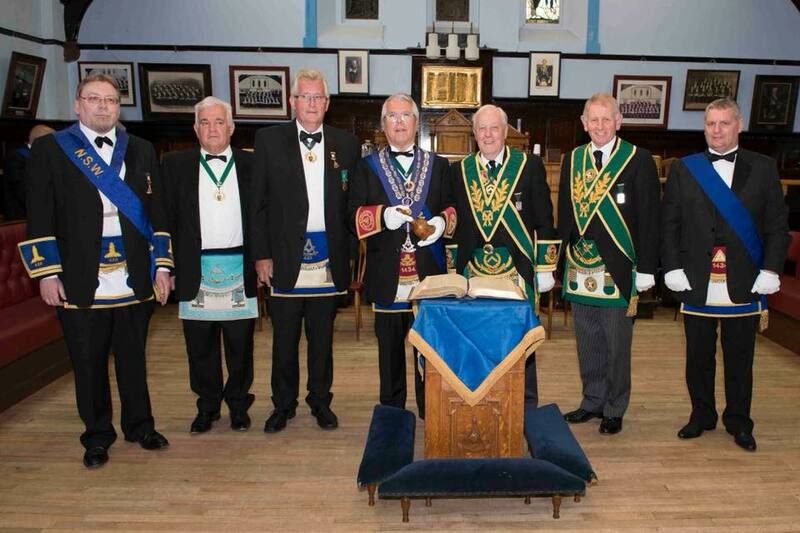 Angus Ross SPGM headed a large deputation form Provincial Grand Lodge accompanied by Bro. Bill Perry PGM. Bro. Jim McKidd was installed as Right Worshipful Master of the Lodge in fine old form by Installing Masters Bro. Alex Fenton RWIM and Bro. Stan Sweeney RWIM. Following the completion of the Installation ceremony the Brethren enjoyed some excellent speeches and Lodge St. Mary Coltness No. 31 hospitality and harmony. 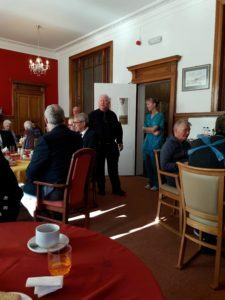 The Lodge held their Annual Divine Service on Sunday 7th October. RWM Bro. 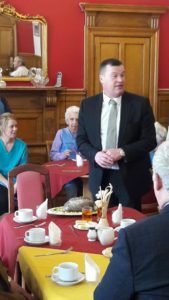 Craig Gibson extended a warm welcome to the Brethren and visitors. 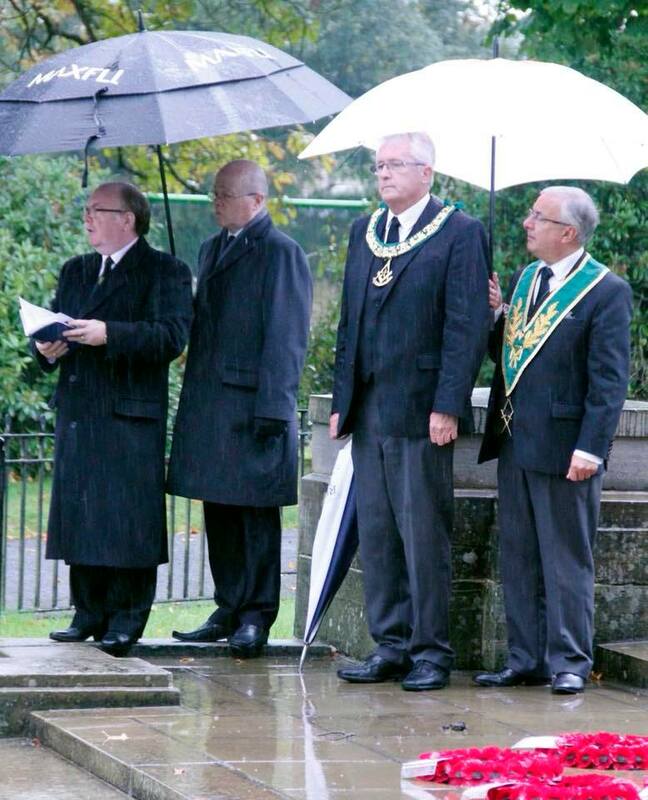 The PGM and nine other members of PGL were in attendance. The Service which was conducted by Rev. Jim Murphy was most thought provoking and enjoyed by everyone present. Following the completion of the Service, the congregation enjoyed some excellent 166 hospitality. Bro. 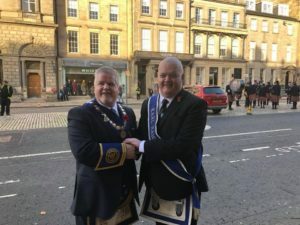 David McCormack was installed on Saturday 6th October 2018 at the masonic temple, Cadzow Street, Hamilton. The Installing Masters for the afternoon ceremony were Bro. Derek Rodger PM and Bro. Alex Watson PM, who carried out their duties to the very highest of standards, with PM Watson bringing his own humour and wit to the ceremony. Bro. 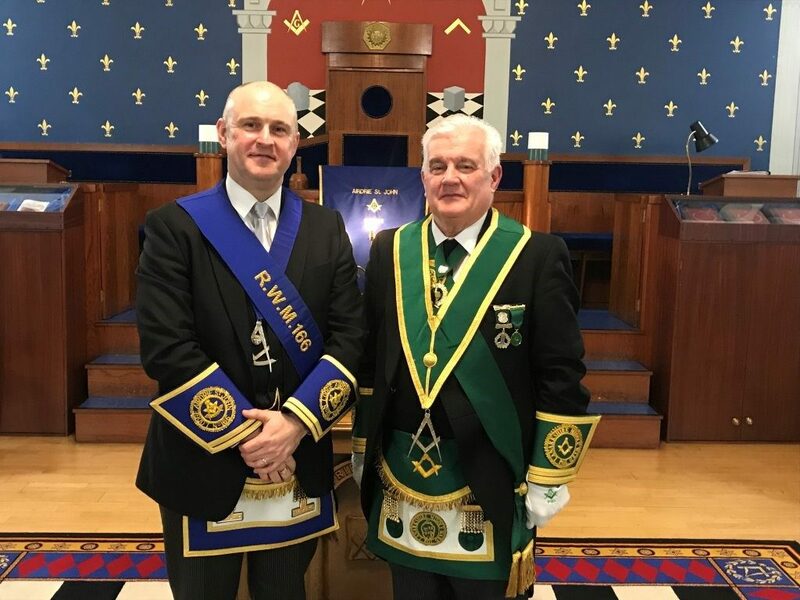 Alex Kelly SPGM headed a fine and large Deputation from Provincial Grand Lodge accompanied by Past Provincial Chaplain Bro. Peter Ball and PPGSW’s Bro. David Smillie and Bro. Jim Lees. Bro. Bill Perry, Provincial Grand Master headed Provincial Grand Lodge into a busy Lodge Room at the premises on Lodge Woodhall St. John No. 305 for the business of PGL at the October regular communication. Bro. Perry updated the members on the business of PGL and looked forward to a busy few months for the Province with Annual Divine Services, Annual Installations, quiz night, Armistice parades and the Twinning the District Grand Lodge of the Bahamas, all of which, further details will be available on PGL website events page and Facebook page. Bro. Perry also paid thanks to Bro. 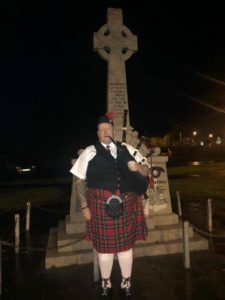 John Muir PM who had recently raised a fantastic sum of over £13,000 for the charity “Soldiers of our Streets” more details can be found on their website http://www.sots-scotland.co.uk. Bro. Perry RWPGM and Provincial Grand Lodge would like for formally thank the RWM & Brethren of Lodge Woodhall St. John No. 305 for the use of the premises and hospitality that followed. On Wednesday 3rd October, Bro. Bill Perry PGM and Bro. 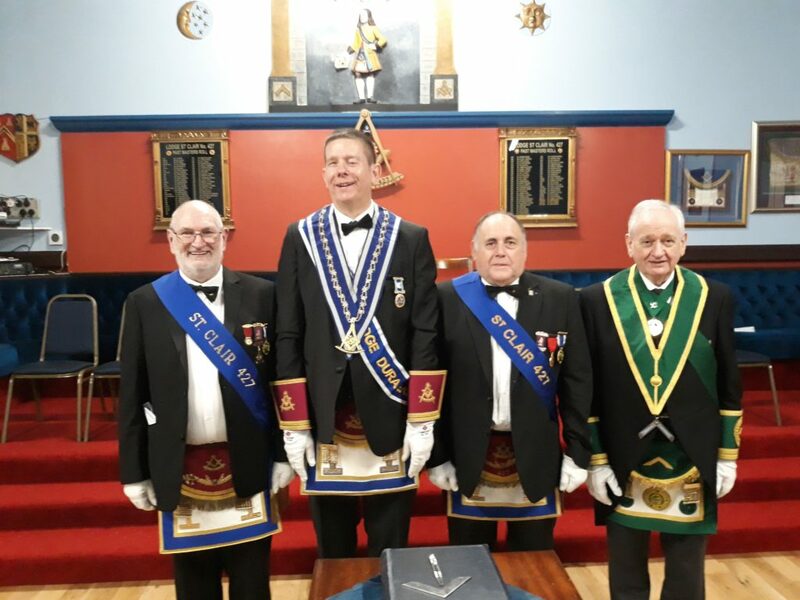 Andrew D Millar DPGM attended Lodge Robert King Stewart No. 919 forming part of a large Deputation from Lodge St. Bryde No. 579 headed by RWM Bro. Duncan Mulholland. RWM Bro. Phil Biggerstaff and the Brethren of 919 warmly welcomed all the visitors present. 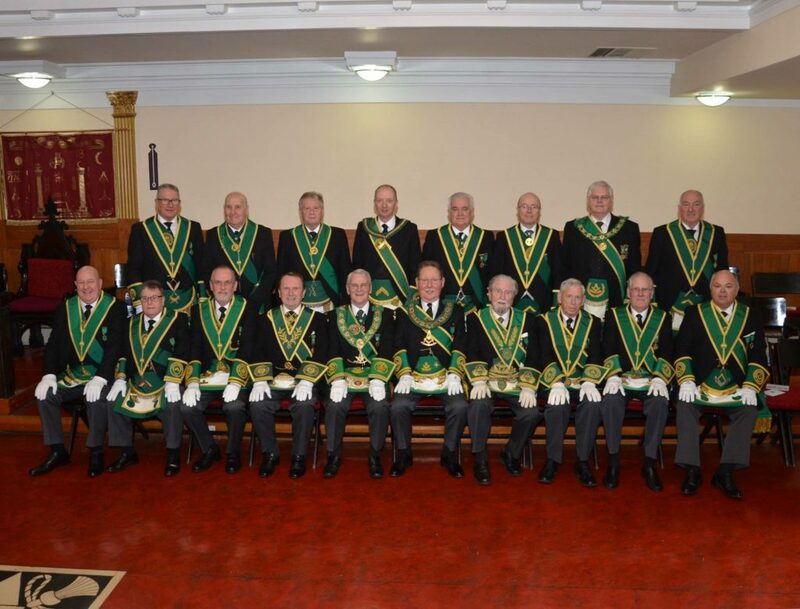 The RWM and Brethren of 579 conferred an excellent FC Degree which was appreciated by all. Following the Degree Bro. William McIlroy a MM of Lodge Caldercruix St. John No. 1314 and an Affiliate Member of Lodge Robert King Stewart, was presented with his 50 year Diploma. Both RWM’s, Bro. Pringle Johnstone of 1314 and Bro. Phil Biggerstaff of 919 paid tribute to his service to both Lodges and together with the PGM made the presentation. Bro. David Paterson PM also presented Bro. McIlroy with a commemorative Jewel. Bro. McIlroy thanked both Lodges for their kind words and looked forward to many more happy years in the company of the Brethren of 919 and 1314. The Brethren then retired and received excellent Robert King Stewart hospitality. On Saturday 22nd September Bro. 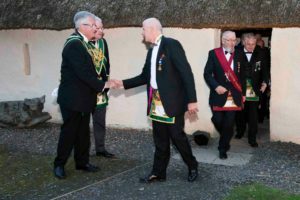 Bill Perry PGM, was privileged to be invited to attend a very unique EA Degree which was held in Burns Cottage. 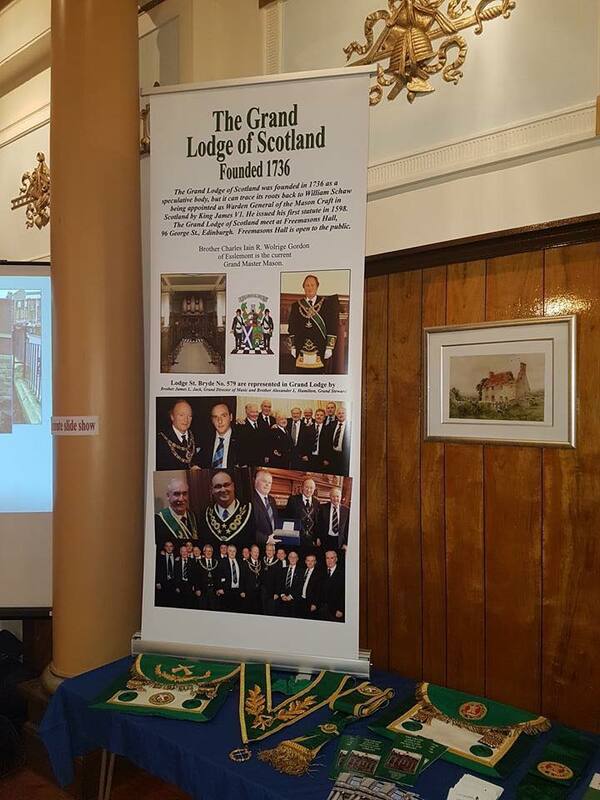 The evening was organised by Lodge Ayr St. Paul No. 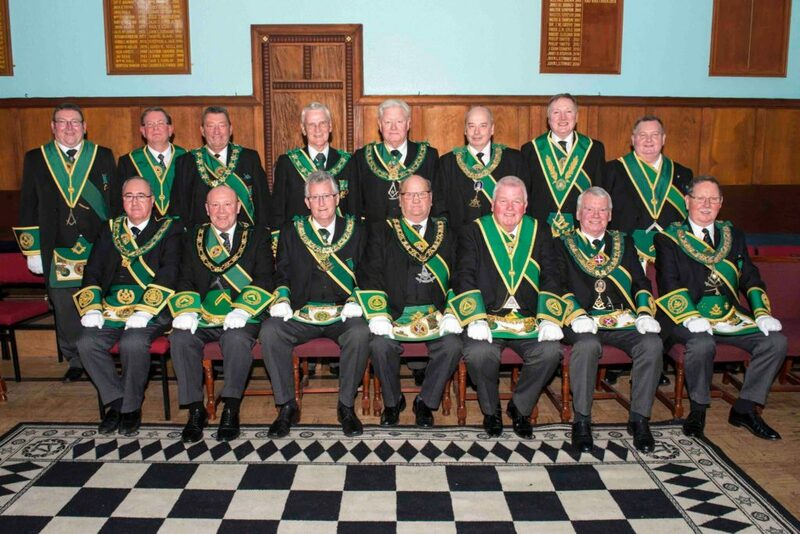 204, together with the PGL of Ayrshire and Lodges St. John Kilwinning Kilmarnock No. 22, Louden Kilwinning Newmilns No. 51, St. David (Tarbolton) Mauchline No.133 and St. James (Kilwinning) Tarbolton No. 135. The Candidate, Bro. William Jamieson, an EA of Lodge St. Paul was in period costume and the Ceremonial was delivered to the highest of standards. At the close of the Meeting, the Brethren retired to the Pavilion and were treated to a delicious meal and superb hospitality. A very enjoyable evening with special thanks to Bro. Stewart Cruickshank. 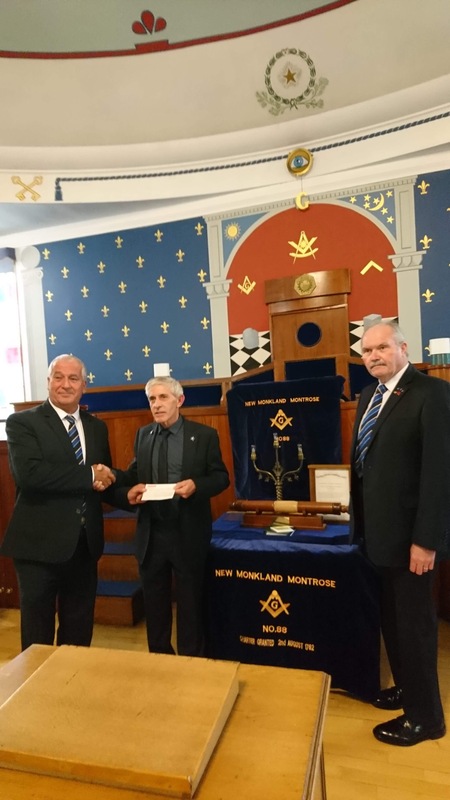 The Right Worshipful Masters selected charity for Lodge New Monkland Montrose No. 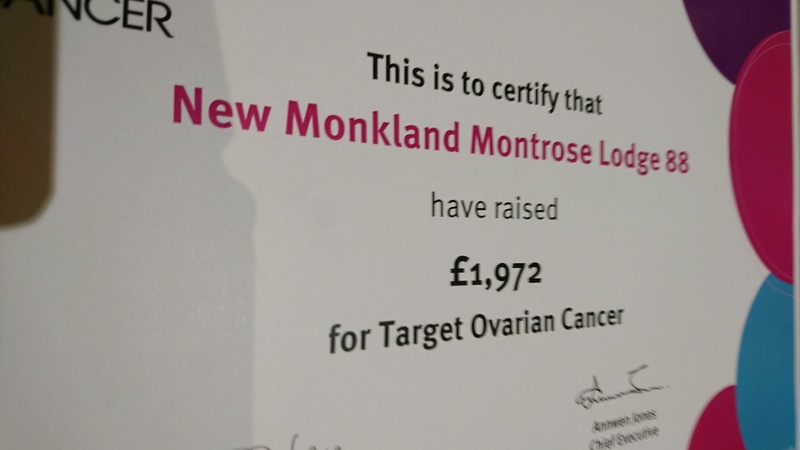 88 for 2018 was Target Ovarian Cancer. 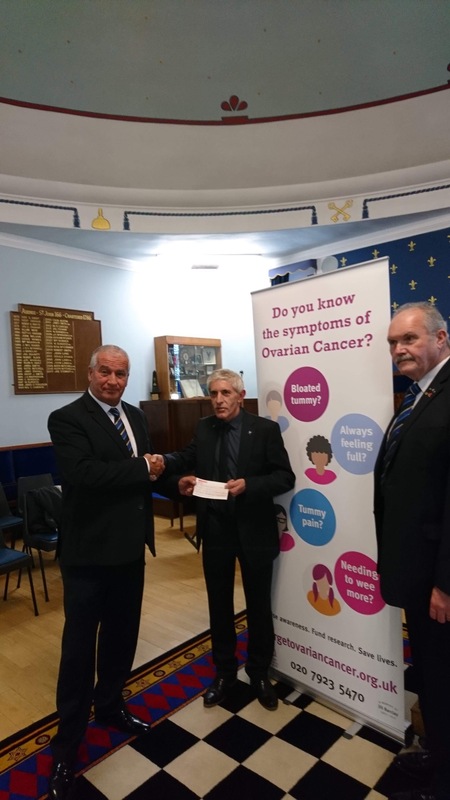 On 16th September RWM Kenny Mason presented a whopping £1972 cheques to the representative of the charity at their regular meeting, this is a massive effort by the Brethren, the Lodge should be applauded and give themselves well deserved credit for supporting the charity, Well done to all concerned from Provincial Grand Lodge, super effort. 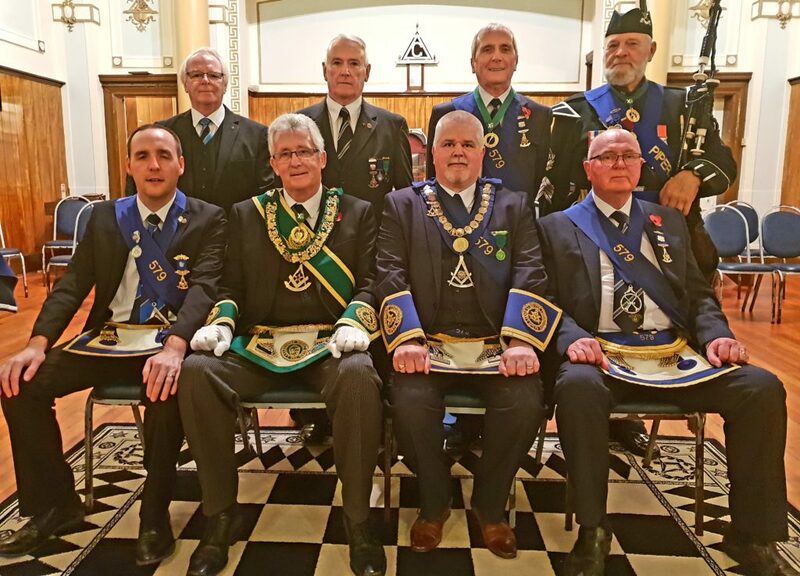 Bros. Tom Davidson, IPPGM and George R Kelly, PPGM were honoured to join with guests from sister provinces who were invited to join with a deputation from PGL of Glasgow at a meeting of Lodge St. John, Whiteinch (Glasgow) No.683. The deputation was headed by Bro. 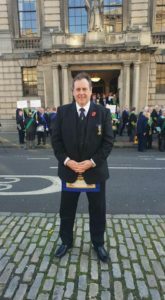 James C Peddie RWPGM of PGL of Glasgow who was returning to his duties after a hip operation. 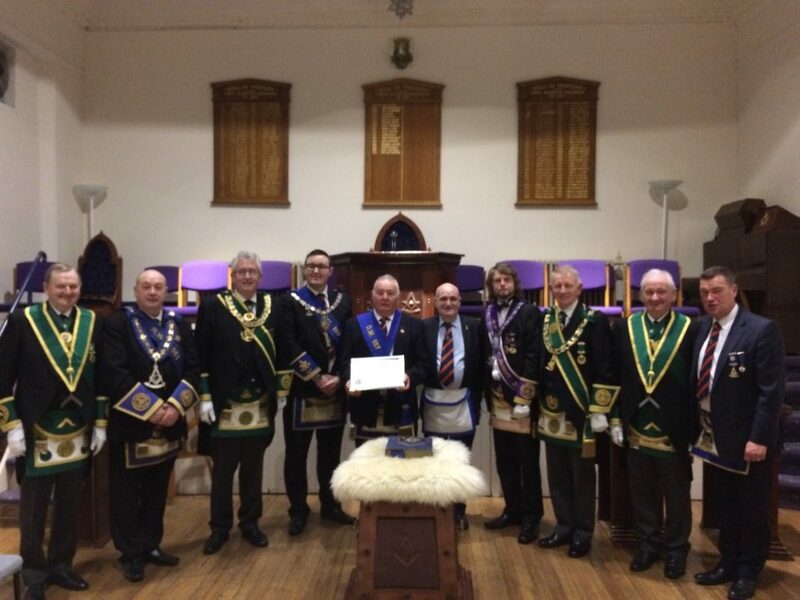 The deputation were attending to present a 50 year Jubilee Certificate to Bro. Alistair Henderson IPPGM of PGL of Glasgow. Bro. James C Peddie invited Bro. Bill Shepherdson PPGM to address the brethren and give them an account of the extensive service given by Bro. Henderson during his membership of the Craft. After the presentation Bro. 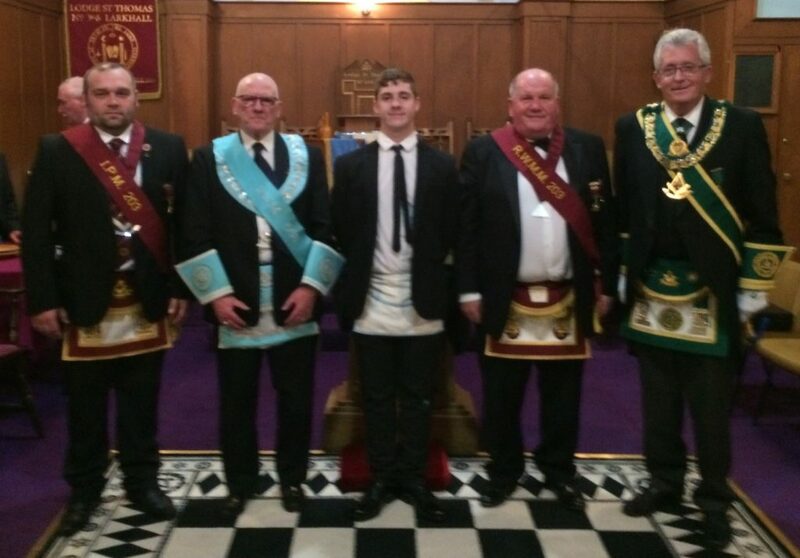 Henderson suitable replied and told the brethren of his families long connection with ther lodge, his Grandfather had been initiated into the lodge exactly 98 years ago to the day. Also in attendance was a deputation from Lodge Bailie Nichol Jarvie No.1036 from Aberfoyle in PGL of Perthshire West. 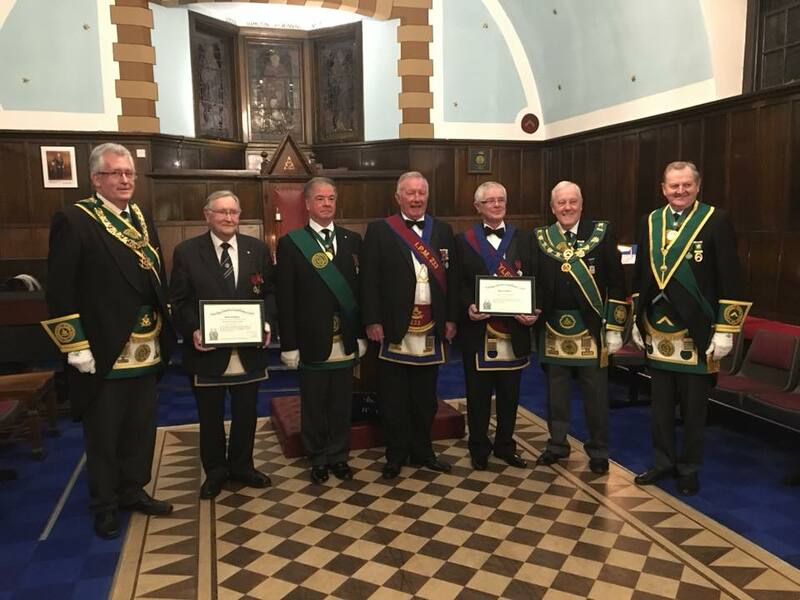 The RWM and brethren carried out an excellent Fellowcraft degree. All the brethren retired to harmony. A Deputation from Provincial Grand Lodge attended Lodge St. Andrew Military No. 668 and were warmly welcomed by RWM Bro. David Stewart. Also in attendance were The Operative Lodge of Airdrie No. 203 headed by IPM Bro. 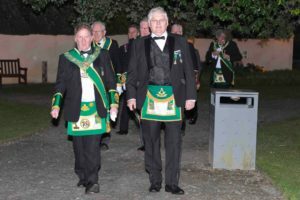 Ross Goldie who had been invited to confer the MMM Ceremony on Bro. Jamie Major. RWM Bro. David Stewart then asked the DoC to present Bro. Peter Ball PM Secretary, who to his great surprise was presented with Distinguished Service Membership of Lodge St. Andrew Military No. 668. The RWM gave a comprehensive history of the service given to the Lodge by Bro. 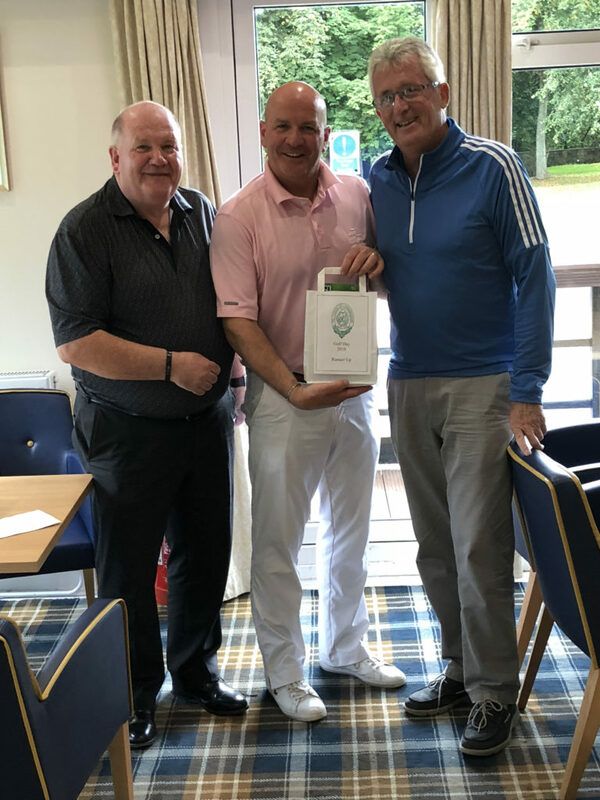 Ball and along with the PGM warmly congratulated him on this achievement. Bro. Ball suitably replied. The presentation being completed, the Mark Ceremonial was expertly delivered by RWMM Bro. John Gardner and the PM’s and Brethren of 203. 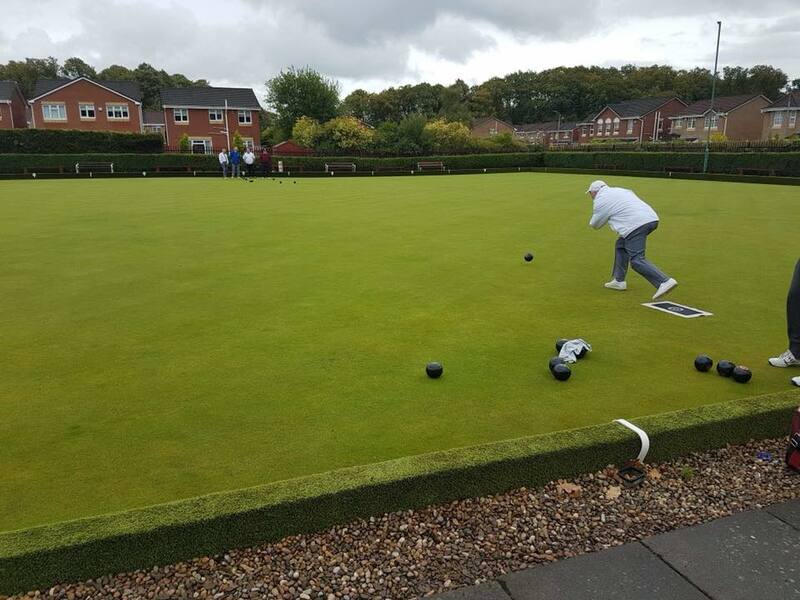 The final of the PGL Robert King Stewart Bowling tournament was played at Wrangholm Hall Bowling Club, New Stevenson this afternoon. The game in whole was a very close, with only a handful of shots separating the teams, both teams were neck and neck after the 13th end. With 2 ends to go, Lodge 203 took 1 shot, in the final end Lodge 919 were lying 2 shots, with only the skips to play and In a nail biting end 203 gained 1 more shot winning 13-11, winning the trophy for the fourth year on the bounce. Provincial Grand Lodge would like to thank all the Lodges for taking part and also Bro. 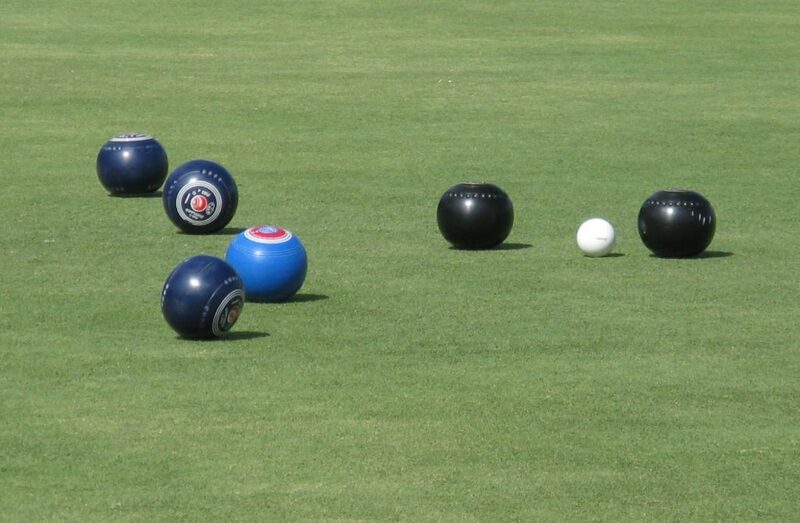 Andrew Chriton for his organisation and time as Bowls Convenor, he would like to thank the Bowling clubs who provided the rinks and provided hospitality to the Brethren who took part. Andy would also like to comment that both teams should be very proud of their performance, as the standard of bowling was to the highest level, considering the weather beforehand. RWPGM Bro. Bill Perry headed a large and distinguished deputation to the Installation Ceremony of RWM Elect. Bro Jim Vasey, Provincial Grand Junior Chaplin. 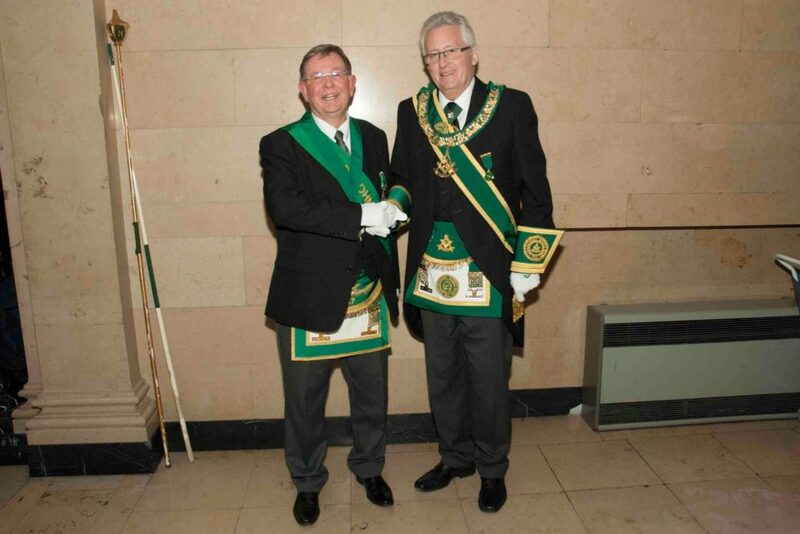 The ceremony was carried out in a very able manner by Brothers, not just in Freemasonry, George and Alex Kelly. 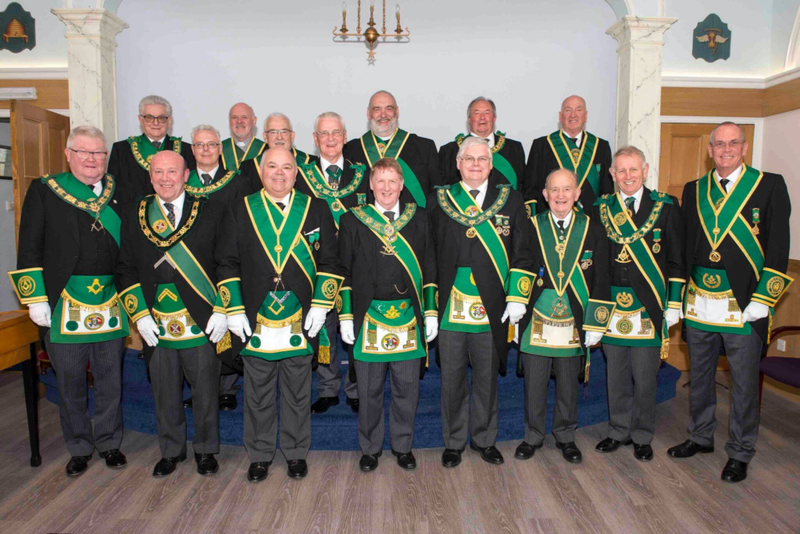 The photographs included below show a large deputation of very distinguished current and past Provincial Grand Lodge Grand Masters and Office Bearers who are also members of Lodge Meridian with the official deputation. 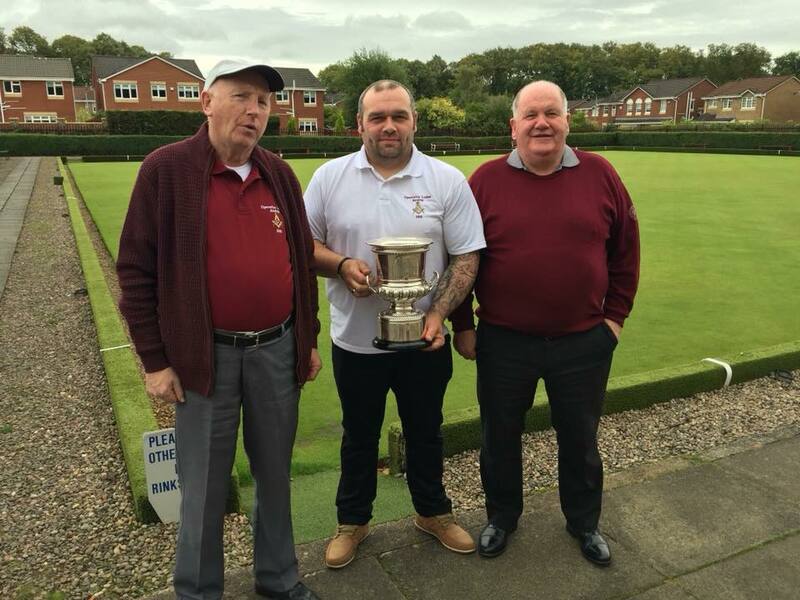 The is years competition was played ant various venues on 5th September 2018, the event was not as well supported as other years with only 12 teams, an appeal was made from the Bowls Convener Andy Crichton for the Lodges to support the event if future years. This year there was a tie for first place with Lodge Robert King Stewart No. 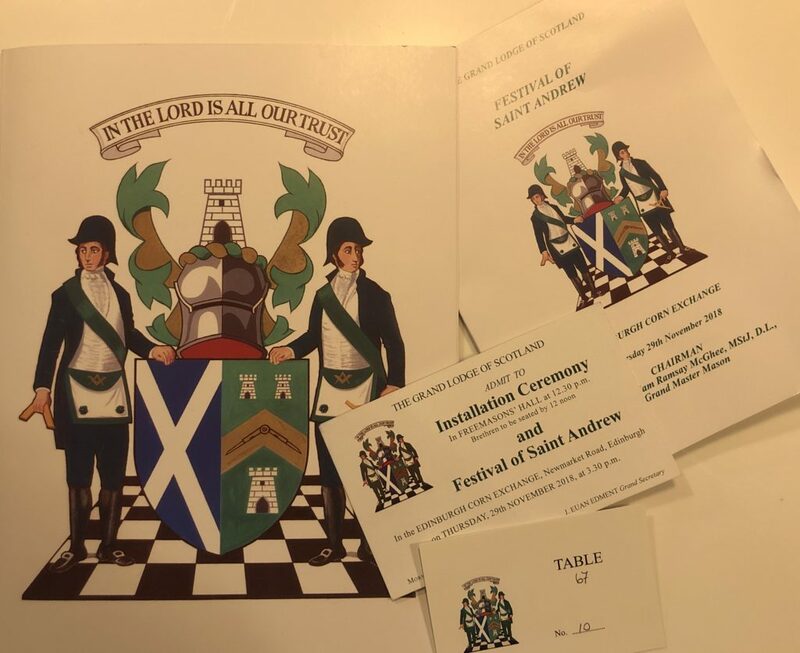 919 and The Operative Lodge of Airdrie No. 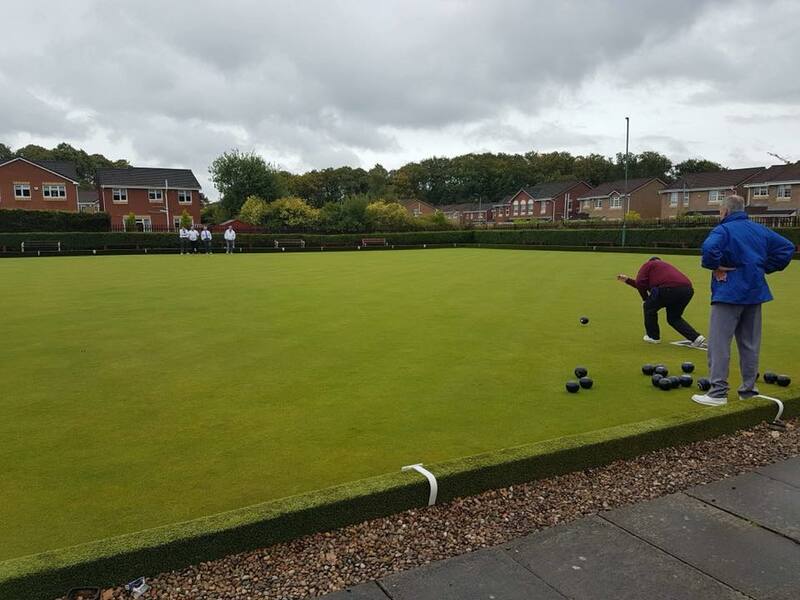 203 sharing the lead, a tie-break is scheduled for Sunday 16th September at 2pm at Wrangholm Hall Bowling Club, Jervisiton Street, New Stevenson, ML1 4UG. All Brethren Families and friends are invited to support the participants. 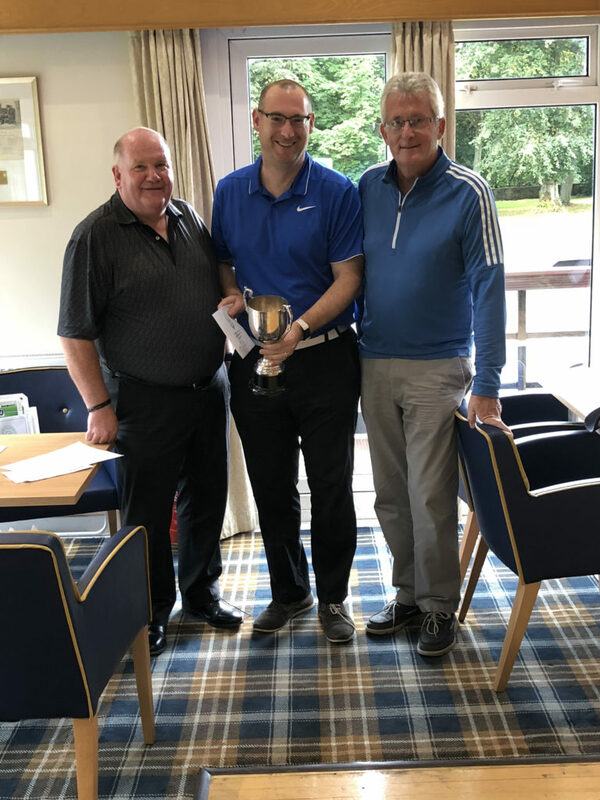 The annual PGL of Lanarkshire Middle Ward golf tournament was held at Drumpellier Golf Club on Sunday 2nd September 2018 The weather was a clammy Autumn day and considering the recent rain the course was is fantastic condition, well done to PM Brian Hillen and his team. The winner of the overall and Amicoil trophy was Bro. Brian Mitchell of The Operative Lodge of Airdrie No. 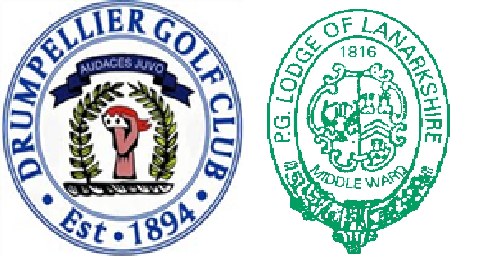 203 with 39 points, with Lodge 203 also winning the overall team prize with a PGL historical high of 111 points. 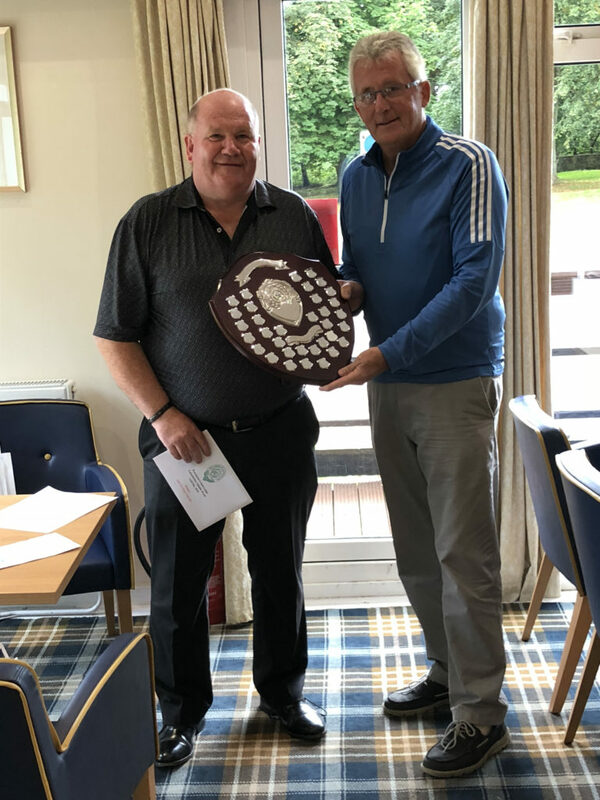 The runners up in the team prize caused a little confusion with the PGM attempted to claim the runners-up prize on behalf of Lodge Robert Burns No. 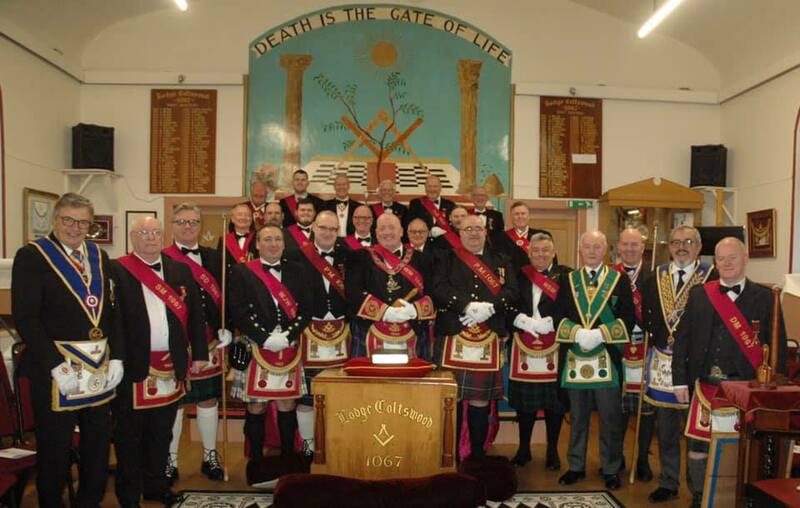 440, much to the dismay and protest of the Brethren of Lodge Coltswood Glenboig No. 1067. 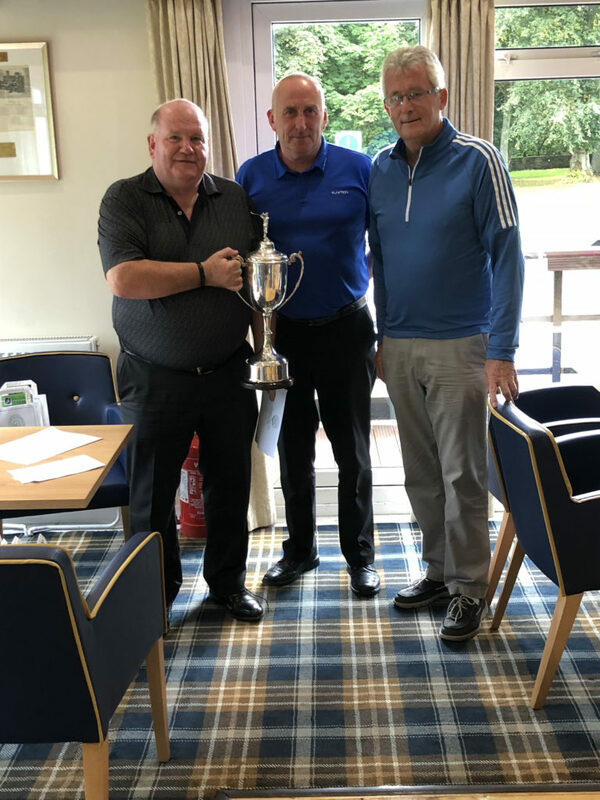 With a quick verification of the scores it was agreed the PGM was at it ?, and indeed it was Lodge Coltswood who were worthy Runners-up and they claimed the Tunnock Trophy. 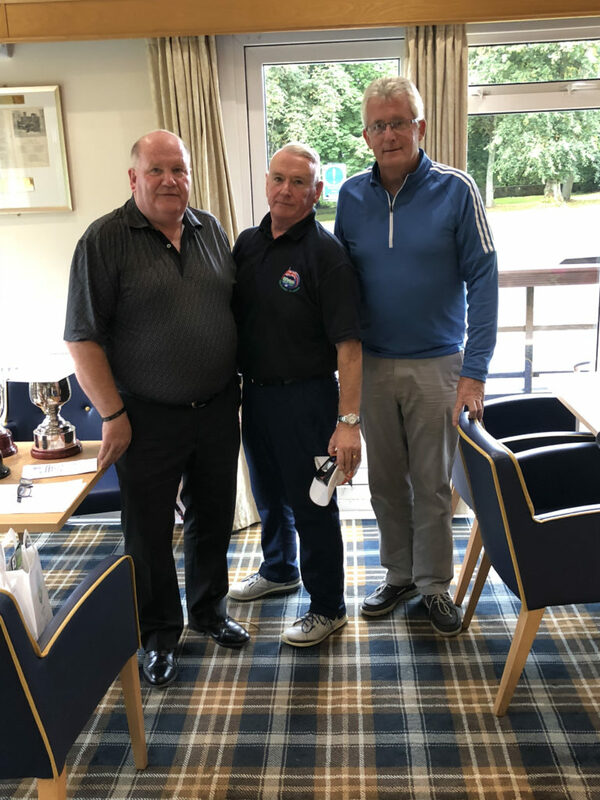 Provincial Grand Lodge of Lanarkshire Middle Ward would like to thank the Committee, members, bar and catering staff of Drumpellier Golf Club for the use of the course and facilities once again. The numbers this year were lower than normal and a plea was made from the PGM Bill Perry and Golf Convenor Bro. John Gardiner to support this very important and enjoyable day in the PGL Social Calendar for future years and work with the Lodge members to promote the event and bring the numbers of competitors up. Provincial Grand Master Brother William A. Perry sends early fraternal greetings to all Brethren and extends an invitation to all Lodges to enter a team (or teams) in the 4th Annual PGL Quiz, teams will consist of 4 Brethren per team. 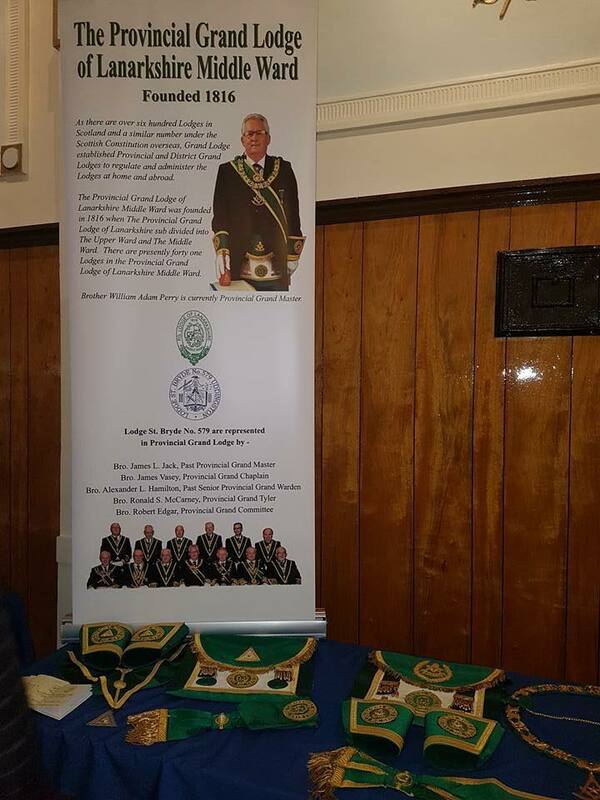 This year it is being held in the Masonic Hall, Uddingston, courtesy of Lodge St Bryde No. 579. The quiz has been well supported in previous years with around 20 teams taking part in what is a very friendly but competitive atmosphere. Forms have been sent to all Lodge Secretaries and should be returned to PG Secretary Willie Craig no later than the 12th October with a cheque for £10 for each team taking part. Lodge team members should be regular attending members of the lodge. Teams of four. The Question master will ask the questions and teams will write their answers on a sheet which will then be scrutinised and points allocated. During the marking the question master will go over the questions and the correct answers with the teams and any supporters. The 2018 competition will be held in Lodge St Bryde No. 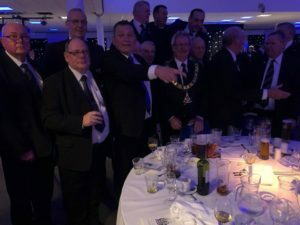 579 in Uddingston where bar facilities for competitors, and supporters provide an opportunity for bringing non-mason friends along to enjoy a light hearted social event. 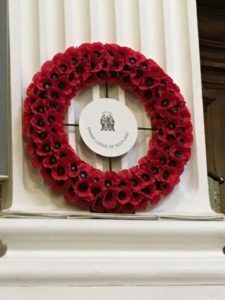 Provincial Grand Lodge together with twenty of our Lodges took part in a wreath laying Ceremony at the Hamilton Cenotaph. Also in attendance was a large number of the Masonic Motorcycle Group, the Widow’s Sons and Bro. David Reid from Grand Lodge. Over the summer months, Bro. 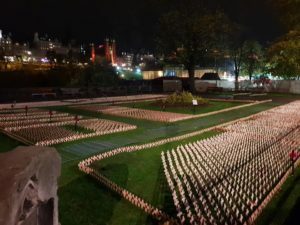 Reid and the Widow’s Sons are visiting the 32 Provinces in Scotland to commemorate the end of the Great War and to give support to the various Provinces taking part in similar Ceremonies. 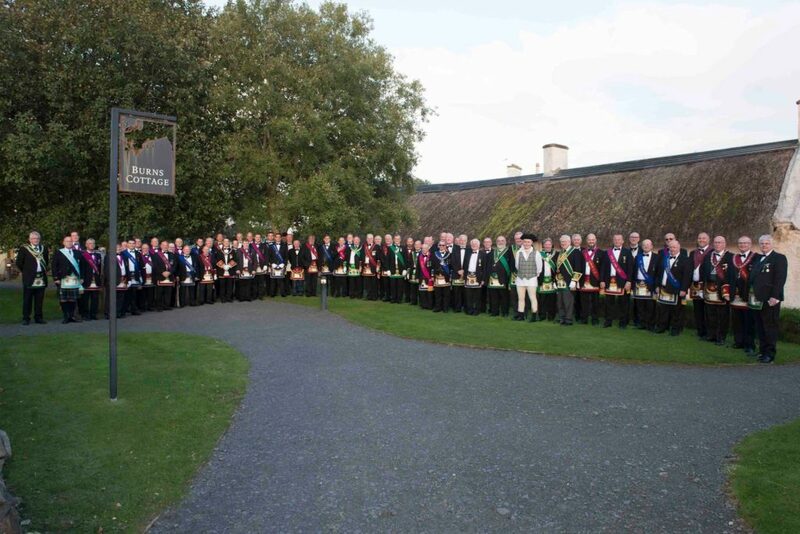 The PGM would like to thank everyone for the great support from the Province, with special thanks to to Bro. Captain David Johnston, Provincial Grand Piper Bro. David Stark and Bro. James Ferguson Provincial Grand Chaplain and not forgetting Provincial Grand Secretary Bro. Willie Craig. 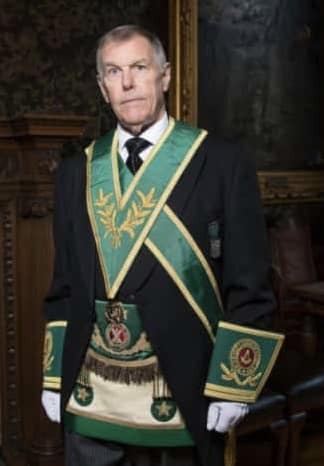 Regalia is NOT to be worn to this event other than the attending Right Worshipful Masters who are requested to wear their CHAIN OF OFFICE only. 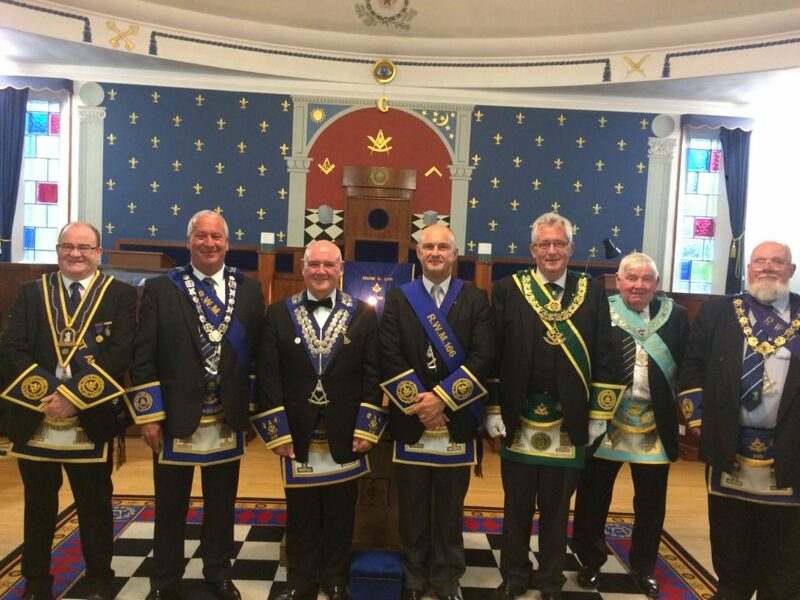 On Saturday 4th August, the Provincial Grand Lodge of Ayrshire held a dinner in the Kilmarnock Masonic Social Club to thank IPPGM Bro. Robert Little for his leadership and example set during his five year Commission as PGM. Bro. William Steel PGM acted as chairman and had invited Bro. Jim Forrest, the PGM of Dunbartonshire to give a short talk on his experiences in the Craft and to propose a toast on behalf of Bro. Little. Our Province was well represented and the Brethren enjoyed a fine meal and entertainment provided by the Ayrshire Fiddle Orchestra. 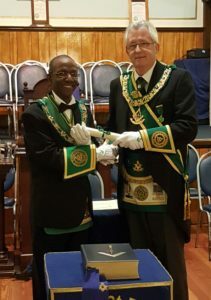 Bro Tom McCrome was Installed into the chair of Lodge Randolph No. 1434 at the very capable hands of Installing Masters, Bro. William Gauld PM and Bro. David Reid PM. A number of Brethren from the Province were present and we wish RWM Bro. 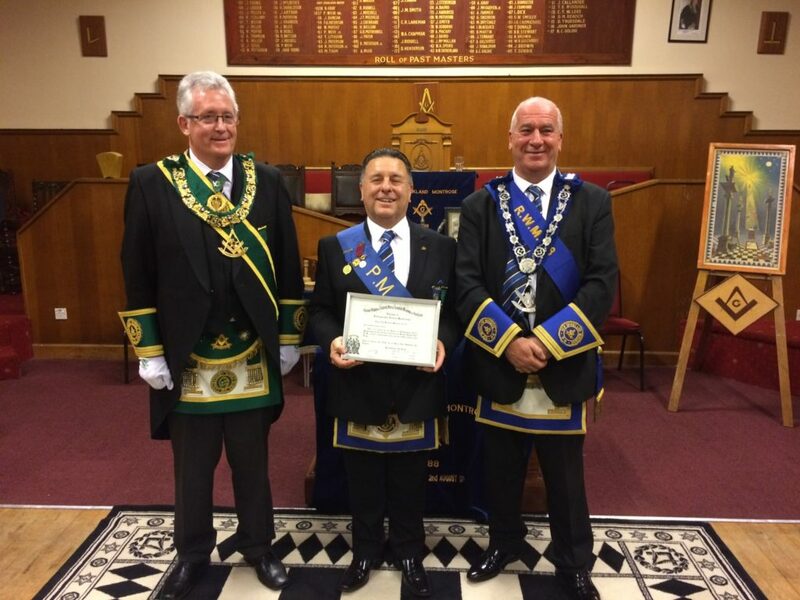 Tom McCrone and his adopted Lodge great success during the next twelve months. Following the close of the Meeting, the Brethren retired and enjoyed an excellent meal and speeches. Bro. 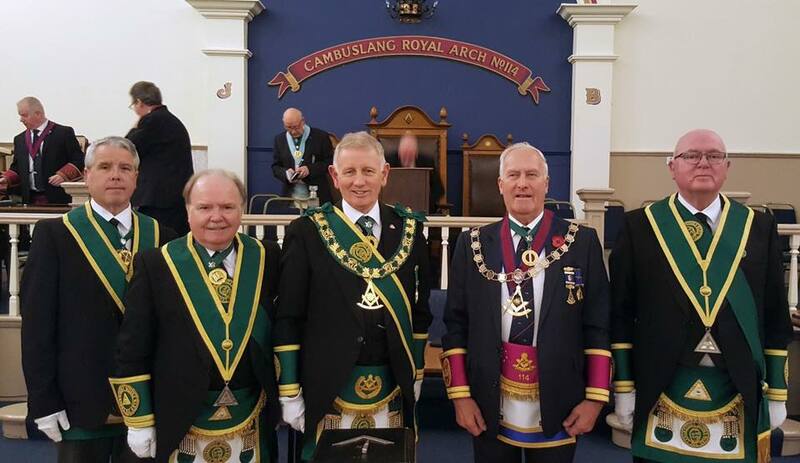 Tom Davidson IPPGM represented the province at the summer communication of PGL of Dumfriesshire in Sanquhar. 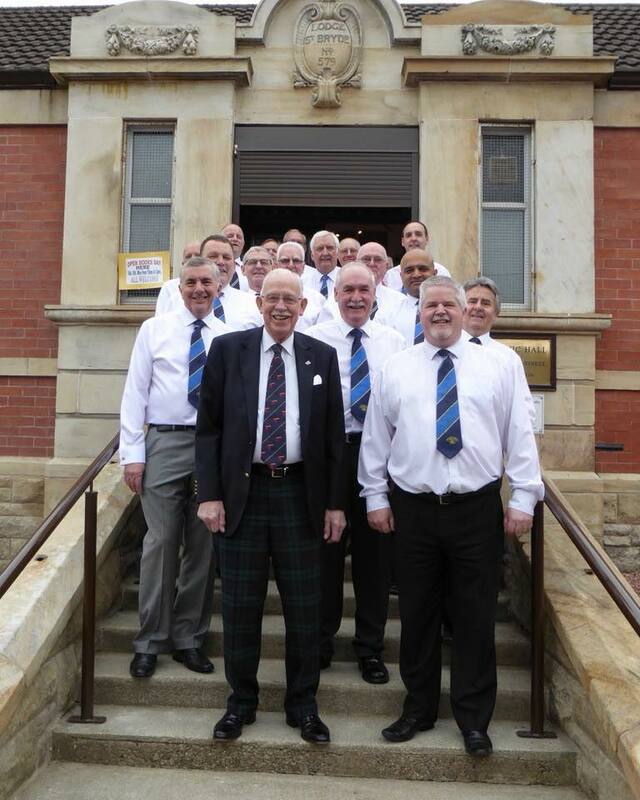 The meeting was held in the premises of Lodge Sanquhar Kilwinning No.194. Bro. Davidson joined the other visitors from PGL of Kilwinning in forming a deputation. 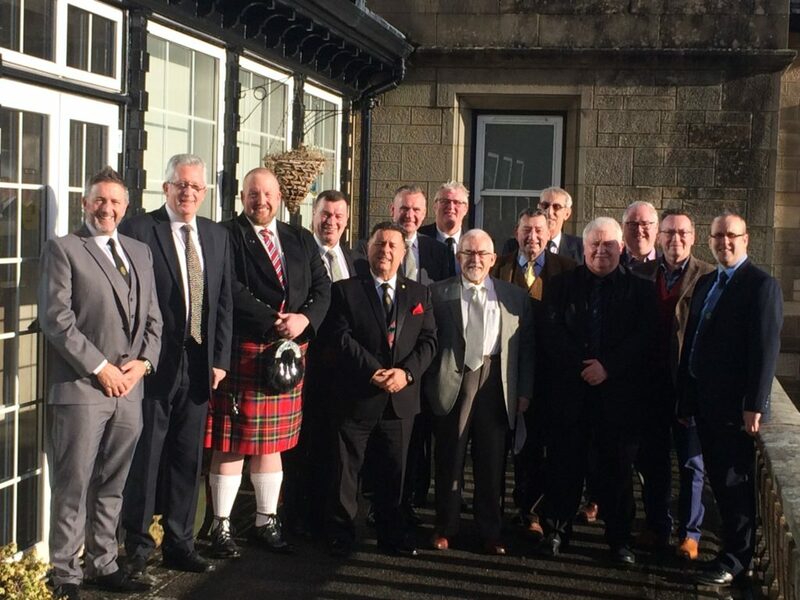 This meeting of the province traditionally is followed by a lunch before the brethren take part in either a bowls or golf competition. All competitors enjoyed the first class weather and scenery as well as the fellowship of the competitions. All met back at the temple for the presentation of prizes and further food and refreshment. 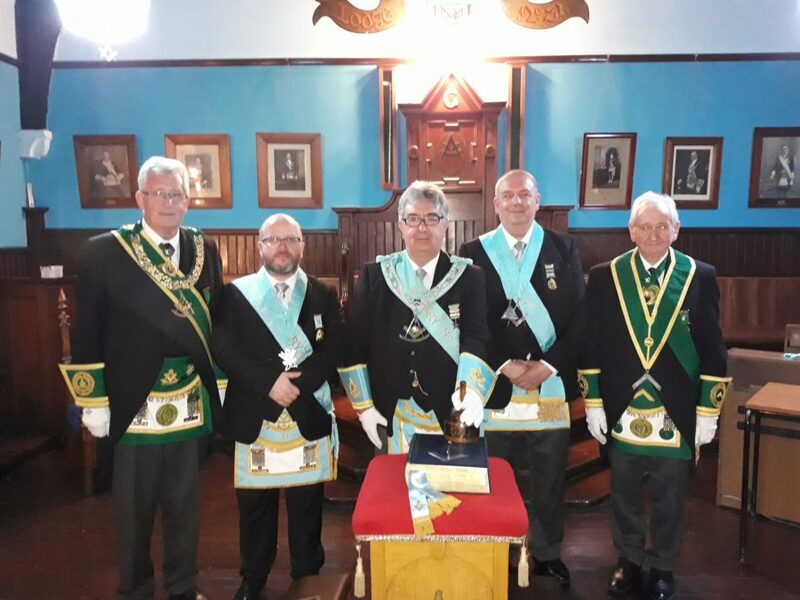 Thanks go to brethren of PGL of Dumfriesshire for their fellowship and Lodge Sanquhar Kilwinning No.194 for their excellent hospitality. Well done to all involved. 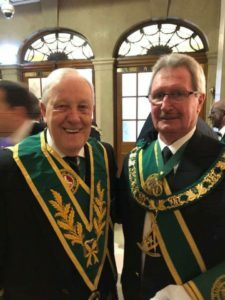 It’s official the Province has successfully twinned with the District Grand Lodge of Central South Africa. 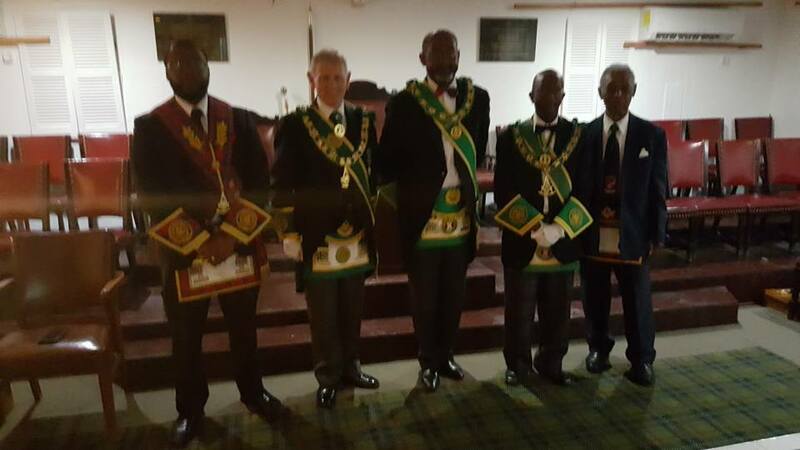 At the regular communication of the District Grand Lodge of Central South Africa in Gemiston, Johannesburg, in a historical twinning and first for Scottish Freemasonry, PGM Bro. Bill Perry and DGM Bro. Jim Kerr signed a document following a short twinning ceremony by PPGM Bro. George Kelly, this commits the Brethren both sides of the equator to further develop and learn from their unique relationship. 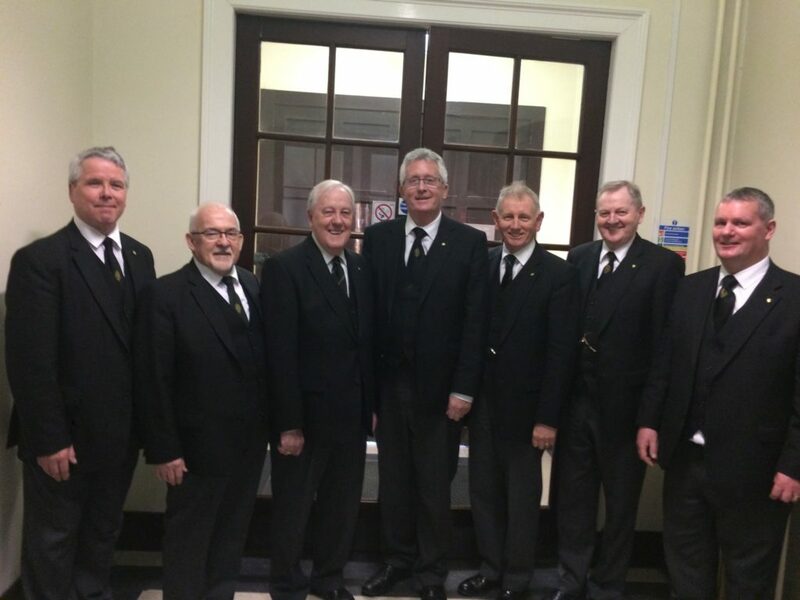 Seven Proxy Masters from the Middle Ward who represent the South African Lodges at Grand Lodge accompanied PGM Bro. Perry and Proxy District Grand Master Bro. James L Jack. 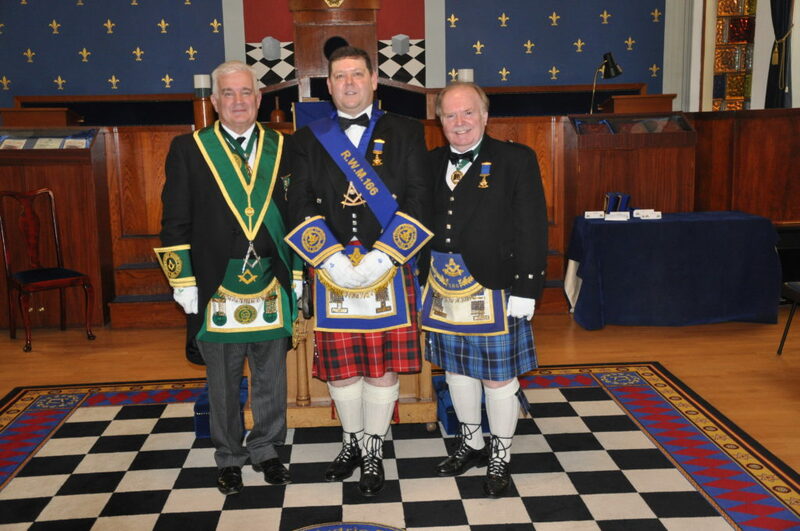 The deputation was further enhanced with the PGM of Stirlingshire, Bro. Alistair Marshall. More details of this historic trip will follow. 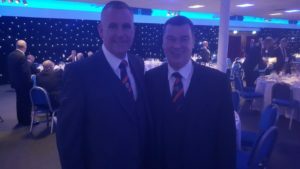 Bros. Norman M Carnegy and Alex R Kelly, SPGMs represented the province at the installation of Bro. Tom Wood, RWPGM of PGL Kilwinning and his commissioned office bearers. Also present from the province in the Grand Lodge deputation were Bros. Tom Davidson and Tom McCrone. 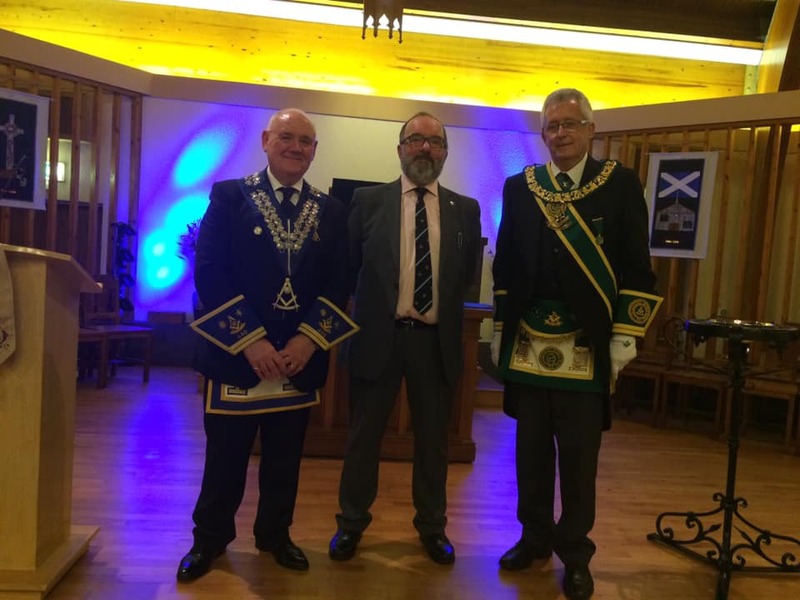 The installation took place before a full house of brethren in The Mother Lodge in Kilwinning. The excellent ceremonial was conducted by the MWGMM, Bro. Charles Iain Robert Wolrige Gordon of Esselmont. Following the conclusion of the ceremonial the brethren retired to dinner where over 110 brethren sat down to an first class meal, good company and excellent speeches. 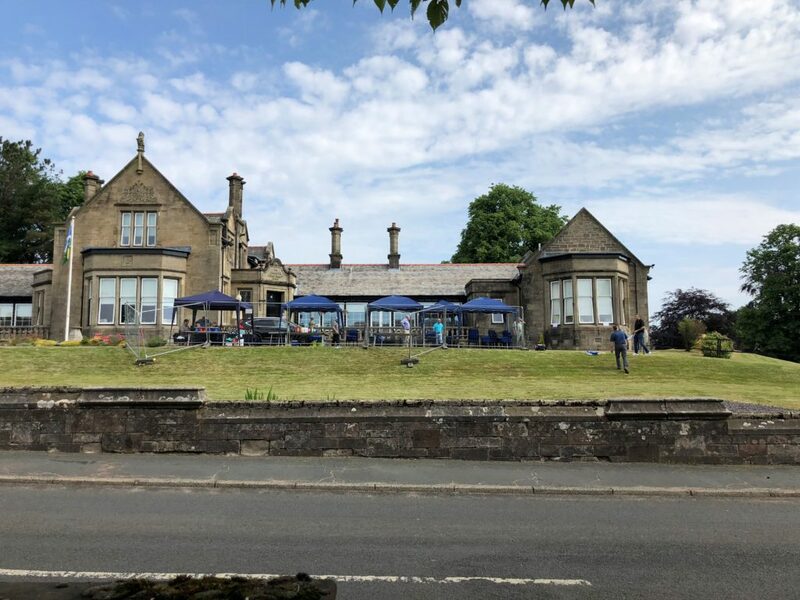 Friday 22nd June 2018 – Lodge Coltswood Glenboig No. 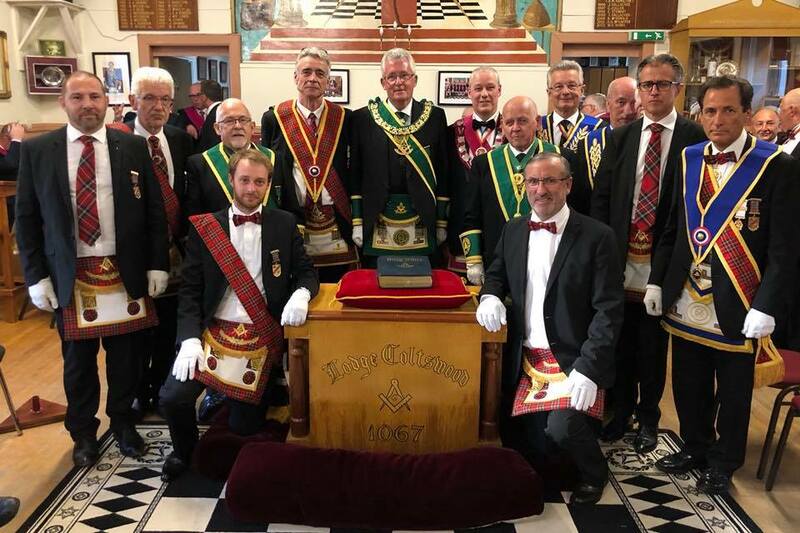 1067 – Visit by Lodge Ausone No 1389, PGL of Guyenne Gascogne, Grand Lodge National of France. PGM Bill Perry accompanied by PG Sect. Willie Craig and PPG Chaplain attended a visit by a new French Lodge, continuing the relations with French Brethren by Lodge Coltswood. In a busy evening, over 90 Brethren signed the attendance book. 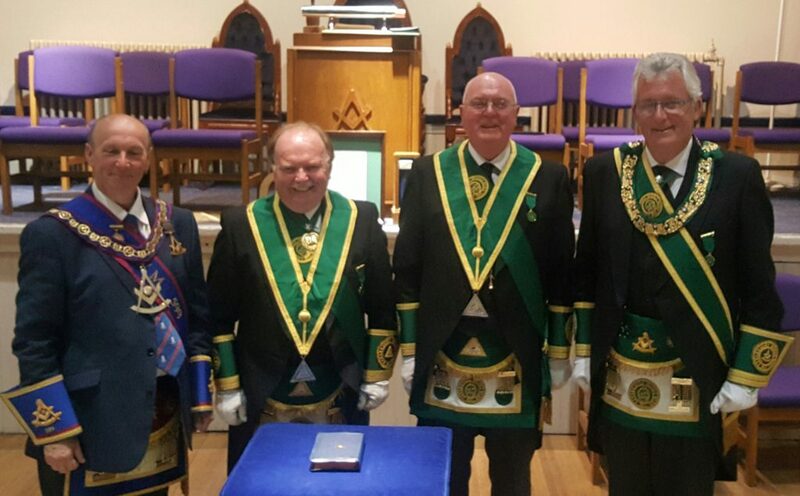 The evening was enhanced with Lodge New Monkland Montrose No. 88 attending and delivering a immaculate rendition of the Entered Apprentice Degree. Following the meeting PGL joined the French, Coltswood and visiting Brethren in some fantastic Lodge hospitality and harmony. 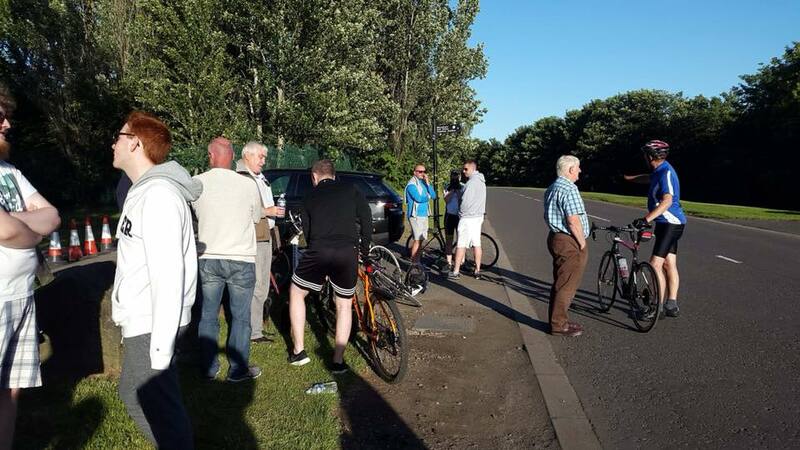 On a warm Summer night, the course was set for 3 laps around Strathclyde Park and some of the Province’s finest accompanied by Family and Friends assembled for the off. The weather was sunny but with a stiff westerly breeze. Sounds like a Bob Hope film!! 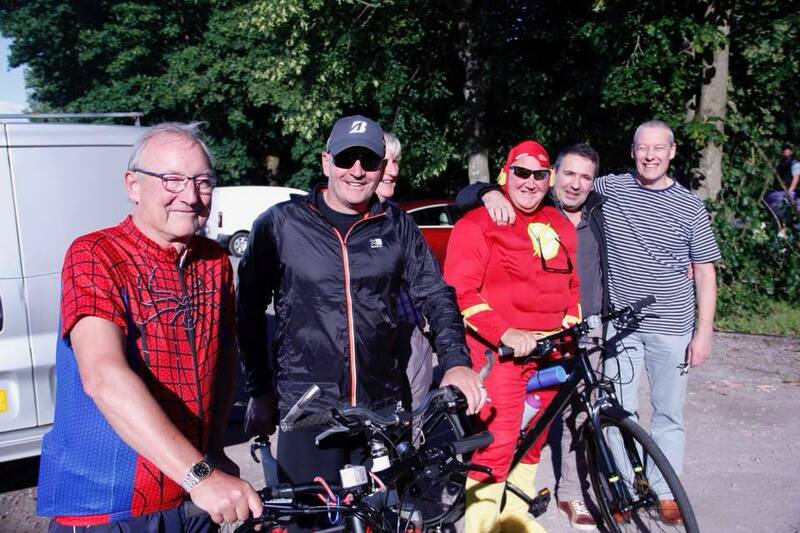 Twenty Brethren and family members participated in a fun night to raise funds for the PGL Holiday Accommodation Fund. 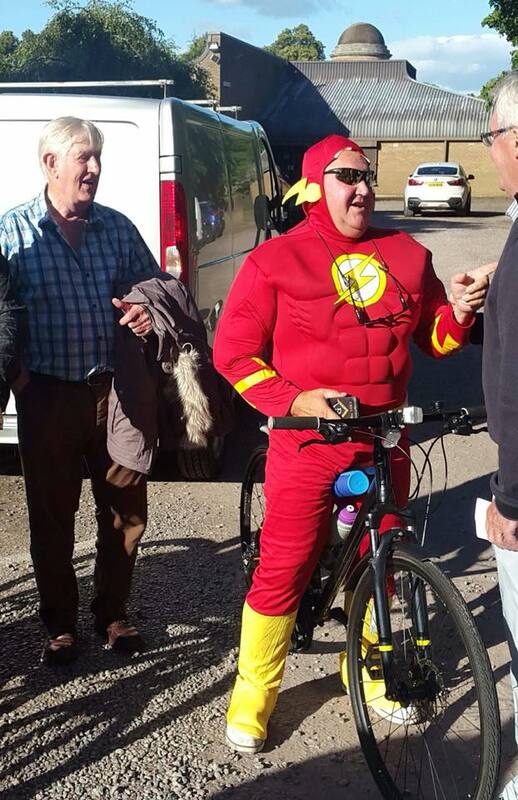 A big thank you to Bobby Ferguson, David Paterson and Willie Craig for the supply of water and chocolate goodies for the riders. 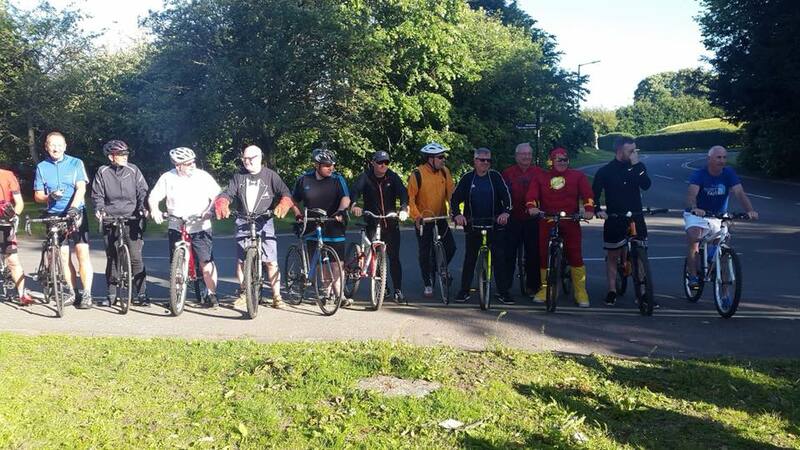 The Brethren taking part showed various degrees of skill and fitness, with some on completion of the course cycling home to East Kilbride and Airdrie, while some had to be helped to their cars!! A great night for a great cause, with final monies raised to be advised later. 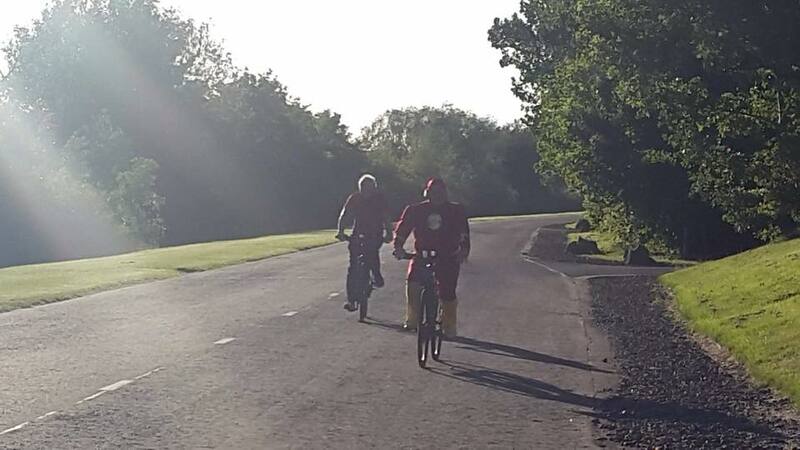 The evening was marred by a potentially serious incident where Flash Gordon and Spiderman were deemed to have used their superpowers to gain a unfair advantage, we will leave you with the photographic evidence to make up your own decision ? On behalf of PGL, PGM Bill Perry thanks everyone who took part. On Wednesday 20th June, RWM Bro. Craig Gibson of Lodge Airdrie St. John No. 166, welcomed RWM Bro. 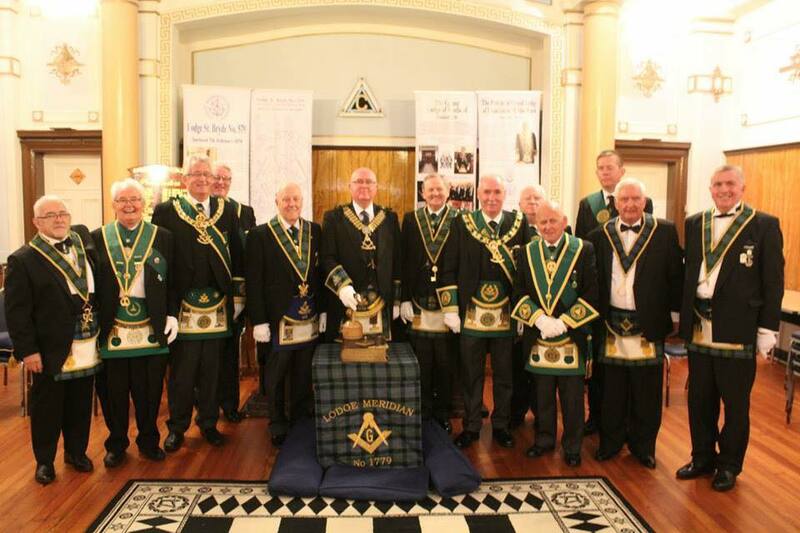 Walter Houston and the Brethren of Lodge Robert Burns No. 440. The Brethren of 440 conferred an excellent FC Degree on Bro. James Sneddon. RWM Bro. Craig Gibson then presented the PGM with a cheque for the Holiday Accommodation Fund, which was gratefully received. The Brethren then retired and enjoyed the usual excellent fare provided by the Lodge. 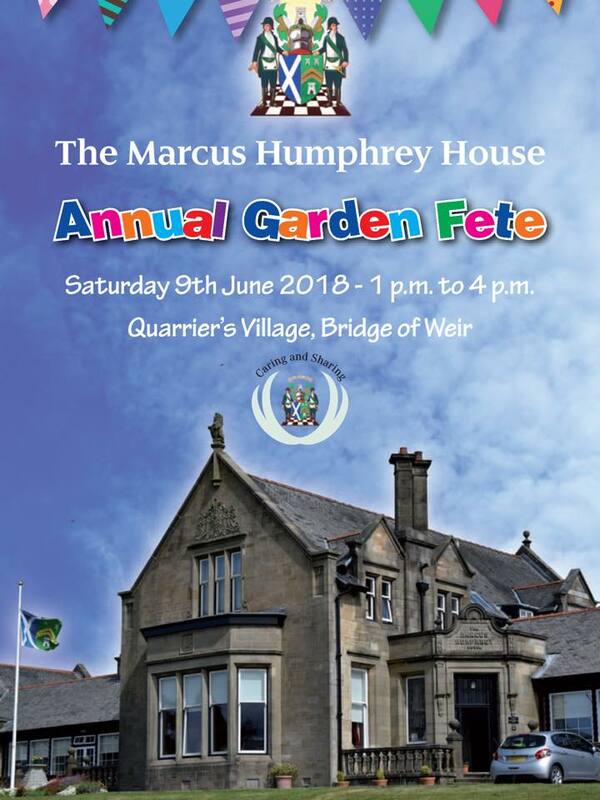 The annual Garden Fete at the Marcus Humphrey Masonic Home took place and was very well attended by a large number of Brethren from Lanarkshire Middle Ward, the day raised just over £6000, of which over £2440 contributed by the Middle Ward Brethren. 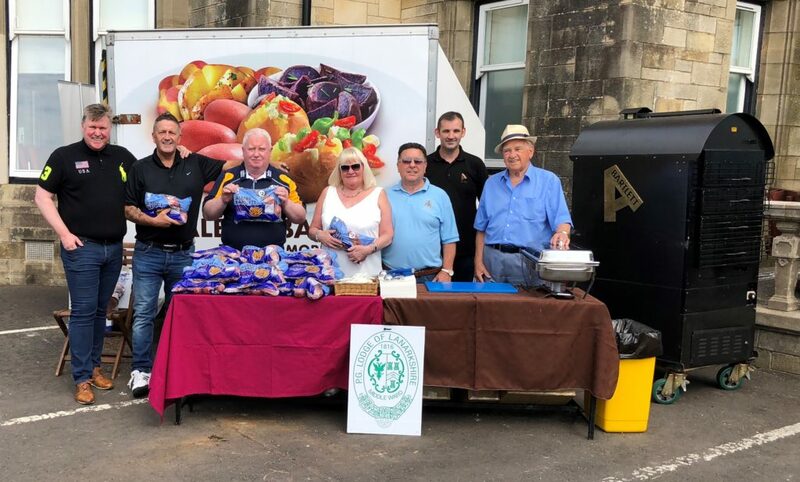 On the day there were a number of stalls and entertainment but more so a Wine stall, Baked Potato stand and Golf target area all arranged and managed by the Brethren from our Province, we are truly grateful for the services of Brothers Bobby Ferguson and Tom Reid for all their very hard work, time and enthusiasm they give supporting the Masonic Home. The Fete was opened in traditional style with Bro. Marcus Humprey MW Past Grand Master giving some very kind sentiments expressing how grateful he and Grand Lodge are for the support from all of the Brethren. The Widows Sons once again prepared, cooked and served the burgers and hot dogs at the BBQ. Bro Tom Reid and his wife Margaret worked tirelessly at the wine stall along with Brothers Robert Mudie and Alex Maitland and as well as managing the wine stall, a football card with a Gallon bottle of whisky as the prize was sold and the winning team was Derby and the winner was Bro, Andy McCulloch Lodge New Monklands No 88. 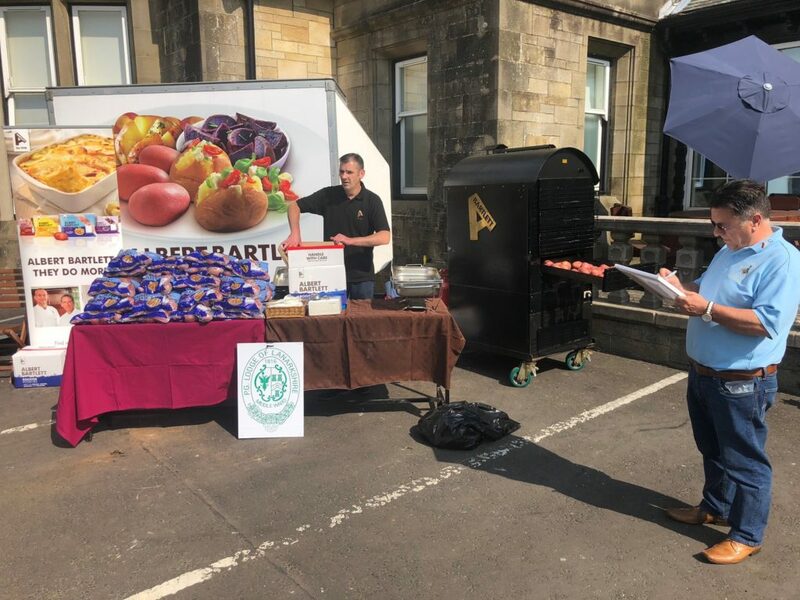 The Potato stand was arranged by Bro Colin Campbell PM Coltswood Glenboig No 1067 and was manned on the day by David Kyle and Bro. Gordon McLeod RWM Lodge Coltswood Glenboig No 1067. 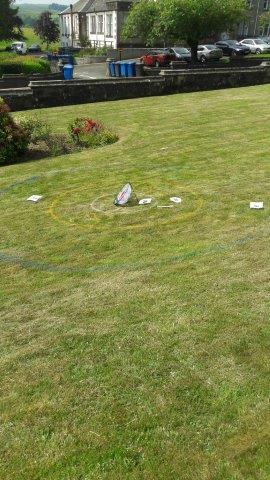 The new Golf target game introduced by Bro. 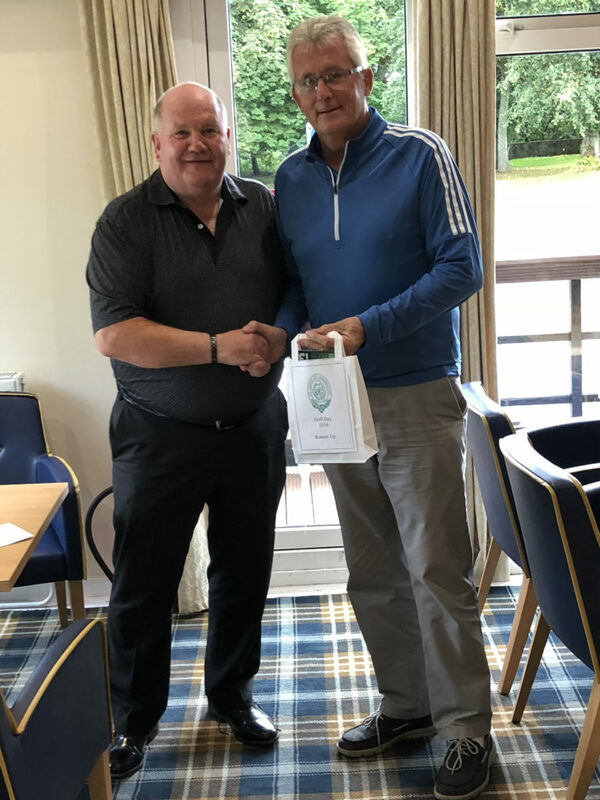 Bobby Ferguson was a good new addition to the Fete and objective was to score the most points with 6 balls in a zoned area, the winning prize was a 4 ball at The Carrick Golf Course near Loch Lomond. 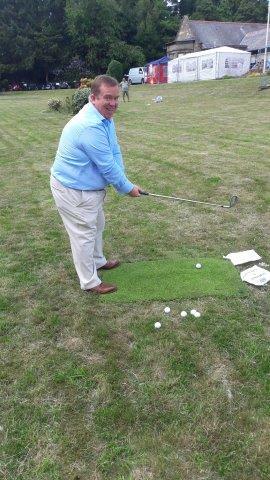 This was a close competition by a number of participants, but the worthy winner was none other than our own Provincial Grand Master Bro Bill Perry PGM of Lanarkshire Middle ward (honestly no skulduggery went on). Other stalls manned by other Provinces included a soft drinks stall, tombola stall, bedding plant stall and a small tea room. 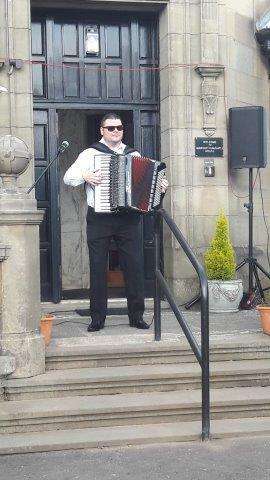 An accordionist and highland dancers entertained the residents, our members and their friends and families. The winner of the lucky Programme draw was a member from Mother Kilwinning No 0 the programme number was 45, Bro David Bloomfield PPGM collected this on the brothers behalf. 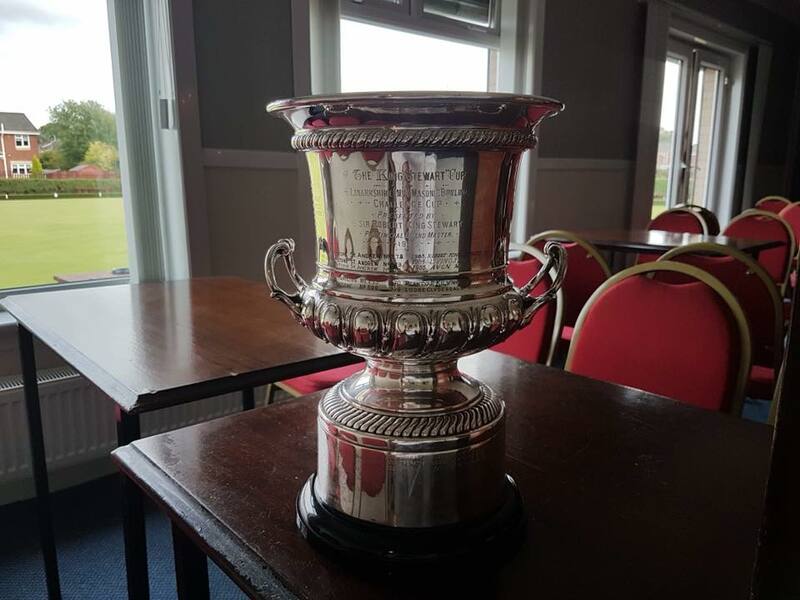 A special thank you is sincerely expressed from the Province to Bobby Ferguson, Tom Reid, Margaret Reid (Tom’s wife), Alex Maitland, Robert Mudie, Gordon McLeod & David Kyle fro their hard work not just on the day but also in the preparation. 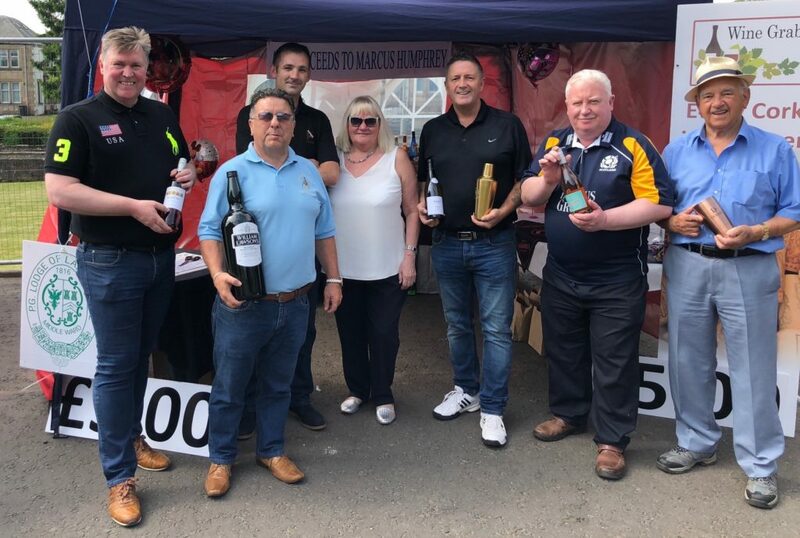 Brothers Bobby and Tom would also like to thank everyone for their wine donations and taking the time to attend and support the Masonic home and with all your support the Masonic Home fund is now £6,000 better off. A big thank you to RWM Bro. Phil Biggerstaff and the Brethren of Lodge Robert King Stewart No. 919 for the generous donation to the Holiday Accommodation Fund. 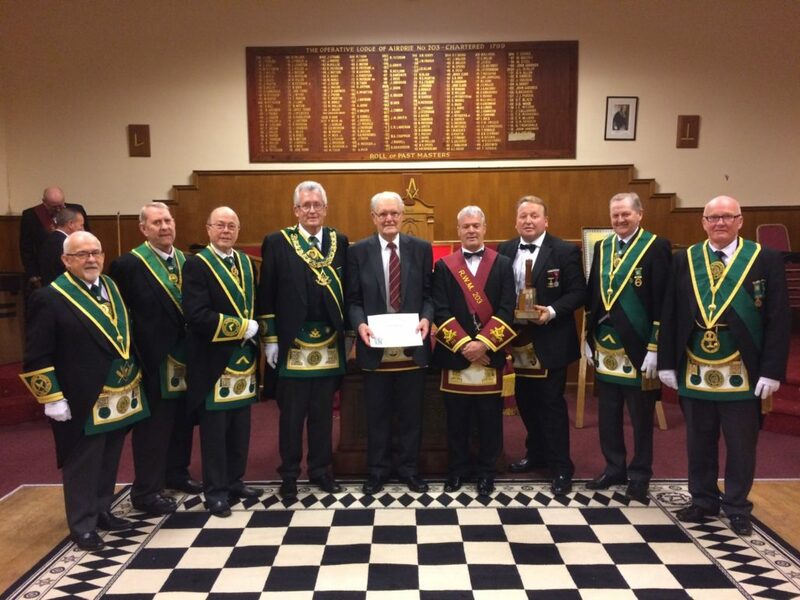 In April, the Lodge held a Reigning Masters Degree which raised £550. 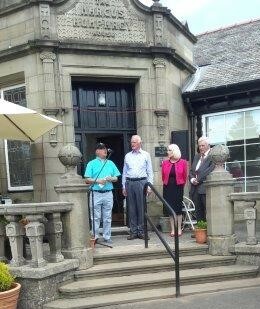 The Lodge then donated a further £450 and on Wednesday 6th June, presented a cheque for £1000 to the PGM for the Fund. On Friday 7th June, Bro. 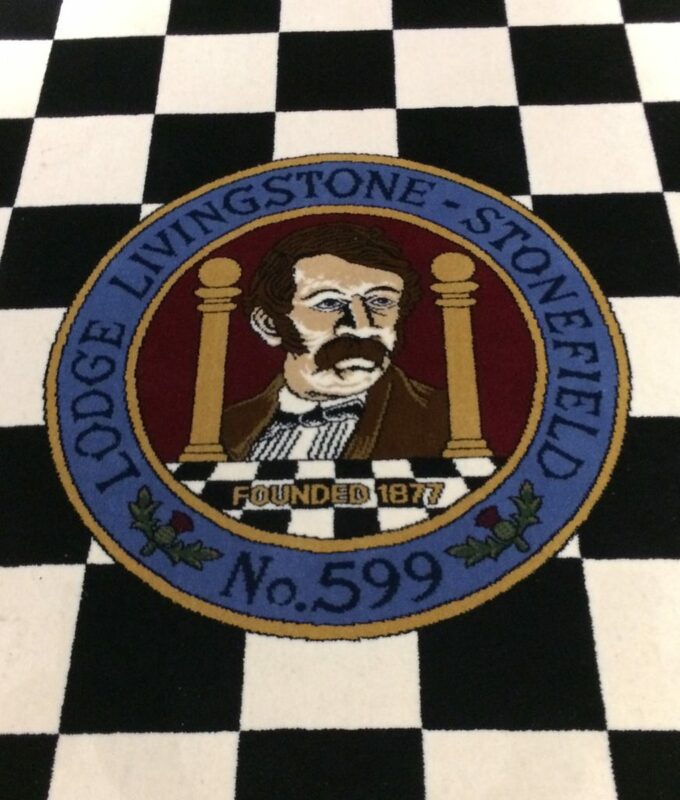 Bill Perry PGM and a large Deputation from Provincial Grand Lodge attended Lodge Livingstone Stonefield No. 599. RWM, Bro. Malcolm McCormack extended a warm welcome to all. 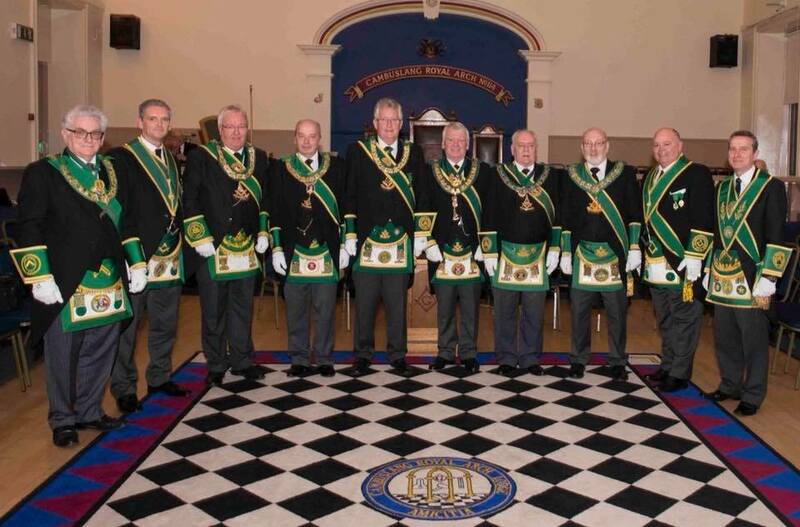 PGL had been invited by the Brethren of the Lodge to Dedicate the new Lodge Carpet. The Ceremony of Dedication was carried out in an expert manner by Bro. Jim Ferguson, Senior PG Chaplain. The Lodge was then closed and Bro. Jim Vasey, Junior PG Chaplain delivered an excellent lecture on the “Temple” which was well received by the Brethren. 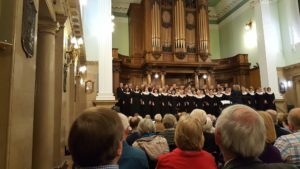 £400 was raised on the evening for the Masters Charity, Erskine Hospital. On Wednesday 6th June, PGM Bro. Bill Perry and a fine Deputation from Provincial Grand Lodge attended the Meeting of Lodge Robert King Stewart No. 919. RWM Bro. Phil Biggerstaff gave a warm welcome to all. An excellent MM Degree was conferred on Bro. Stephen Speirs by the Wardens of the Lodge. The evening was then enhanced when Bro. Eric Brown received his 50 year Diploma from Bro. Alex Watson, the IPM of his Mother Lodge, Lodge Hamilton No. 233. Bro. Brown thanked both Lodges for their support and friendship over the years. On Friday 1st June, Provincial Grand Lodge held their Communication at Lodge St. Clair No. 427 and the PGM gave a warm welcome to a packed Lodge room. A Memoriam Service was held to celebrate the life of the Past SPGM Bro. David Lindsay, a PM of Lodge Motherwell Caledonian No. 1228, who had died in April. 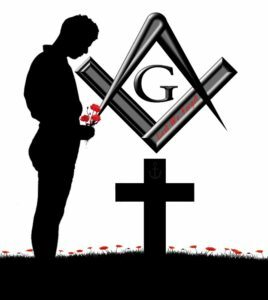 A fitting tribute was given by the PGM and the Brethren of the Province stood in silence as a mark of respect for our departed Brother. Bro. Kenny Bogle PM of Lodge Livingstone St. Andrew No. 573 and Bro. Bill Jackson PM of Lodge Livingstone Stonefield No. 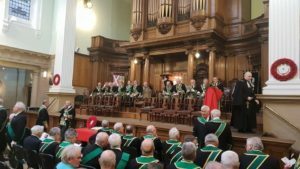 599, each received the rank of Honorary Provincial Grand Junior Deacon. The Meeting was closed with thanks to the RWM and Brethren of Lodge St. Clair No.427 for the use of the Temple and for the excellent buffet and refreshments provided. Bro. 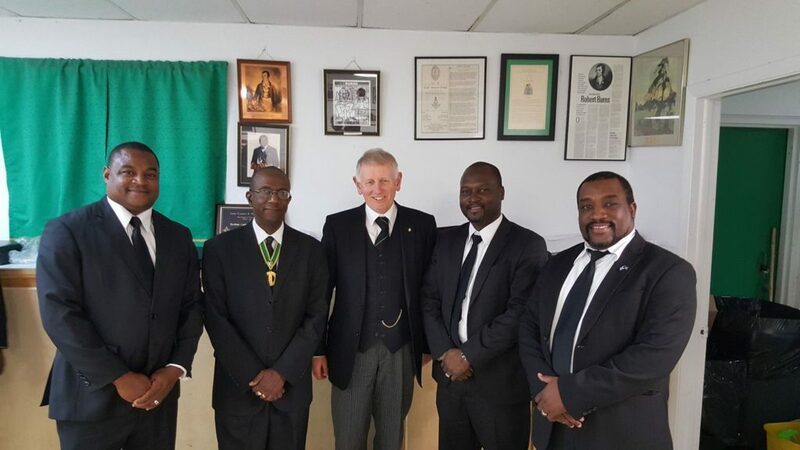 Tom Davidson IPPGM attended the communication of the District Grand Lodge of the Bahamas on Saturday and was given a warm reception by Bro Joe Curry RWDGM and the brethren of the district. During the meeting the new DDGM and a DG Chaplain were installed along with a number of officebearers. The new DGL standard was unveiled and dedicated. Following the conclusion of district business, Bro. 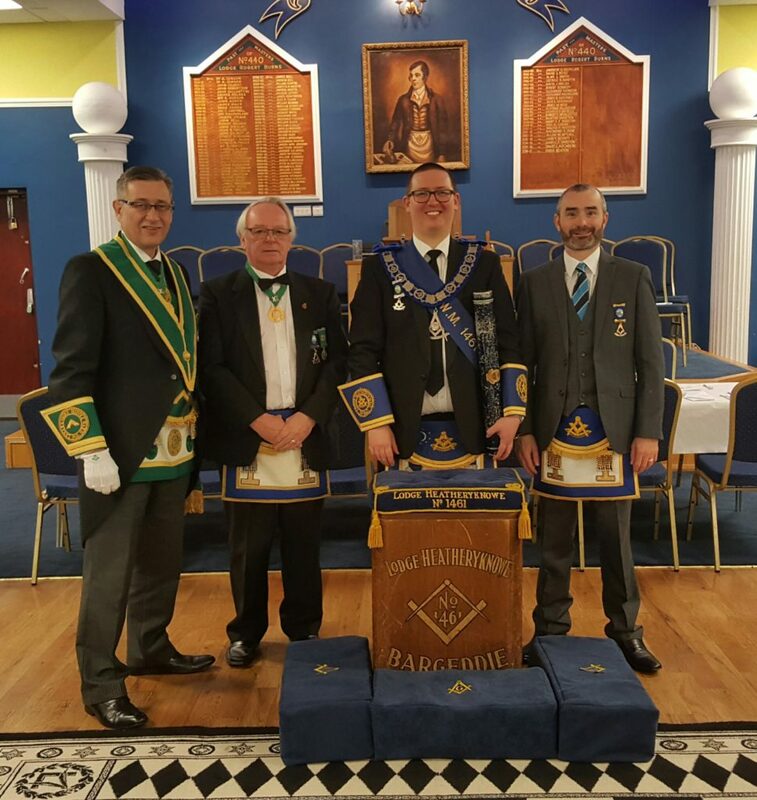 Tom Davidson was invited to address DGL on the subject of the Proxy system and the close relationship between the DGL and the PGL of Lanarkshire Middle Ward. At the end of the meeting Bro. Tom Davidson had honour conferred on him of being made Honorary District Grand Senior Warden. The brethren retired to harmony, a harmony which was extended by a tropical downpour. IPPGM with Bro. Edgar Moxey PDGM and his father (93 years of age) and his nephew. Bro. Tom Davidson, IPPGM joined a deputation headed by Bro. Joseph R Curry, RWDGM of the Bahamas. The deputation included a number of PDGMs and commissioned officebearers. The RWM of Lodge Claudius R Walker No 1808 have a talk on The Essense of Amity from which a lively discussion arose. After the meeting the brethren retired to harmony. 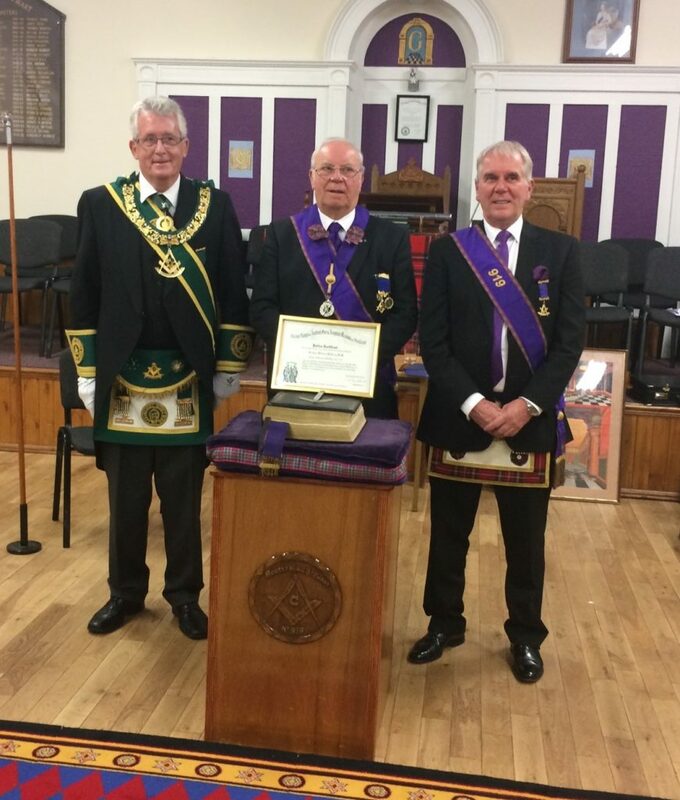 The IPPGM gave fraternal greetings on behalf of the RWPGM and brethren of Lanarkshire Middle Ward, these wishes were reciprocated. In the attached photo the IPPGM is flanked by the RWDGM and the RWM of Lodge St.Anne’s with two on his lodge brethren. 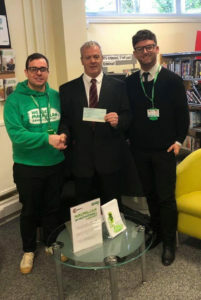 RWM Brother Bill Lang had the pleasure of presenting a cheque for £300 to the Averon Centre in Hamilton, the Lodge has supported this well deserved charity for several years. Well done from all at Provincial Grand Lodge. Lodge St. Thomas No. 306 held their Annual Divine Service on Sunday 20th May. RWM Bro. 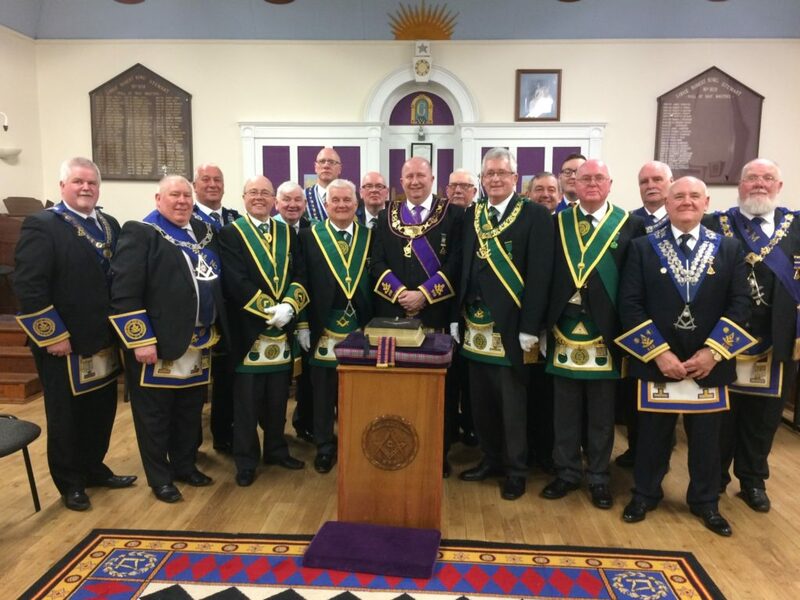 Eric McPhee gave a warm welcome to the Brethren of 306 and to the visitors who were present, including seven members of Provincial Grand Lodge. Bro. 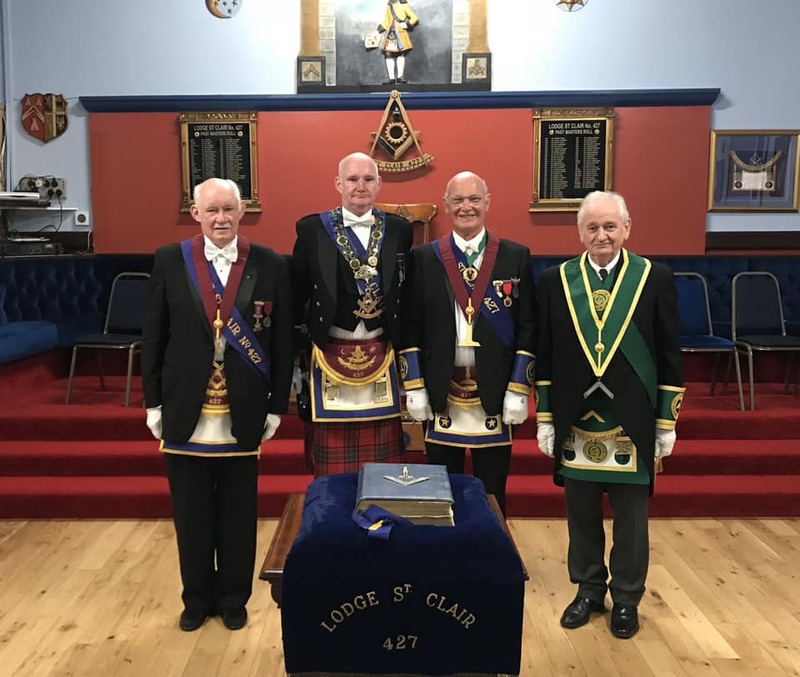 Robert H Allan PM of Lodge 236 again conducted the service and the Lodge thank him for once again performing these duties. Bro. Tom Davidson IPPGM headed a large deputation from PGL Lanarkshire Middle Ward into Lodge Hamilton No.233 where they were warmly welcomed by Bro. Alex Watson PM the acting RWM. 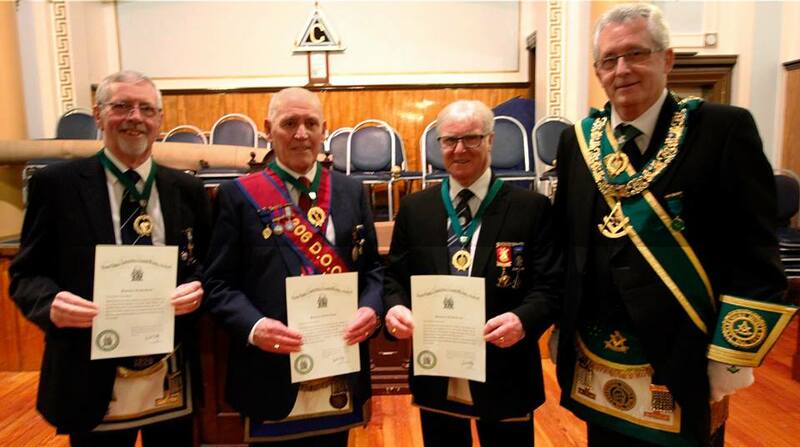 Whilst there they witnessed a fine MMM degree by the lodge officebearers on two candidates. 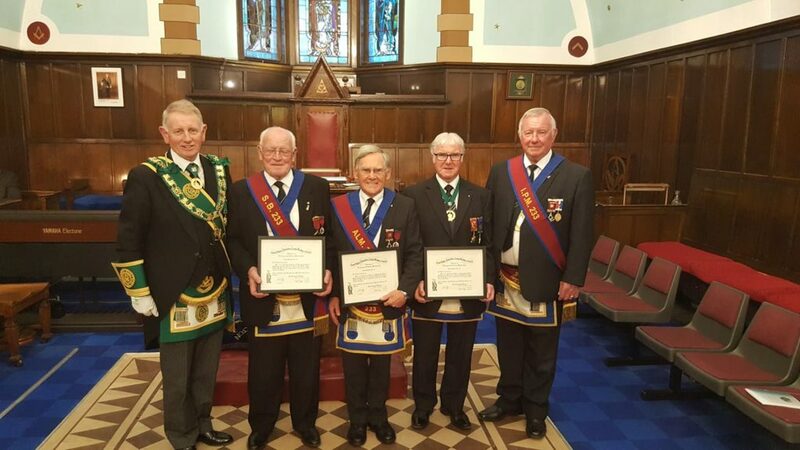 Following the degree, three Distinguished Service Membership certificates were presented to Bros. Jim Dorricott , Scott Campbell PM and Bobby Jenkins. This years event will follow a similar format to the very succesful previoius year and is open to Bretherm friends and families. 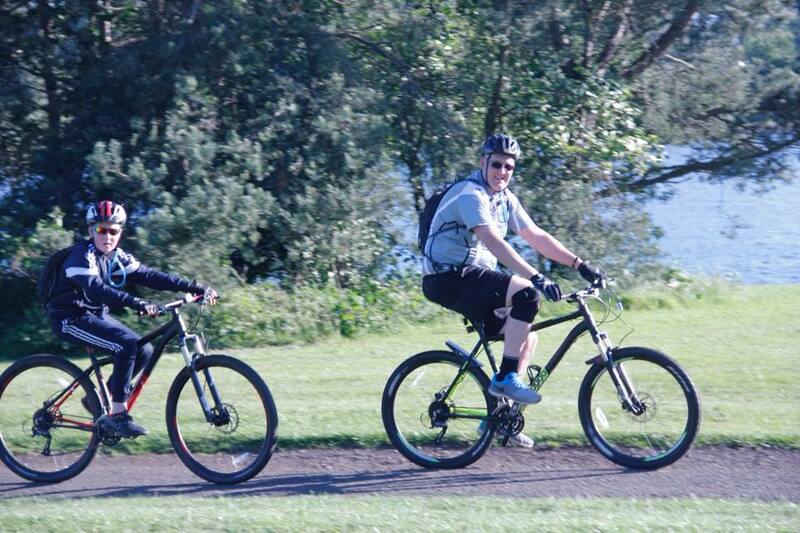 The official start will be from Golf Driving Range at Strathclyde Park at 7pm. Here’s to another great evening of family participation. 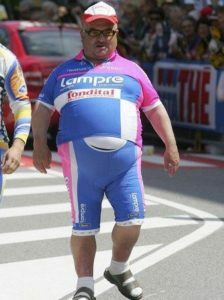 As with other years, any sponsorship monies will be gratefully received. The joint Annual Divine Service of Lodge Blantyre Kilwinning No. 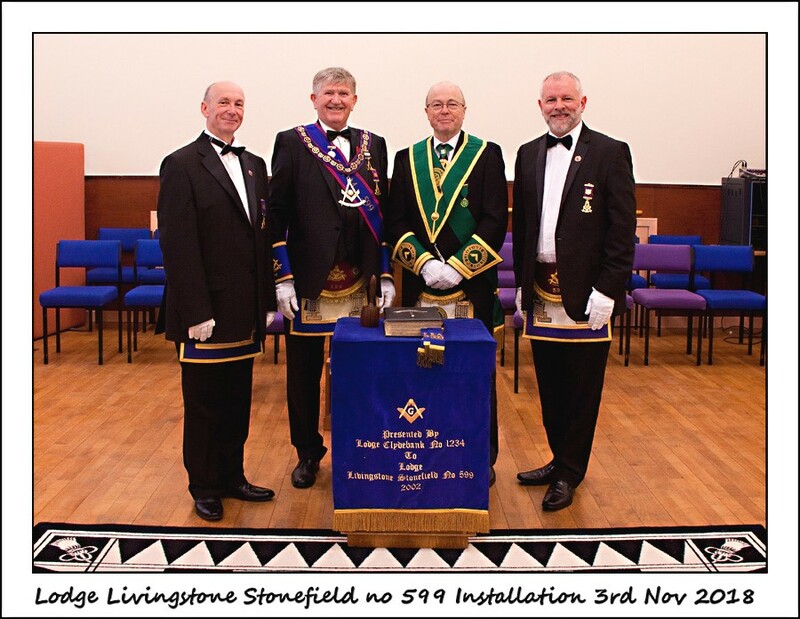 557 and Lodge Livingstone Stonefield No. 599 was held on Sunday the 13th May at Blantyre Old Parish Church. The Rev Sarah Ross gave the Brethren and the visitors a warm welcome to the Church and delivered a very interesting Sermon. Both RWM’s, Bro. William Downie of 557 and Bro. Malcolm McCormack thanked the Minister and all who had attended for an excellent evening of fellowship. 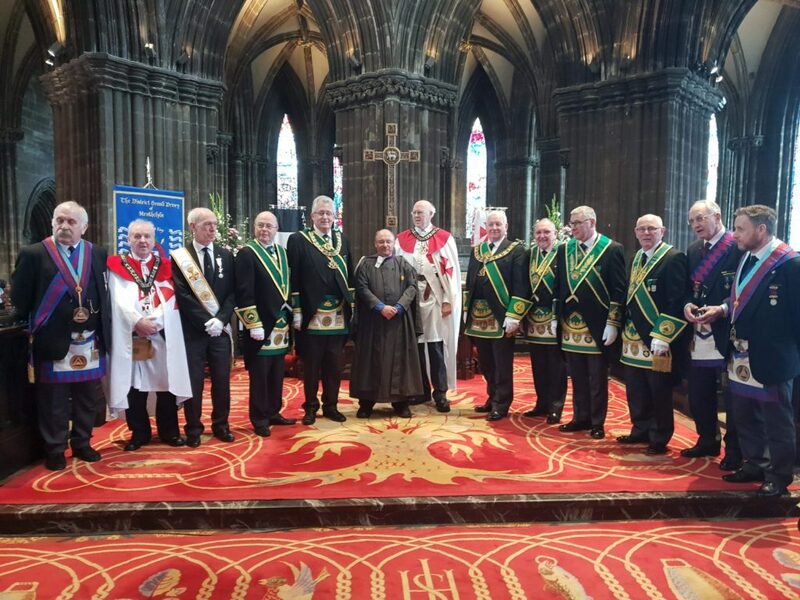 The Annual Divine Service of the “The District Grand Priory of Strathclyde” of the “Order of the Temple” was held at Glasgow Cathedral on 6th May. 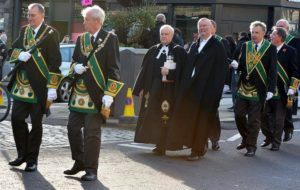 The “Right Eminent District Grand Prior” , Robert S M Stewart led a large Deputation of his Members and visitors to the Cathedral. Prostate cancer can affect 1 in 10 men in Scotland and is the most common cancer amongst men in Scotland. Whilst the number of people diagnosed with prostate cancer in Scotland is increasing, so have survival rates, especially when symptoms have been recognised, an early diagnosis made and treatment started. Worryingly though, not all men will have any symptoms in the early stages. Some men may have this condition in later years without it leading to any problems. 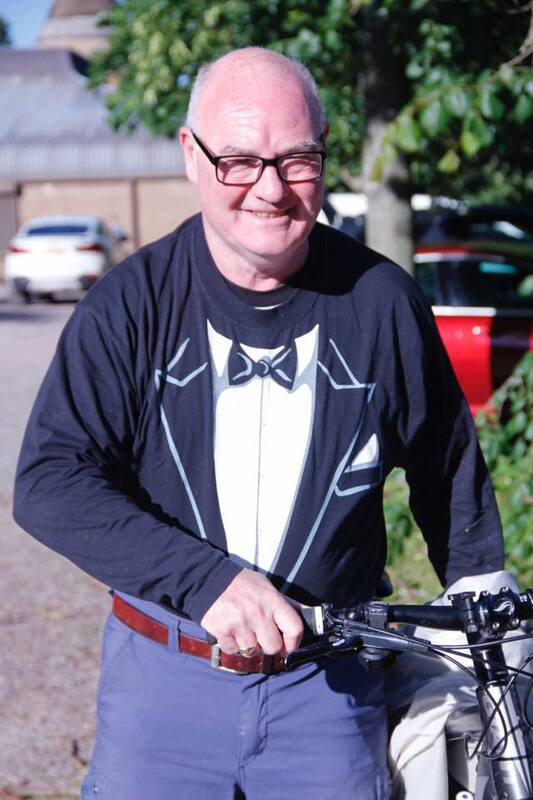 Most of of you will not be aware but Past Master Kenny Murray of Lodge Coltswood has been going though treatment for Prostate Cancer, unfortunately he was also accompanied on his journey by various other Brethern from our Provice. During his treatment he was asked if he would like to participate in a documentary of 4 patients receiving the different types of treatment available for Prostate disease. As we are all aware, with the focus and awareness campaigns on the disease by Prostate Scotland and the charity work by our Province and Freemasnory in Scotland, awareness and having the confidence to make the approach to your doctor is critical.The episode was part 2 of a 3 part series on different types of cancer and was aired last Monday evening on BBC. 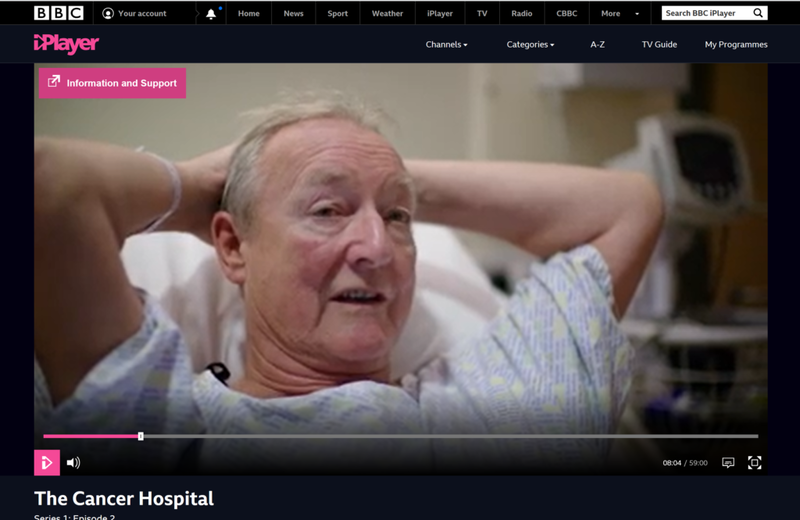 For those who havent seen it, the link below will take you to Cancer Hospital series 2 on the BBC iPlayer. The episode features Bro. 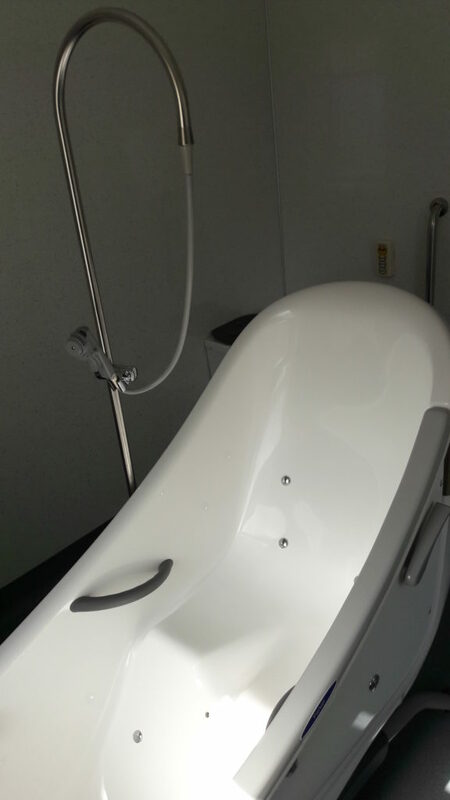 Kenny and his wife Pat on their journey, detailing the treatment stages. 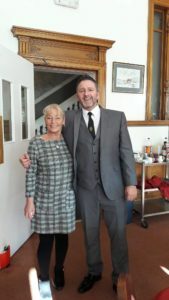 For those of you know Kenny, he came across as the legend that we have all grown to respect and are proud to call our Brother and friend, well done from all in Lanarkshire Freemasonry on your positive approach and perspective and we hope your recovery continues. Kenny has openly admitted that if his TV stardom help others awareness of this disease then he will have succeeded in his aim. Well done also to Pat, his wife for her very difficult interview of her little boys illness, you did us all proud as always. Congratulations to RWM Bro. 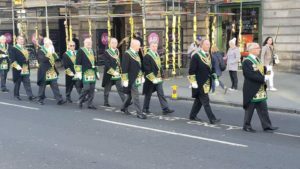 Duncan Mulholland and the Brethren of Lodge St. Bryde No. 579 who held an Open Day on Saturday 5th May. 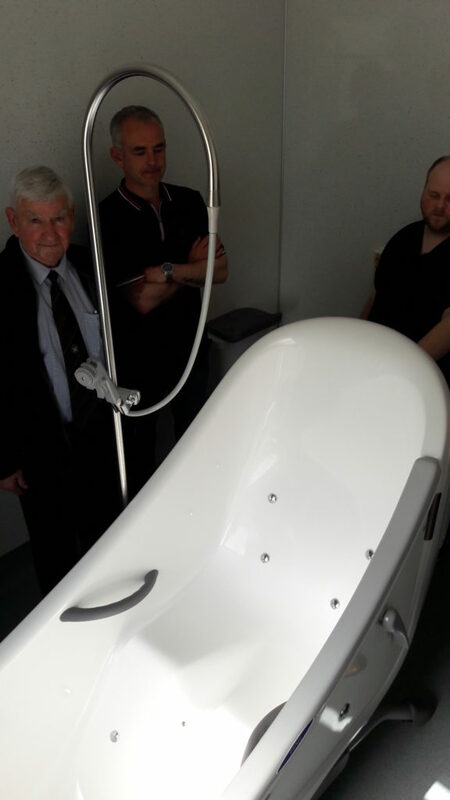 A great deal of planning and effort is needed to make a success of any event and it was very evident that the Brethren of the Lodge had gone the extra mile to ensure that all aspects of our Craft were on view to those who attended, members and public alike. The day commenced with Bro. Boyd Tunnock officially declaring the event open, very fitting for two organisations who have been part of the Uddingston community for such a long period. Special thanks to Bro. Stuart Jack PM for the excellent talk and presentation of the Brethren of the Lodge who served and did not return from the Great War. All in all a great advertisement for Lodge St. Bryde and Freemasonry. 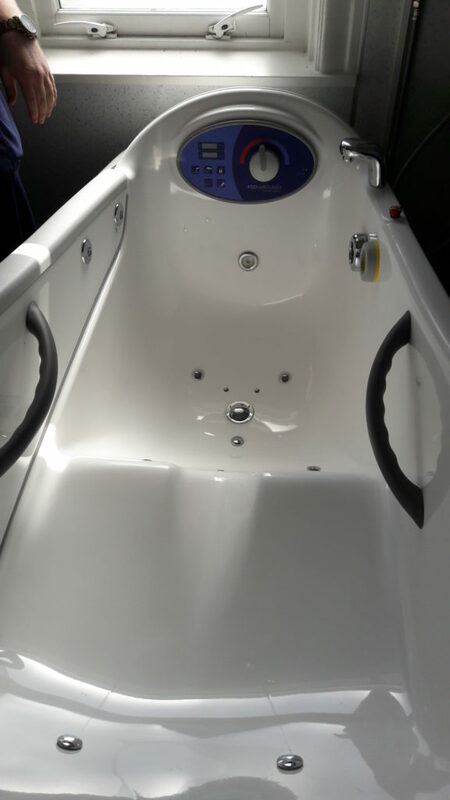 The new therapeutic bath has been installed and the full bathroom has been refurbished with new wall panels, linoleum, toilet, wash hand basin etc. 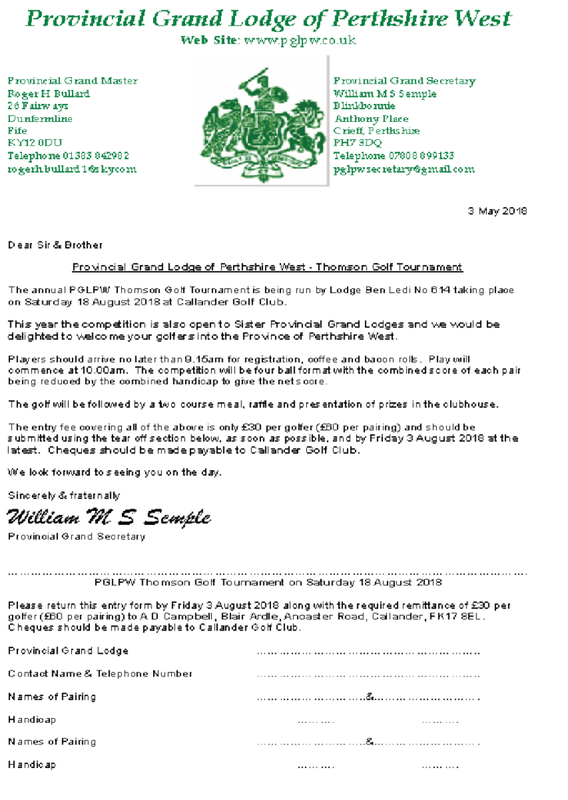 The Pro-Am /Celebrity golf has been confirmed for the 9th September at Kirkhill Golf Course Cambuslang and a letter from Bro. 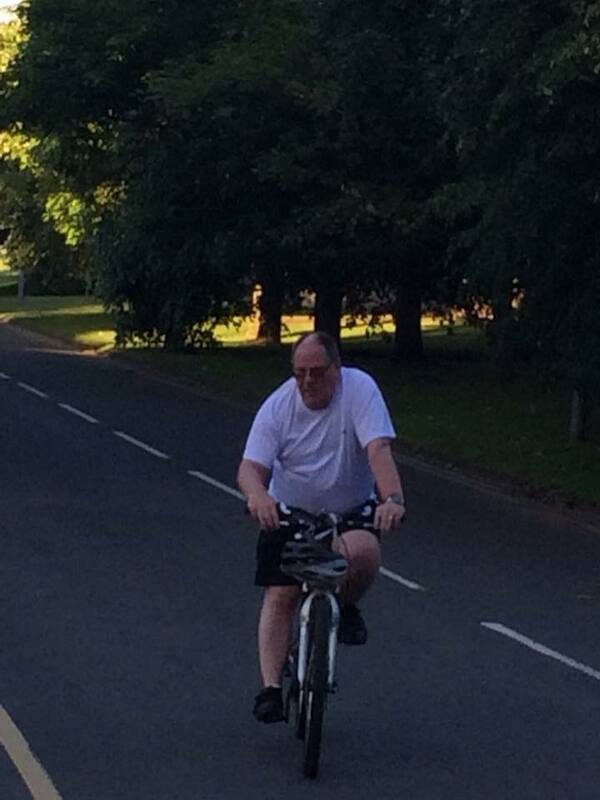 David Reid will be sent to all the PGL Secretaries to cascade to the daughter lodges. Bro. Tom Reid and his wife Margaret have donated a Gallon bottle of whisky fora football card at £5 a team, these are going fast contact Bro Tommy or Bobby for details. 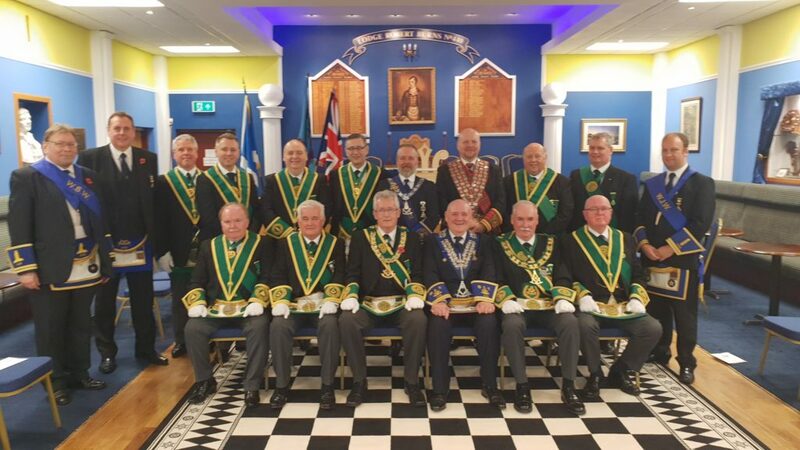 The – Provincial Grand Lodge of Lanarkshire Upper Ward Installation of Office Bearers was held in Carluke on Friday 4th May. RWPGM, Bro. Alex Thomson gave a warm welcome to the Brethren who were in attendance. Bro. Bill Perry PGM had the honour of heading the Deputation of the visiting Sister Provincial Grand Lodges. Lanarkshire Middle Ward were well represented, with ten members being present. Following a very successful Installation, the Brethren enjoyed a fine meal and Upper Ward hospitality. 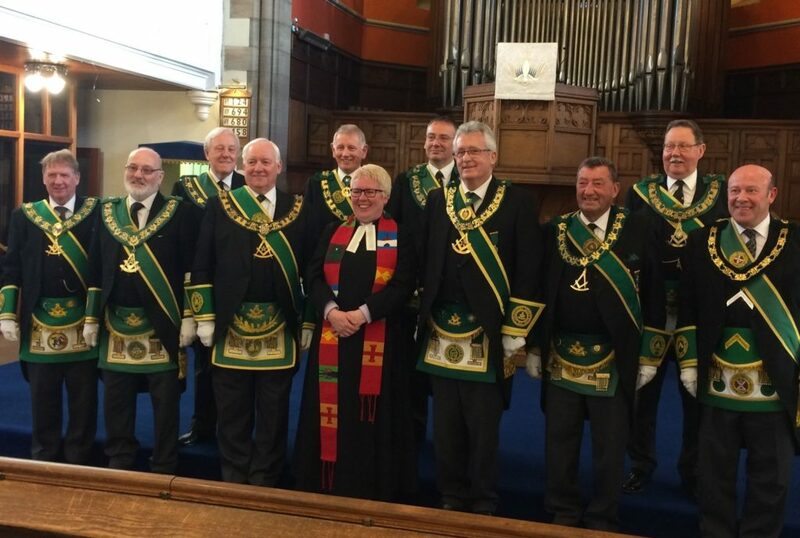 The Annual Divine Service of Provincial Grand Lodge was held at Uddingston Old Parish Church on Sunday 29th April. The Rev. Fiona McKibben once again conducting the Service and delivering the Sermon. Bro. Bill Perry PGM was delighted with the turnout of Brethren from Lanarkshire Middle Ward and from the visiting Provinces. Our thanks to the Minister, Session and congregation of the Church for allowing us to worship in their beautiful Church, with a special thank you, to Bro. Douglas McBay for playing the organ at the Service. On Friday 27th April, Lodge Robert King Stewart No. 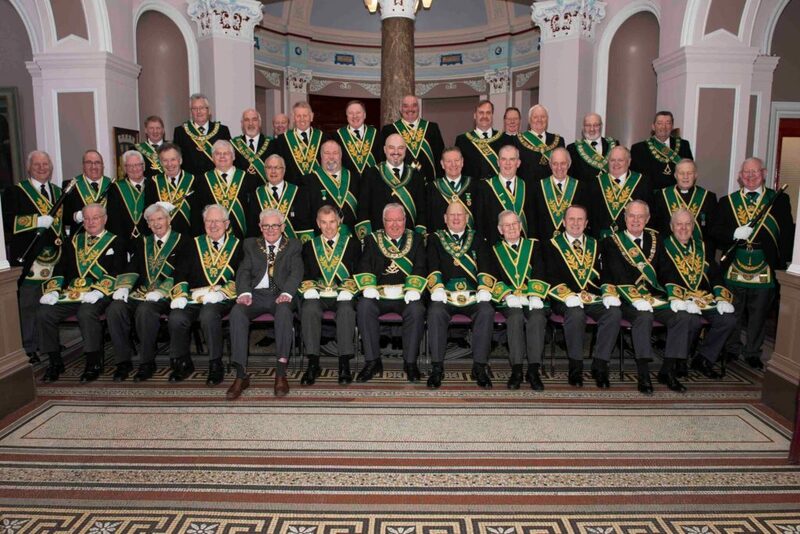 919 held a very special Reigning Masters Degree with 97 Brethren in attendance. The Reigning Masters Deputation was led by the Provincial Grand Master, Bro. Bill Perry. Also in attendance was a large Deputation from PGL headed by DPGM Bro. Andrew Millar. The Reigning Masters conferred an excellent EA Degree on one Candidate. The RWM of Lodge Robert King Stewart, Bro. 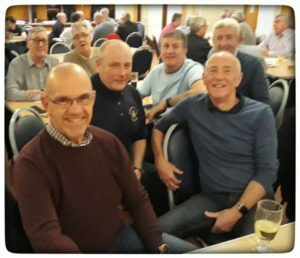 Phil Biggerstaff had arranged this Meeting to raise funds for the PGL Holiday Accommodation Fund and on the night the sum of £550 was collected. Provincial Grand Lodge would like to congratulate and thank Bro. Biggerstaff and the Brethren of 919 for this initiative and for the monies raised. Duncan Mulholland No. 579, Hugh Syme No. 7, Kenny Mason No. 88, Norman Carnegy SPGM, Archie Sands No. 31, Alan Graham No. 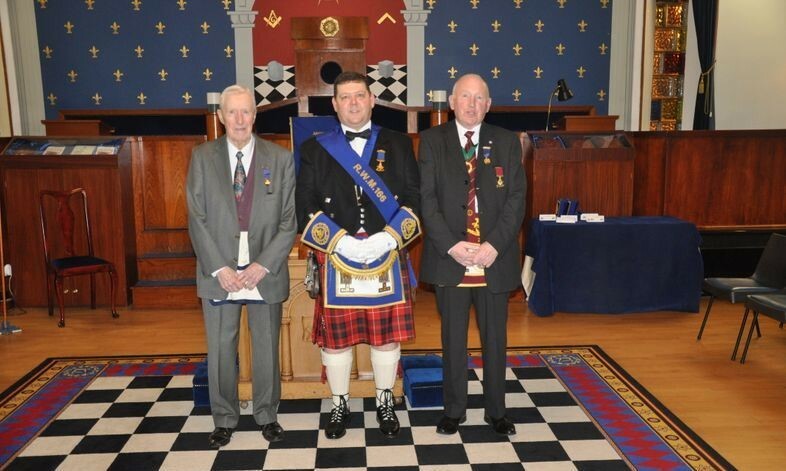 1513, Andrew Millar DPGM, Tom Woods No. 1126, Phil Biggerstaff No. 919, Derek Douglas 1096, Bill Perry PGM, Pringle Johnstone No. 1314, William Downie No. 577, Jim Vasey Junior PG Chaplain, James Gardner No. 573, Walter Houston No. 440, David Yule No. 305. Bro. 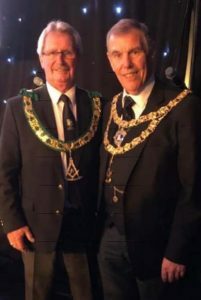 Tom Davidson IPPGM and Bill Craig PG Secretary represented the province at the quarterly communication of PGL Ayrshire in Kilmarnock. There was an excellent attendance of both brethren of the province and deputations from three sister provinces. This was the first PGL communication since the installation of the Bro. William C Steele as RWPGM in March. The deputation of sister PGLs was headed by Bro. David S Irving DPGM of PGL Dunbartonshire. Bro. 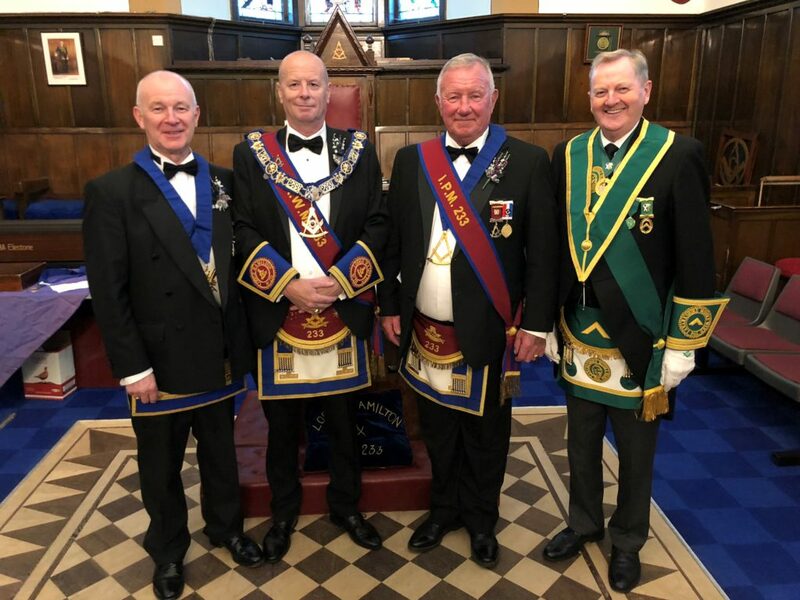 Tom Davidson IPPGM, Norman Carnegy SPGM and Bill Craig PG Secretary represented the province at the Annual Spring Divine Service of PGL Ayrshire in St. Andrew’s and St. Marnock’s Parish Church in Kilmarnock. There was an excellent attendance of both brethren of the province and visitors. The service was taken by the church minister and two of the PG Chaplains. Afterwards the brethren returned to the church halls for a first class spread provided by Lodge St. Marnock. Our representatives Bro. Bobby Ferguson and Bro. Tom Reid are planning to run the highly successful wine cork stall again this year and would like to appeal to the daughter Lodges to make any donation of wine that they can, both were indebted to support of all the lodges and friends who contributed last year, this event is scheduled between 2-4pm and open to all Brethern, friends & families, please come along and support this great cause. 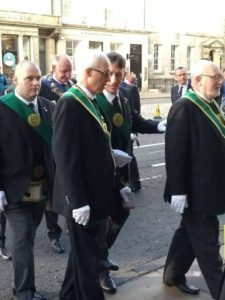 On Sunday 15th April, the joint Annual Divine Service of Lodge Hamilton No. 233 and Lodge Hamilton Kilwinning No. 7 was held at Hamilton Old Parish Church. The service was conducted by Rev. Ross Blackman, the Minister of the Church. Bro. Alex Watson IPM and Bro. Hugh Syme RWM read the Lessons. A large Deputation from Provincial Grand Lodge were in attendance. On Thursday 12th April, a large Deputation from PGL headed by Bro. 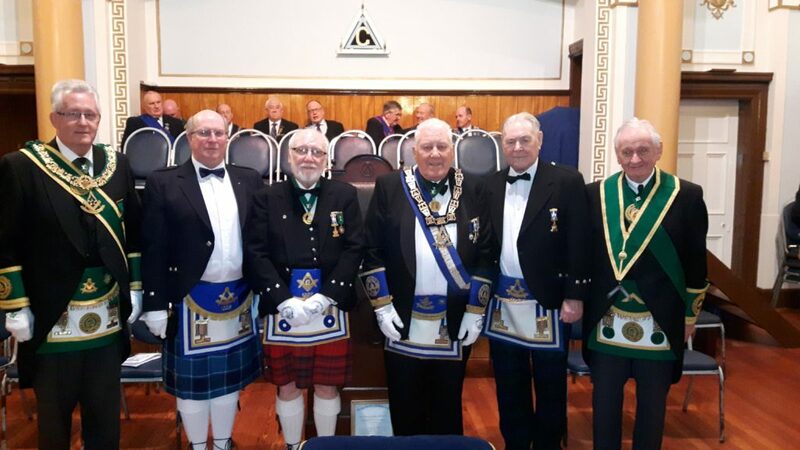 Bill Perry PGM attended Lodge Blantyre Kilwinning No. 557. Also in attendance was a Deputation from Lodge St. Clement Riccarton (Kilwinning) Kilmarnock No. 202.RWM Bro. William Downie gave a warm welcome to the Deputations. The Gavel being handed over, the PGM had the great pleasure of presenting two worthy Brethren with Distinguished Service Diplomas, Bro. Tom Downie and Bro. Robert Lees. The PGM gave the assembled Brethren a brief history of the Masonic careers of both Brethren and together with the RWM Bro. William Downie and Bro. Jim Lees PM Sec, presented the Diplomas. Both Brethren suitably replied. The RWM of Lodge 202, Bro. David Lloyd and his Office Bearers then conferred an excellent FC Degree. At the close of the Meeting, the Brethren enjoyed some 557 hospitality. Alex Kelly SPGM, Colin Dunbar RWM 551, Bill Perry PGM, William Downie RWM 557, Tom Downie DM, Robert Lees MM, David Lloyd RWM 202, Tom Davidson IPPGM, Angus Ross SPGM, Jim Lees PM Sec. Bill Perry PGM, William Downie RWM 557, Tom Downie DM, Robert Lees MM, Jim Lees PM Sec. 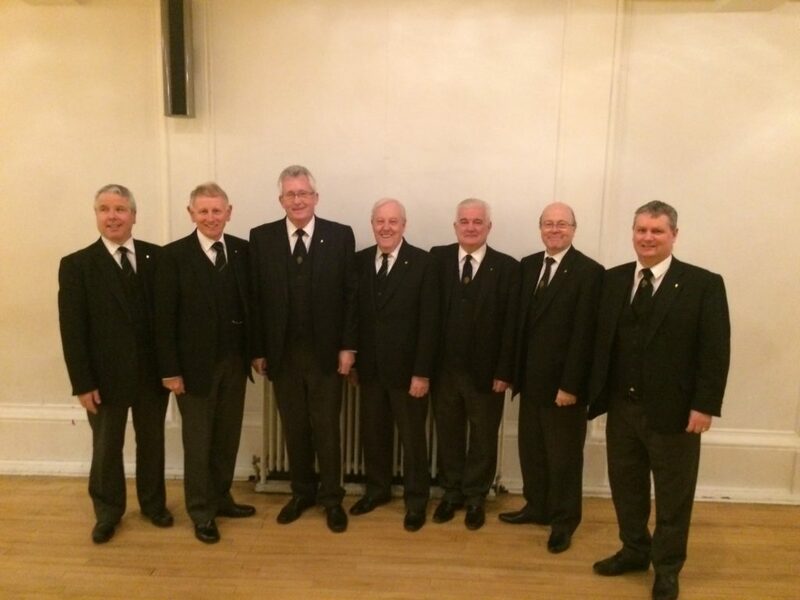 On Friday 6th April, the Installation of the PGL Office Bearers was held at Tabernacle Lane, Cambuslang. A large Deputation from our Sister Provinces, headed by RWPGM Bro. 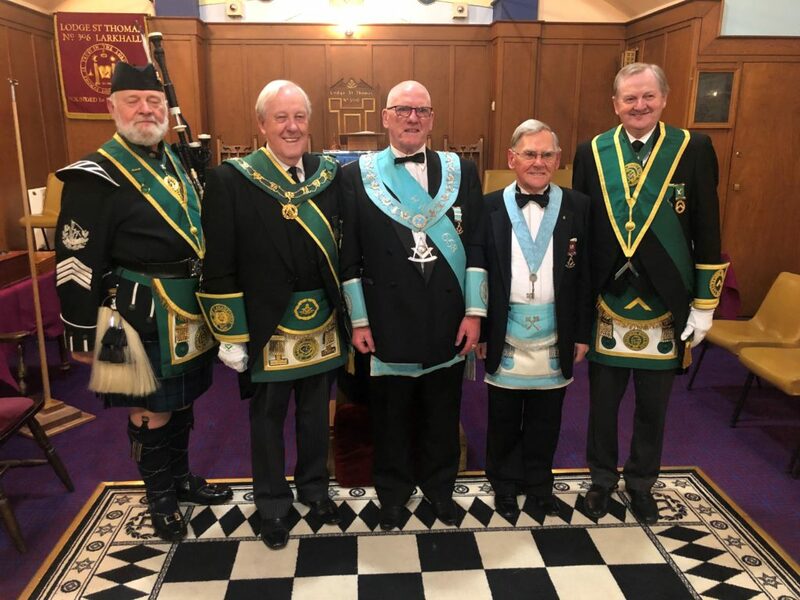 Russell Logan of the Provincial Grand Lodge of Perthshire East were in attendance together with great support from our own Lodges. The Ceremony was conducted to the highest of standards by SPGM Bro. 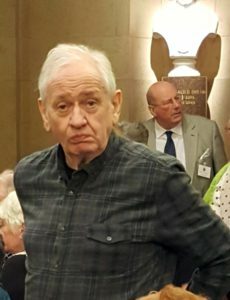 Norman Carnegy, SPGM Bro. Alex Kelly and PPGSW Bro. Alex Hamilton. On the completion of the installation, Bro. John Cranston Brown, Iain, who has completed 21 years in PGL, was presented with his PPGSW Jewel, Regalia and Certificate as a mark of respect and thanks for his service to PGL. Following the close of the Meeting, the Brethren enjoyed a fine meal and PGL hospitality. 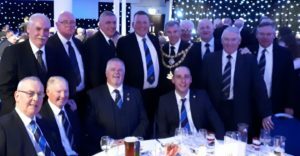 The RWM and Brethren of Cambuslang Royal Arch Lodge No. 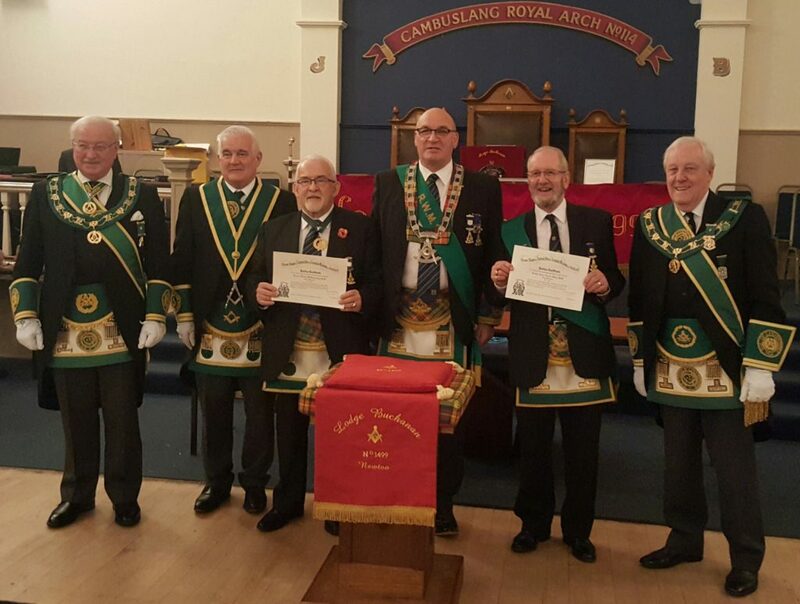 114 were thanked for the use of their Temple and the Members all three Cambuslang Lodges were thanked for acting as Stewards on the night. 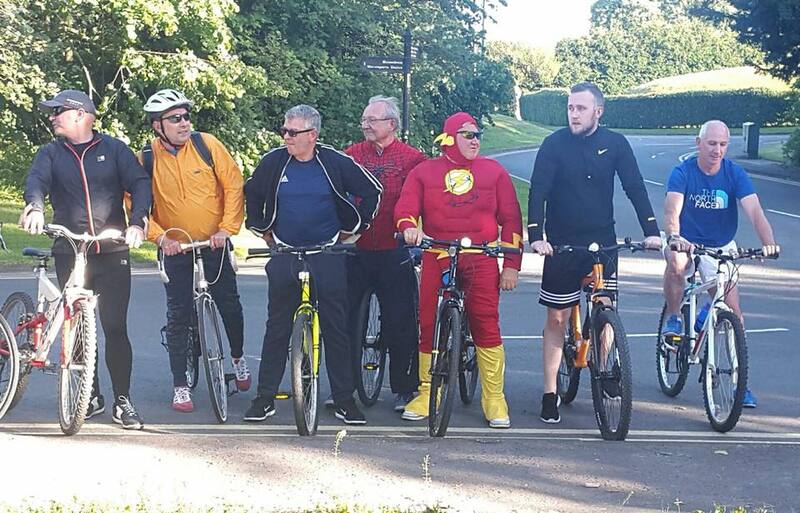 Its the the long awaited return of the sporting occasion in the Province where middle age Brethern from the Province can slip into their Lycra once again, the fun cycle around Starthclyde Park. This years event will follow a similar format to the very succesful previoius year and is open to Bretherm friends and families. 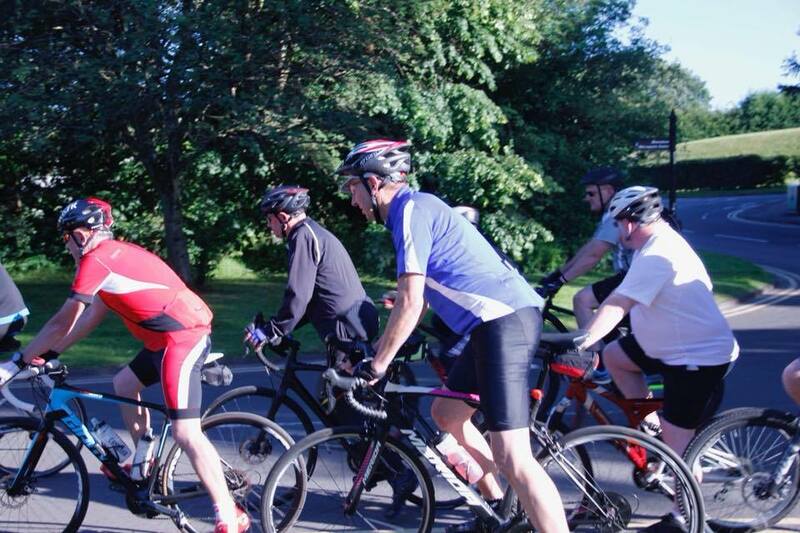 The official start will be from Golf Driving Range at Strathclyde Park at 7pm, the course will consist of 3 times round the park, 11 miles for the athletes or any other distance that the competitors can complete, as its the taking part that counts. On Saturday 24th March, at the Walker Hall, Troon, Bro. William Caven Steel (Billy) was Installed as the RWPGM of Ayrshire by the MWGMM and the Office Bearers of Grand Lodge. 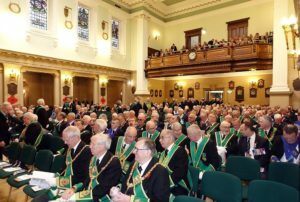 The Brethren of Ayrshire and the visiting Provinces attended in large numbers to support Bro. Steel and his Commissioned Office Bearers. Following the close of the Meeting, the Brethren enjoyed and excellent meal, hospitality, speeches and entertainment. Tom McCrone, Willie Craig, George Kelly, Bill Perry, Tom Davidson, Alex Kelly, Billy Spencer. Bro. Andy Millar DPGM headed a large deputation of 14 Brethern to Lodge Airdriie St. John No. 166 for the annual visitation to report on the workings of the Lodge. They were welcomed into the temple by Bro. 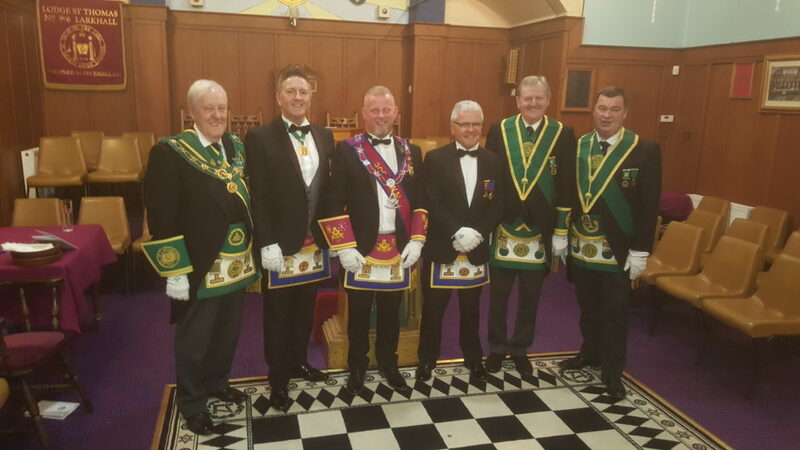 Craig Gibson RWM where they witnessed a very fine First Degree and enjoyed a most hospitable evening with the Brethren of Lodge Airdrie St. John No. 166. On Sunday evening, 18th March, the joint Annual Divine Service of Cambuslang Royal Arch Lodge No. 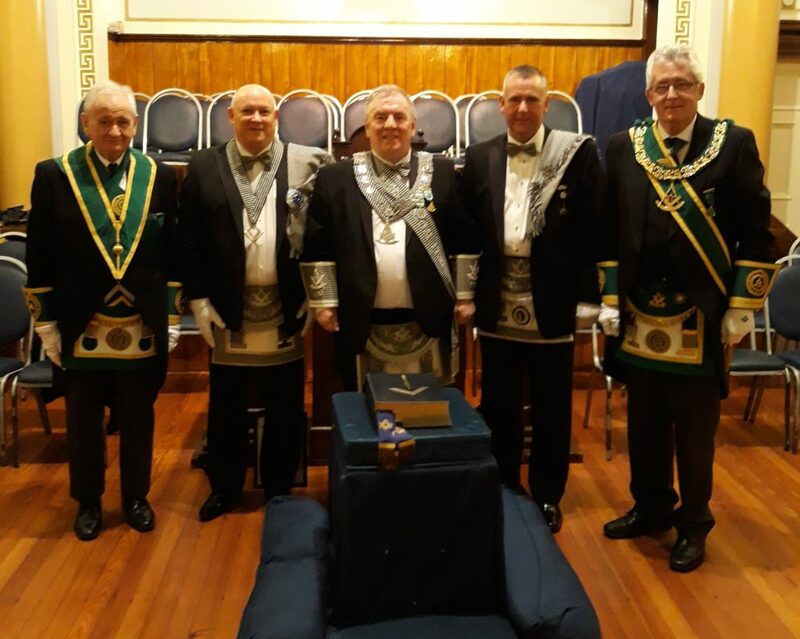 114 and Lodge Kirkhill No. 1230 was held in Tabernacle Lane, Cambuslang. The Service was once again conducted by Rev. Andrew Thomson who gave a warm welcome to everyone present. Bro. William Anderson RWM of 114 and Bro. Gordon Cassels RWM of 1230 also gave thanks to those in attendance and for the support of both Lodges. A large number of Brethren from PGL were present. 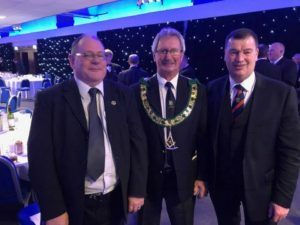 Craig Hamilton RWM 126, Bill Perry PGM, Gordon Cassels RWM 1230, Rev. Andrew Thomson, Willie Anderson RWM 114, Derek Stibbs RWM 1499. 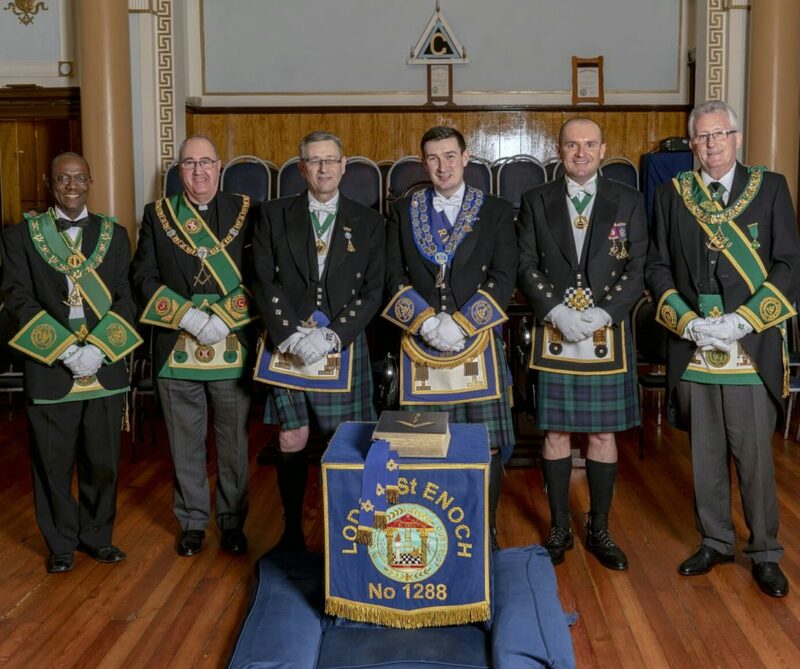 On Saturday 17th March, seven Brethren from the Province attended the Installation of the RWPGM and the Commissioned Office Bearers of the PGL of Renfrewshire West, held in Greenock Town Hall. Bro. 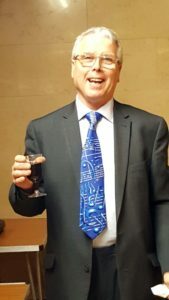 Robert McIntyre was Installed in fine fashion by IPDGM, Bro. W. Ramsay McGhee, assisted by Bro. Alexander Galbraith, PSGM and other Grand Lodge Office Bearers. The Ceremony of Installation being completed, the assembled Brethren enjoyed the dinner, hospitality and speeches. Tom McCrone, Tom Davidson, Bill Perry, George Kelly, Andrew Millar, Norman Carnegy. Billy Spencer. On a recent trip to Kansas, USA Bro. 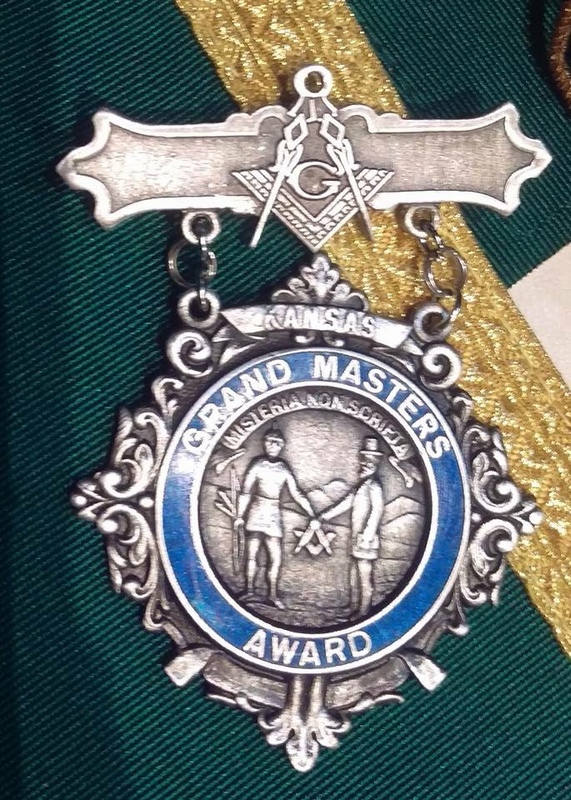 James Jack was presented with the Grand Masters Award by MW Grand Master, B. Cole Presley at the Grand Lodge of Kansas Installation, this was one of only two awarded. Bro. Jack had a long relationship with the Brethern in Kansas and this award was in recognition of this work developing the relationship, a great honour for Bro. 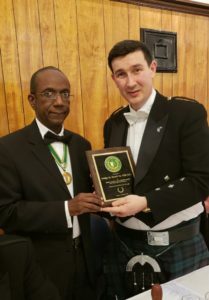 Jack and Scottish Freemasonry, well done from all at Provincial Grand Lodge forwarding the name of the Province in the US. On Friday 16th March Bro. Alan Graham RWM of Lodge Dura No. 1513 welcomed a Deputation from PGL to their special meeting to celebrate Bro. 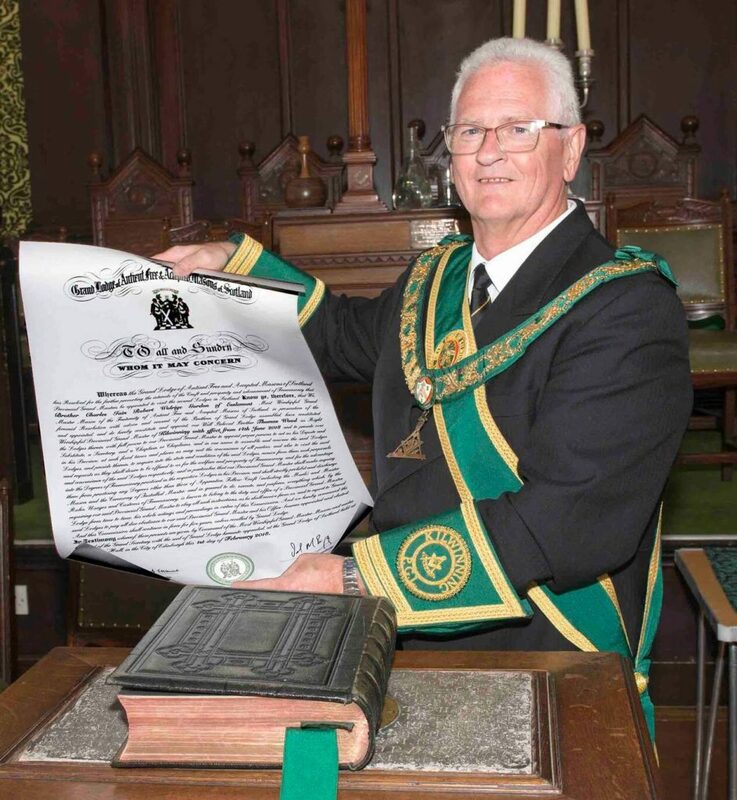 Jimmy Galloway’s 50 years in Freemasonry. The night was made more special when Jimmy acted as the Candidate and his Mother Lodge, Mauldslie Castle No. 1630 took part in the exemplification of the EA Degree. The Brethren of both Lodges did Bro. Galloway proud. Among the many visitors present was the RWM of Lodge Drummossie No. 1438, Bro. Archie MacLellan. The meeting closed and the Brethren enjoyed a fantastic buffet and hospitality. 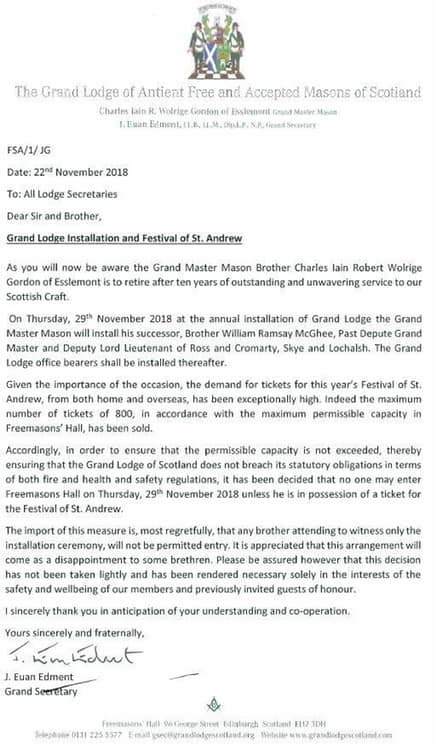 Dear Sir and Brother Secretary, On behalf of Brother Neil Fraser, Provincial Grand Master and the Office Bearers of the Provincial Grand Lodge of Renfrewshire East, I extend fraternal greetings to your Provincial Grand Master and Brethren. 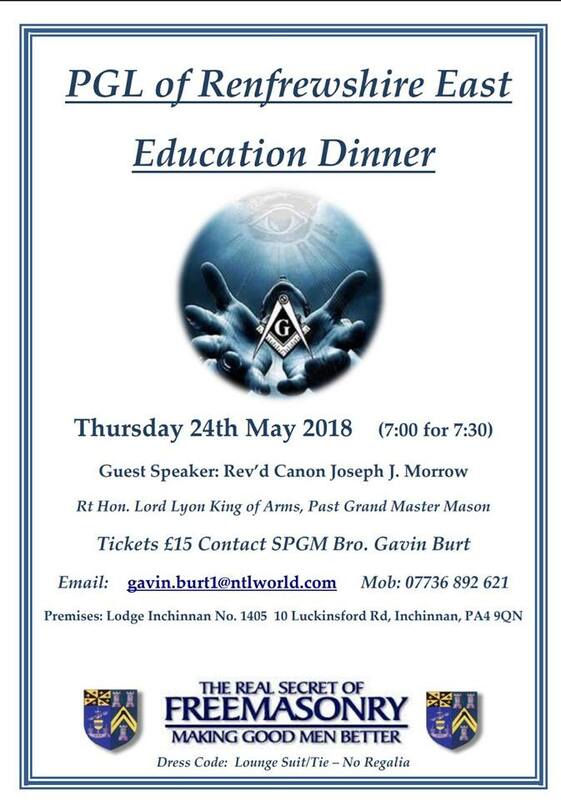 An invitation is extended to your Provincial Grand Master and Brethren to attend the Provincial Grand Lodge of Renfrewshire East Education Dinner. The details are attatched on the flyer below, its sure to be a great evening of education and entertainment. 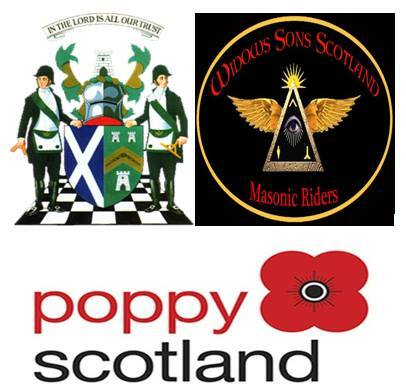 On Friday 9th March, the RWM of Lodge New Monkland Montrose No. 88, Bro. Kenny Mason welcomed a large Deputation from PGL to their special meeting. 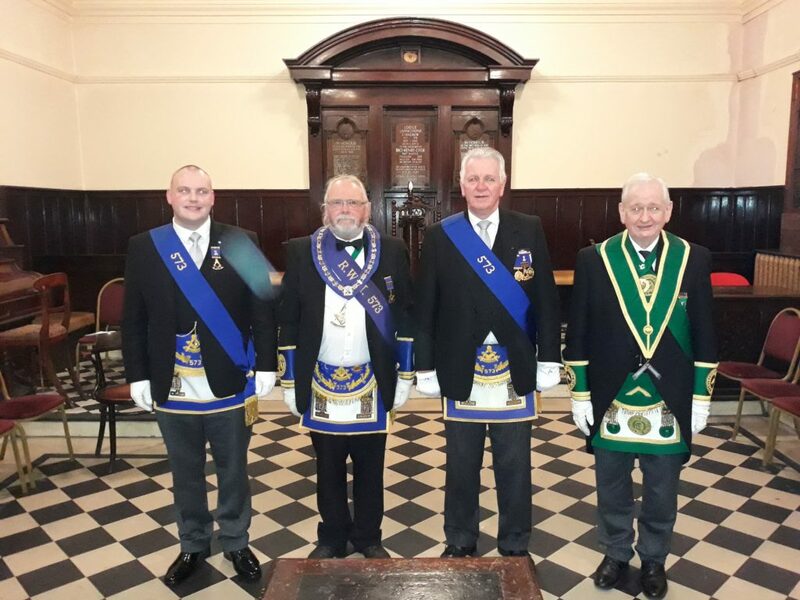 The Deputation included Bros. Bill Perry PGM, Stephen Campbell SPGM, Norman Carnegy SPGM, Willie Craig PG Sec, Jim Ferguson Senior PG Chaplain, Jim Vasey Junior PG Chaplain and Bobby McCormack. 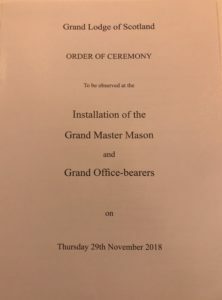 The reason for the visit was two fold, an EA Degree was being conferred by the PM’s of the Lodge and the Candidate was the RWM’s son, Martin Mason. The Degree Team being led by Bro. Ian McIndoe PM. Also, Bro. 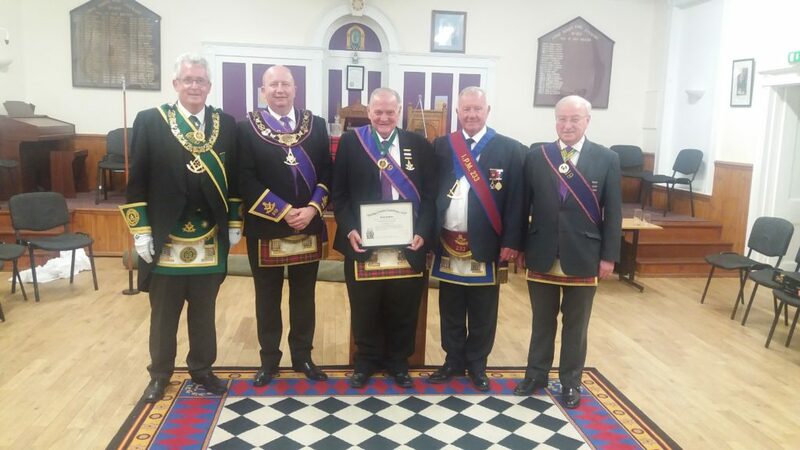 Tom Reid PM was awarded Distinguished Service Membership of the Lodge in recognition of the outstanding service to Lodge 88 for almost 45 years. A great night was had by the large number of Brethren who were in attendance and at the close of the Meeting, the Brethren enjoyed a fantastic buffet provide by Tom’s wife Margaret. 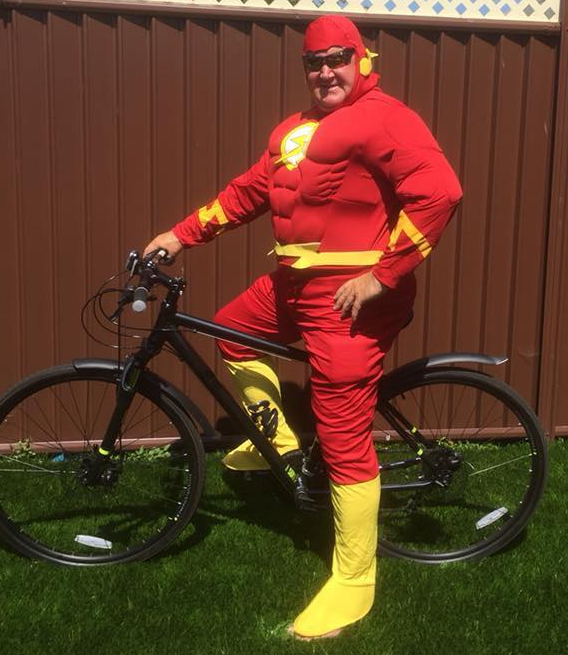 Provincial Grand Lodge would like to applaud the fundraining efforts of Lodge Airdrie St. John No. 166, on Wednesday 7th March they invited local charities to the Lodge to distribute monies raised throughout the year, presentations were made to the following deserving charites, Guide Dogs Scotland, St Andrew’s Hospice, Lanarkshire Cancer Care, Glasgow Children’s Charity, MND Scotland, Macmillan Cancer Support, Parkinson’s self Help Group, Meningitis Research foundation Scotland & Maggie’s Centre. At the Regular Meeting of Lodge Hamilton No. 233, IPM Bro. Alex Watson welcomed the Deputation from Provincial Grand Lodge on their Annual Visit. The large Deputation from Provincial Grand Lodge was headed by Bro. Alex Kelly SPGM. 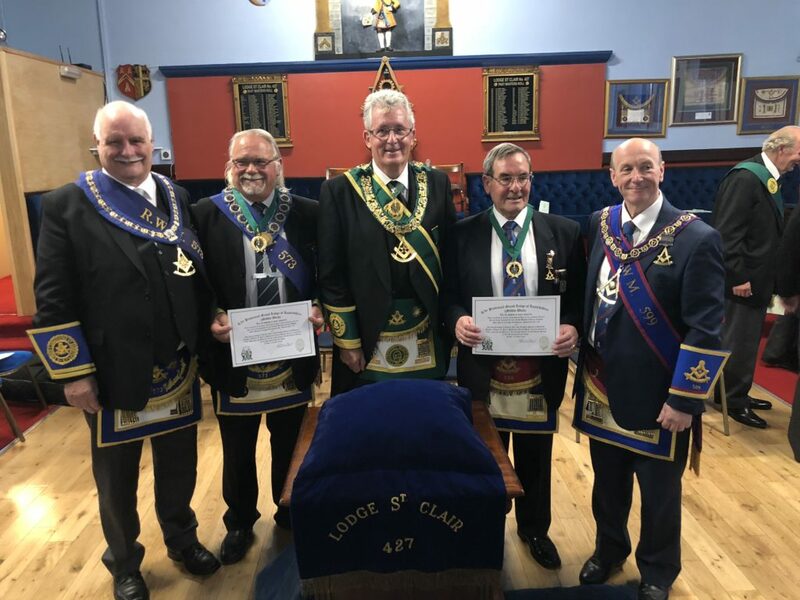 Following the PGL business and an excellent FC Degree by the Lodge Office Bearers, two Brethren were presented with Jubilee Certificates, to mark 50 years service to the Lodge and the Craft, Bro. Tom Gilmour PM and Bro. Ronnie Frew. The Lodge also made a special presentation to Bro. Billy Thomson PM in recognition of the 30 years he served as Lodge Secretary. At the close of the Meeting, the Brethren retired and enjoyed some 233 hospitality. At the Regular Meeting of Lodge Old Monkkland St James No. 177, RWM Bro. 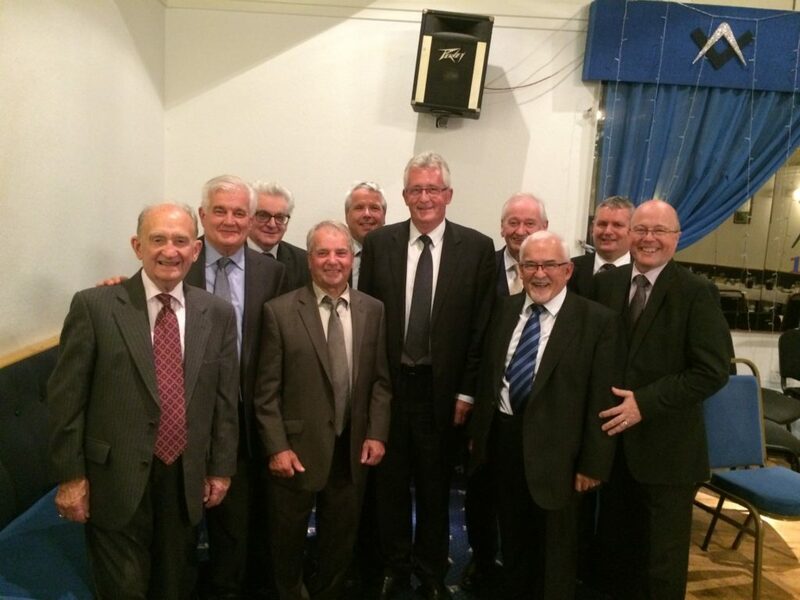 Graham Morrison welcomed the Deputation from Provincial Grand Lodge on their Annual Visit. The large Deputation from Provincial Grand Lodge was headed by Bro. Andy Millar DPGM. Following the PGL business an excellent EA Degree was performed by the Lodge Office Bearers who initiated their newest Entered Apprentice Bro. Mark Hunter in fine form. The Brethren then retired and enjoyed some 177 hospitality. Bro. Peter Murphy PM of Lodge Glasgow Star No. 219 and an Honorary Member of Lodge Griffin Gartcosh No. 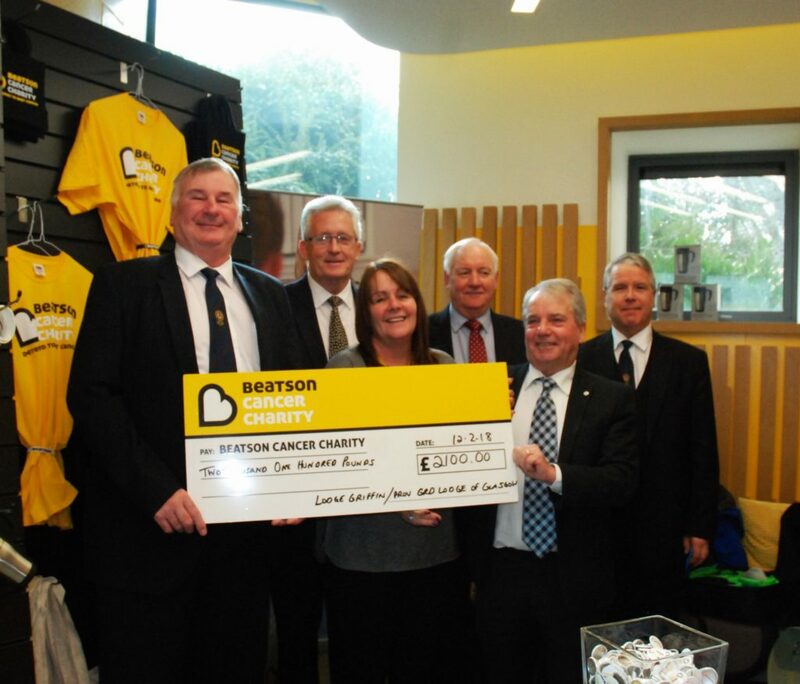 1254, raised a fantastic £1100 for the Beatson Hospital, a cheque was presented to the Beatson Hospital by Bro. Peter and others on Monday 12th February. 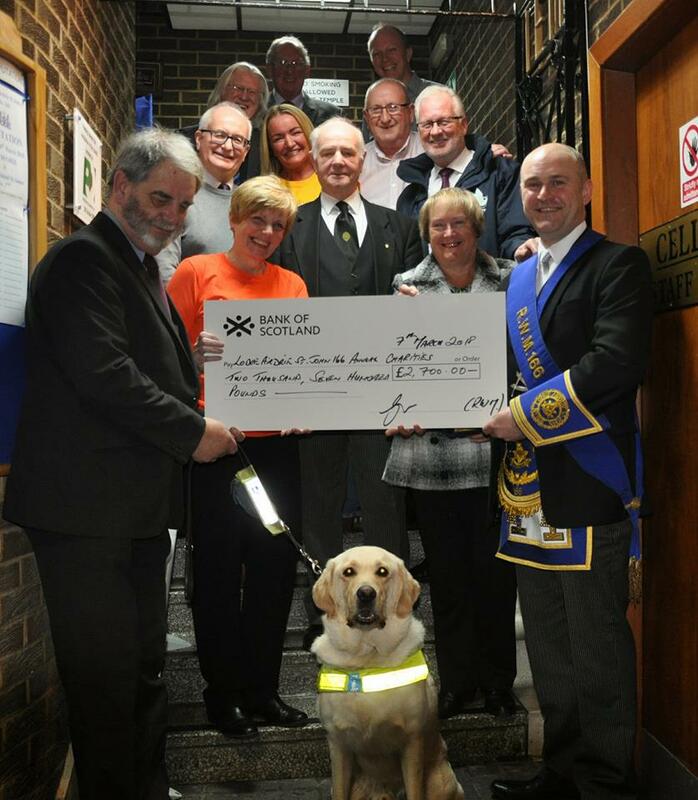 The PGL of Glasgow enhanced the donation by a further £1000 making the total presnted a massive £2100. Bro. 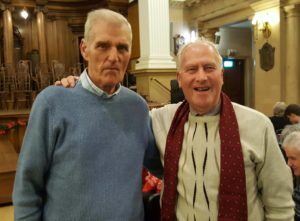 Murphy and Lodge Griffin raised the money by selling raffles on their meeting nights and Peter would like to thank all who gave so generously. This is the second time that Peter has donated to the Beatson, two years ago he gave £1600 to the Hospital. The PGL of Lanarkshire Middle Ward warmly congratulate Bro. Murphy, Lodge Griffin, the PGM Bro. Jim Peddie and the PGL of Glasgow for their fantastic support of the Beatson Hospital. 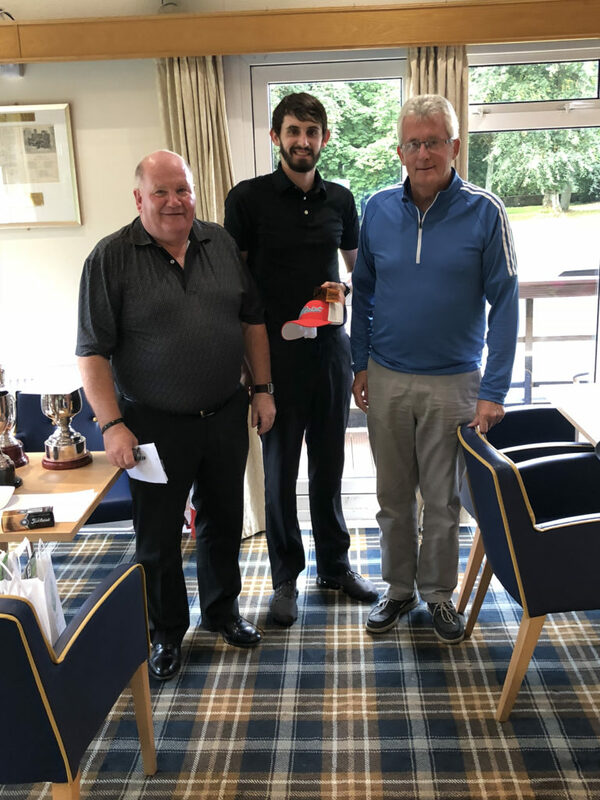 Once again this year the competition will be held on a single day at Drumpellier Golf Club, Coatbridge, to which we are grateful to the Club and thier Commitee for the use of the course and facilites. 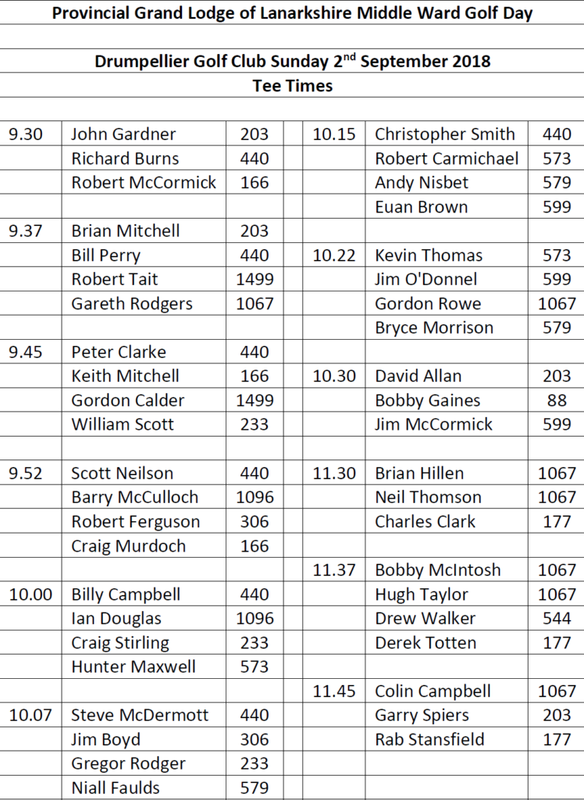 The Tee off times will be from 9.30am till 10.30am. 32 players, then 11.30am. and 12.30pm. 32 players. All the competitions are being played over 18 holes, Stableford play (3/4 handicap) with a maximum gross handicap of 24. Meals will be available and arrangements can be made on the day direct with the Club. As the number of participants is strictly restricted to 64, applications should be made for teams of three players although additional individual applications from the same Lodge will be accepted. If the competition is over subscribed a ballot will take place after which Lodges will be advised of the tee off times of the various members. As the draw will be made when some Lodges are in recess it would be helpful if entrants could nominate a single contact when there is more than one entry. 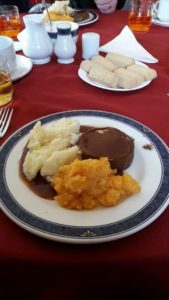 The 2018 Burns Supper was held at the Marcus Humphrey House, Bridge of Weir. This year, the PGL of Lanarkshire Middle Ward were asked to provide the speakers and entertainment. It was planned for Sunday 21st January but due to the snow it was postponed till today. Tommy Reid – Accordion with Scottish melodies. They were accompanied by Bro. Bill Perry RWPGM, Willie Craig PGL Sec, Ian McGown PGL Almoner, Bro Eric McPhee RWM of Lodge St. Thomas No. 306, Bro. Allan McPhail Almoner, David Bloomfield (Kilwinning), Charlie Nicholson and Alic Currie (Renfrewshire). As expected, the Burns Supper was a great success, enjoyed by the residents and staff. We were also treated to a lovely lunch provided by the staff. Well done to Bobby Ferguson and Tom Reid who organised the event on behalf of the Friends Group. Bobby has communicated that he would like to thank the artistes for their participation and a special thanks to Wilma and all her staff at the home for help in preparing the food, dressing the tables and serving the meals. On Wednesday 7th February Bro. Bill Perry PGM, Bro. Willie Craig PG Secretary, accompanied Rev. 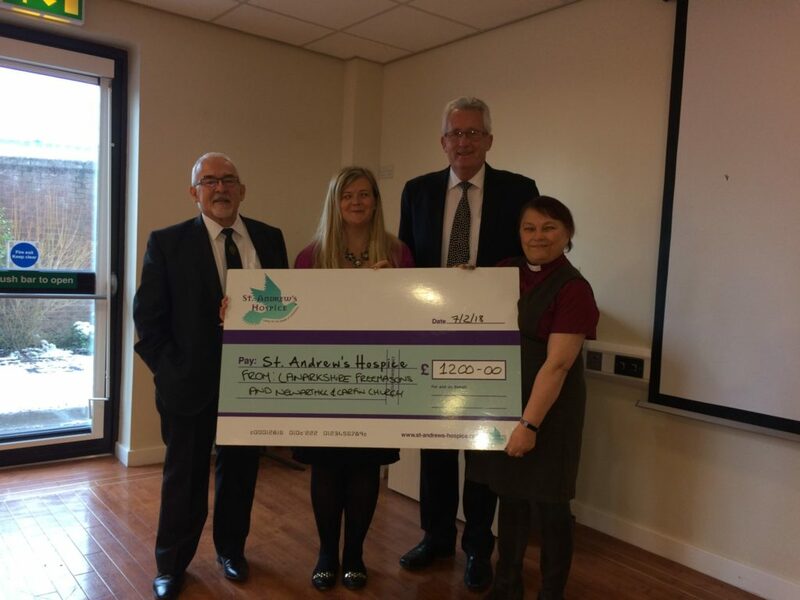 Elaine McKinnon, the Minister of Newarthill and Carfin Parish Church to St. Andrew’s Hospice, Airdrie to meet with Louise O’Donnell and to present a cheque for £1200.00. This cheque represents the donations from the various Masonic Orders of Lanarkshire Freemasons who participated in the Xmas Carol Service which was held in Newarthill and Carfin Church. Rev. 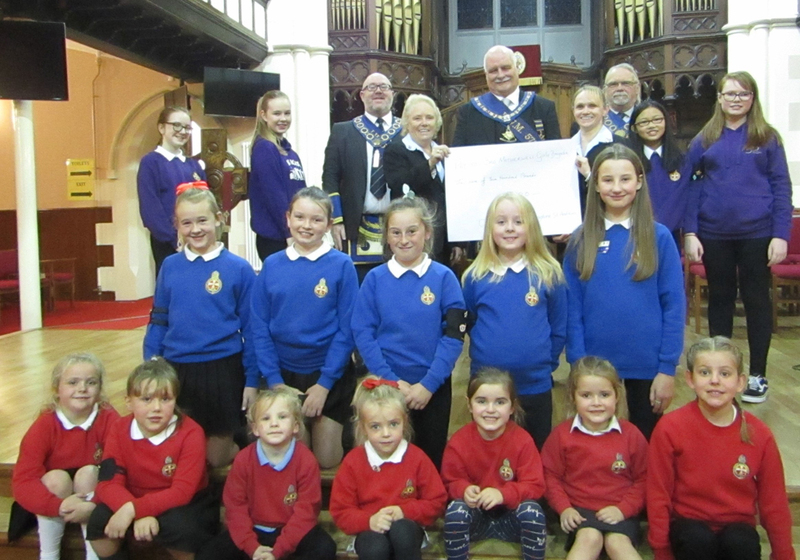 McKinnon and her Church have given generously to the Hospice over a long period and Provincial Grand Lodge were delighted to support her nomination and to donate the sum raised to the Hospice. 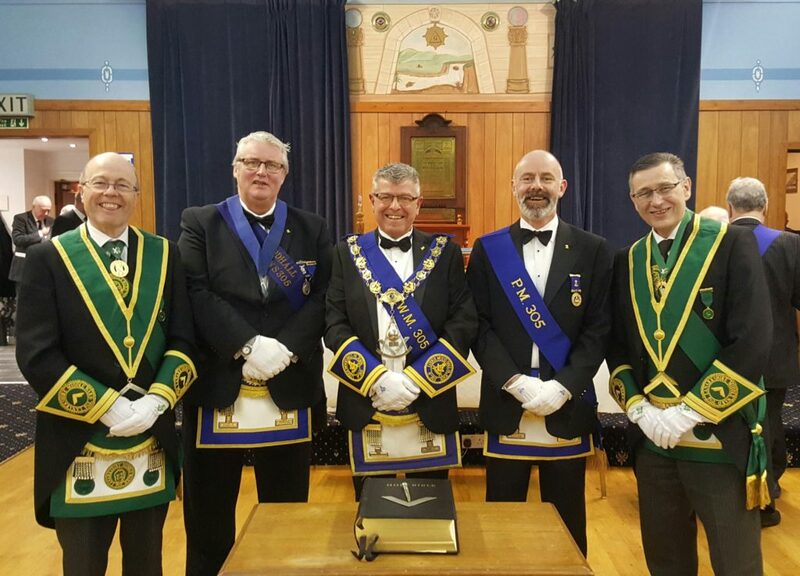 Bros. George R Kelly PPGM, Tom Davidson IPPGM and Tom McCrone PG DOC were part of a Grand Lodge deputation that travelled to Comrie for the celebrations of the 200th anniversary of Lodge St. Kessac No.269 in the White Church Community Centre. There they met a large deputation from Lodge Old Monkland St. James No.177 who were there to support the lodge and join in the celebrations. Support from within PGL Lanarkshire Middle Ward was further enhanced by Bro. Bobby Edwards PM (Lodge Buchanan No.1499) who was the organist for the ceremonial. At the regular communication of Grand Lodge on Thursday 1st February, the Grand Master Mason announced that Bro. J. Euan Edment, Past Master of Lodge St. John, Carluke No. 187 would be appointed Grand Secretary of the Grand Lodge of Scotland, commencing in June. Bro. 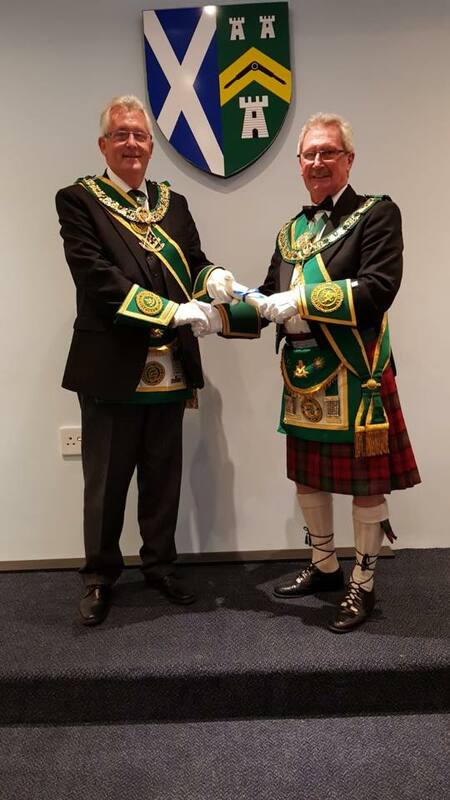 Edment is well known, respected and admired by the Brethren of our Province and we wish him great success and happiness in this most important role in the Scottish Craft. On Saturday, 27th January 2018, Bro. George R. Kelly PPGM & Bro. 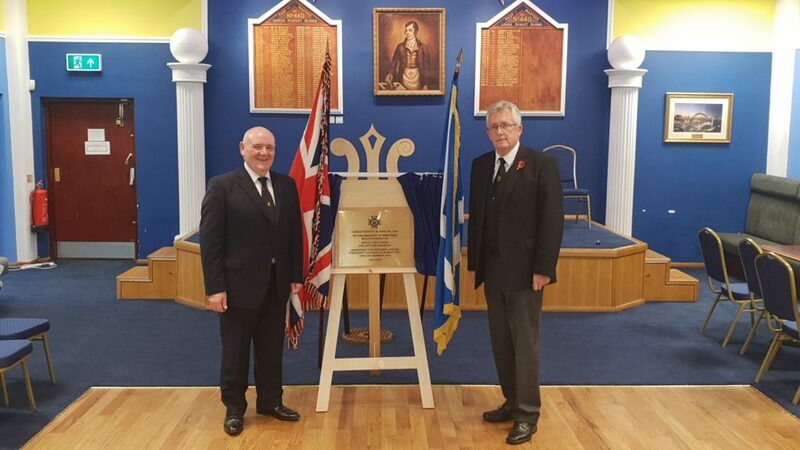 Alex Kelly SPGM headed a deputation to the Annual Communication and Installation of Elected Office Bearers of the Provincial Grand Lodge of Renfrewshire East which took place within the Lodge Union & Crown Temple, Cochrane Street, Barrhead. The Provincial Grand Lodge meeting was closed and all brethren adjourned where an excellent meal was enjoyed by all followed by the relevant toasts and replies. On Saturday,27th January 2018, Bro. Andrew Millar DPGM & Bro. 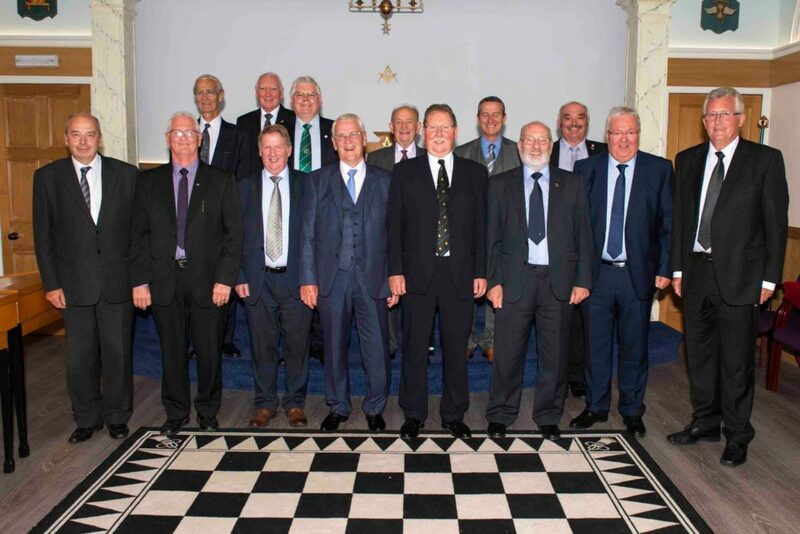 Norman Carnegy SPGM headed a deputation to the Annual Communication and Installation of Elected Office Bearers of the Provincial Grand L:odge of Dunbartonshire which took place within the Masonic Temple, Church Street, Dumbarton. The Provincial Grand Master Bro James Forrest upon opening the meeting expressed his delight at the large number of brethren in attendance and thereafter Provincial Grand Director of Ceremonies Bro James W Clarkson introduced a large deputation from sister provinces headed by the Provincial Grand Master of Dumfriesshire Bro Robert A.G. Hughes. Pleasantries having been exchanged and regular business conducted the elected office bearers were then installed into office by Provincial Grand Master Bro Forrest. The next item of business was to present Bro James McColl, Past Master Lodge Leven St John No 170 with a Past Provincial Senior Grand Warden Jewel. Bro McColl was congratulated on his excellent record of service to Provincial Grand Lodge to which he made suitable reply. 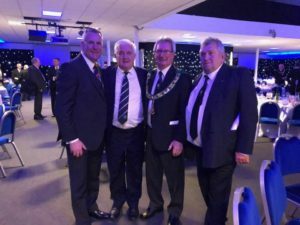 After Provincial Grand Master Bro Hughes had addressed Provincial Grand Lodge the meeting was closed and all brethren adjourned to the function suite where an excellent meal was enjoyed by all followed by the relevant toasts and replies. Bro. 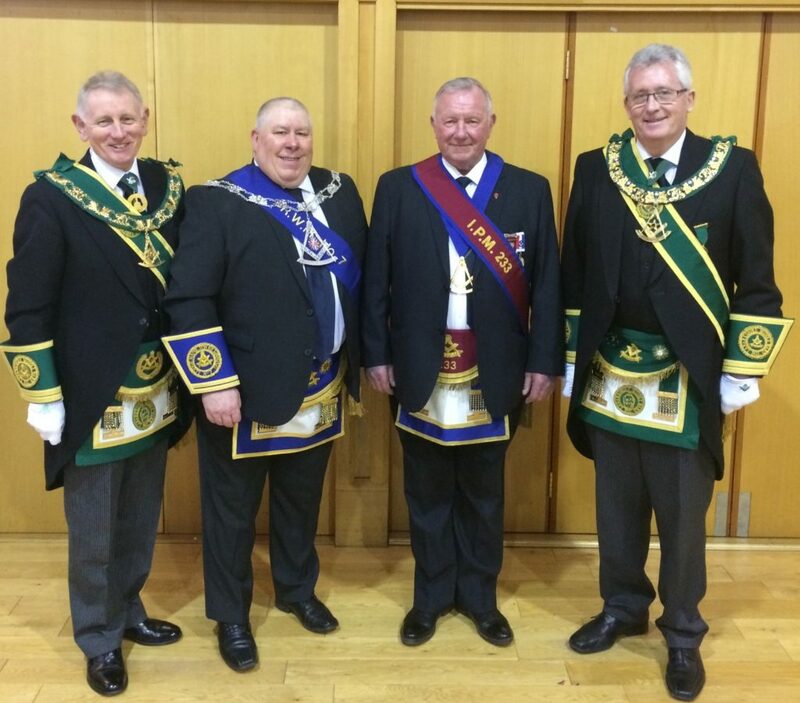 Douglas Walls RWM was installed on Saturday 26th January at the Masonic Temple, Gardenside Street, Uddingston. The Installing Masters were Bro. Gordon Mather PM & Bro. David McMorris PM, who carried out their duties to the highest of standards. Bro. 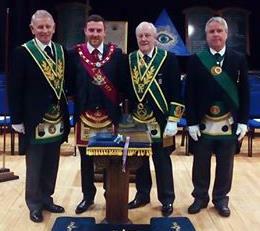 Angus Ross SPGM led the Deputation from Provincial Grand Lodge accompanied by Bro. Bill Perry PGM. 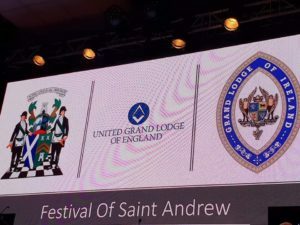 Recognition that every Freemason in Scotland should be proud off, well done. 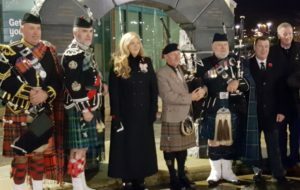 On Thursday 25th January 2018, Prestonfield House Hotel welcomed about 350 guests to their annual Prestonfield’s Burns Supper in aid of Prostate Scotland a charity which they have supported for the last ten years. Robert Wilson, Chairman of Prostate Scotland addressed the guests and thanked them for their attendance at the event and their ongoing support throughout the year. 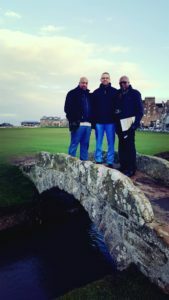 He then announced that the Trustees of Prostate Scotland wished to recognise the contribution supporters have made which has allowed the charity to flourish and reach out to support men with Prostate disease. 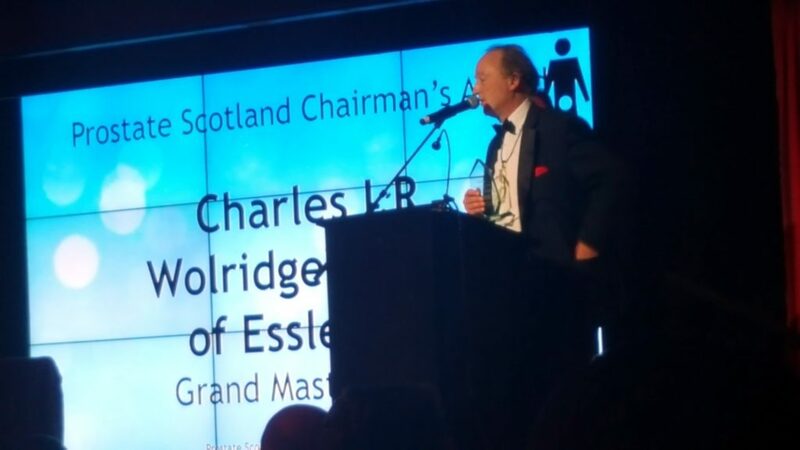 This recognition would be in the form of The Prostate Scotland Chairman’s Award and that he was proud to announce that the inaugural award was to Charles Iain Robert Wolrige Gordon of Esslemont, Most Worshipful Grand Master Mason, in recognition of the tremendous support the charity had received from the Freemasons of Scotland who had now raised over £400,000 for the charity since it was nominated by the Grand Master Mason. The chairman went on to mention the various types of fundraising event that had contributed to this massive amount including cycle rides, walking on hot coals, sponsored walks and in particular the zipslide over the River Clyde in Glasgow organised by the PGLs in the West of Scotland and supported by other PGLs across the country. 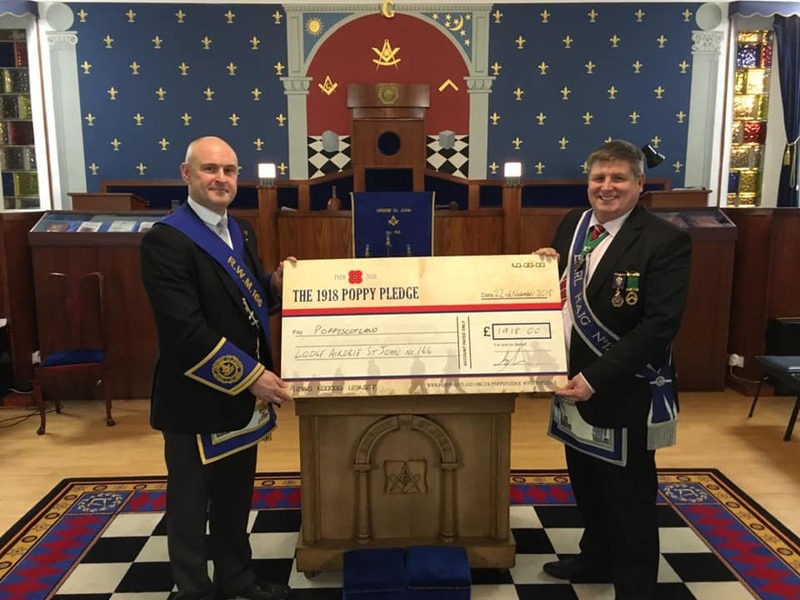 The Most Worshipful Grand Master Mason accepted the award on behalf of the freemasons of Scotland and said that the success of the fundraising had been down to a combination of individual brethren and provinces taking ownership of the appeal and working with Prostate Scotland. He congratulated and thanked all the brethren who had participate and committed support for Prostate Scotland until the year 2020. 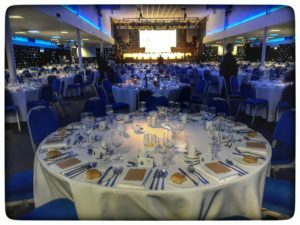 Everyone enjoyed a great evening’s entertainment which concluded in a charity auction. Between the raffle and the charity auction an amount in excess of £22,000 was raised on the evening. Bro. Robert Johnstone RWM was installed on Saturday 13th January. The Installing Masters were Bro. Donald Mathieson PM, Bro. Gavin Ferguson PM and Bro. Jim Gemmell PM, who carried out their duties to the highest of standards. Bro. 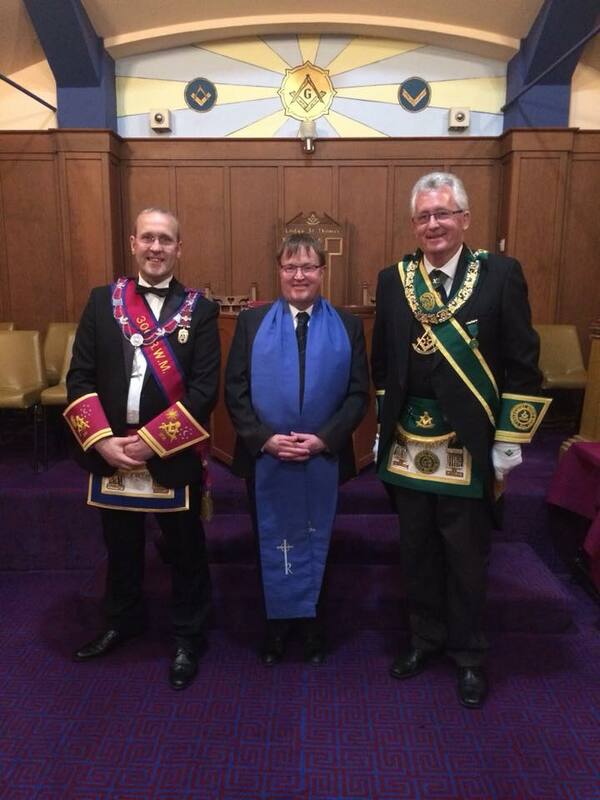 Angus Ross SPGM led the Deputation from Provincial Grand Lodge accompanied by Bro. Bill Perry PGM.